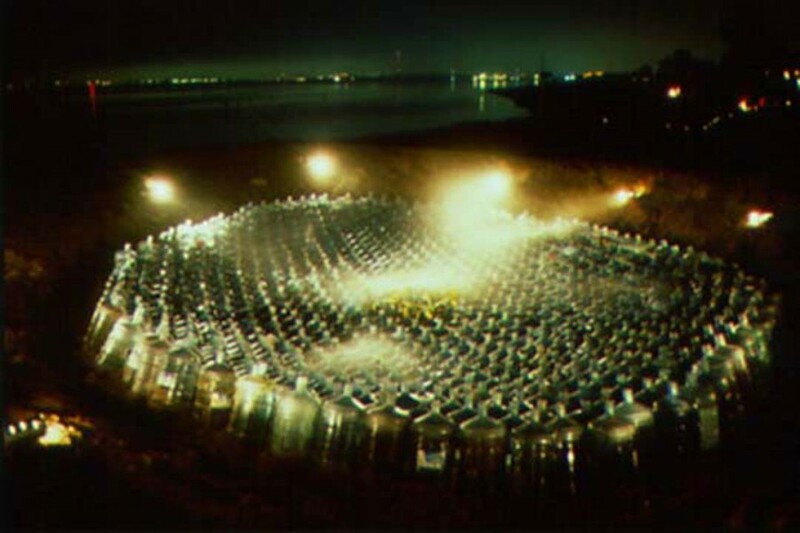 The project title Compound Sight, refers to insect eyes where a variety of lenses make up single a “compound eye”. 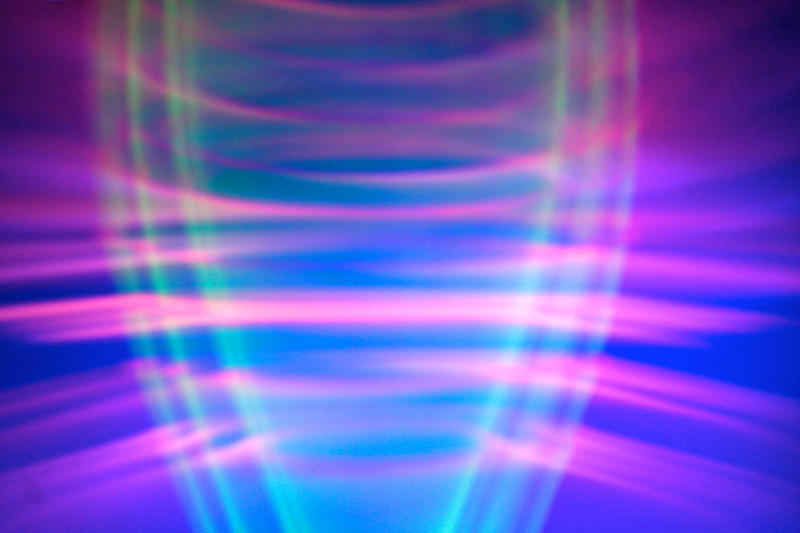 There are many ways to see, and we all see in unique ways and focus on things from our own perspective. 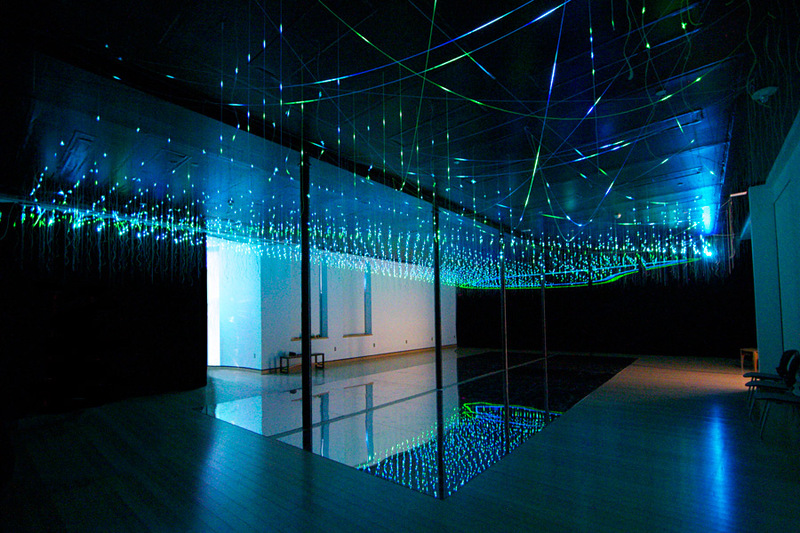 It also refers to the nature of the co-laboratory wherein the artwork is housed. 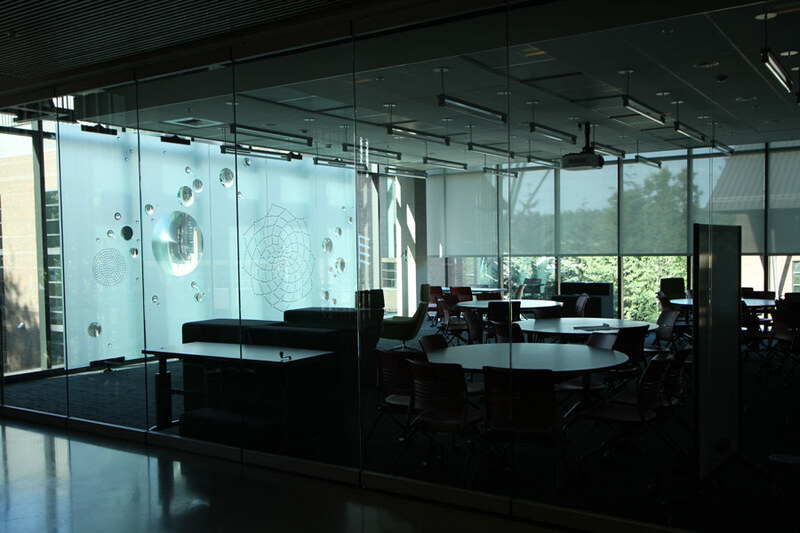 In the co-laboratory, students are encouraged to collaborate and “mix”, deeply observe and explore. 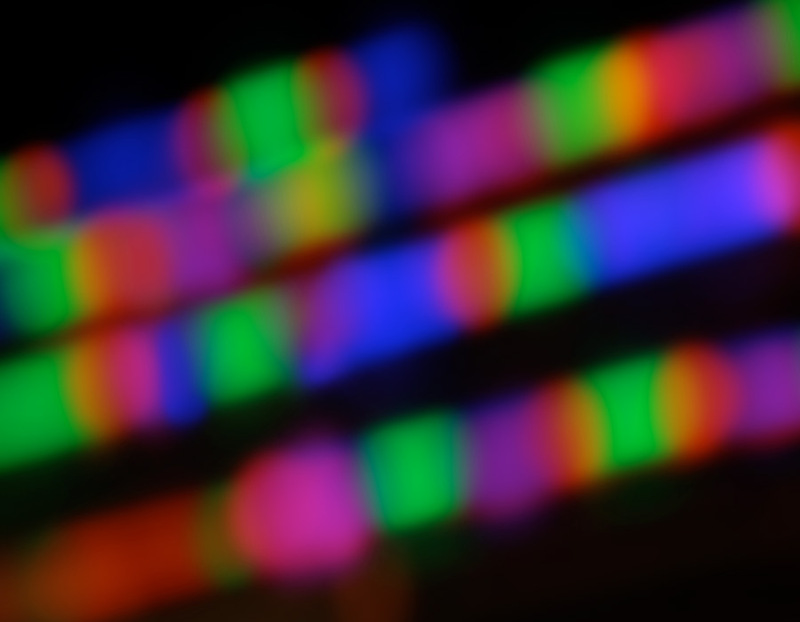 Hopefully encouragement from multiple lenses will stimulate thought, interaction and foster an alternate and creative perspective to reveal itself. 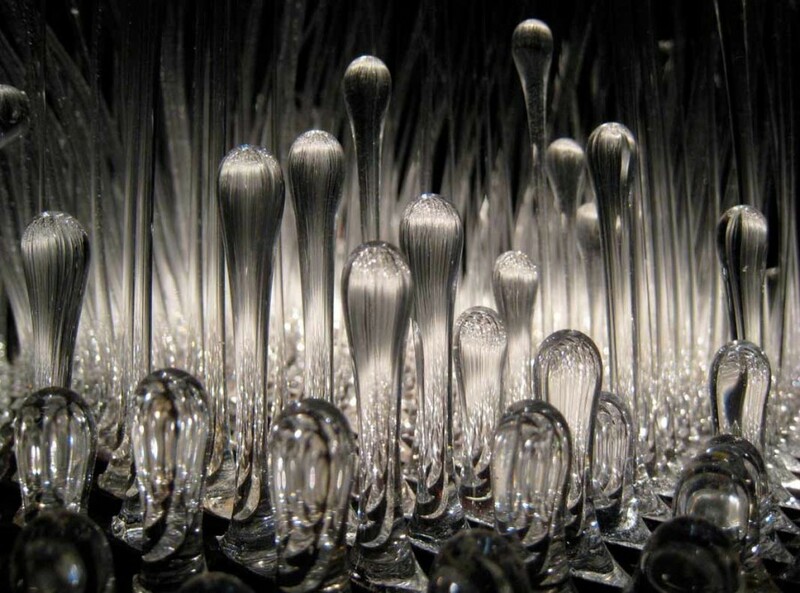 Perhaps like the nature of a compound eye, many images combine into a singular vision. 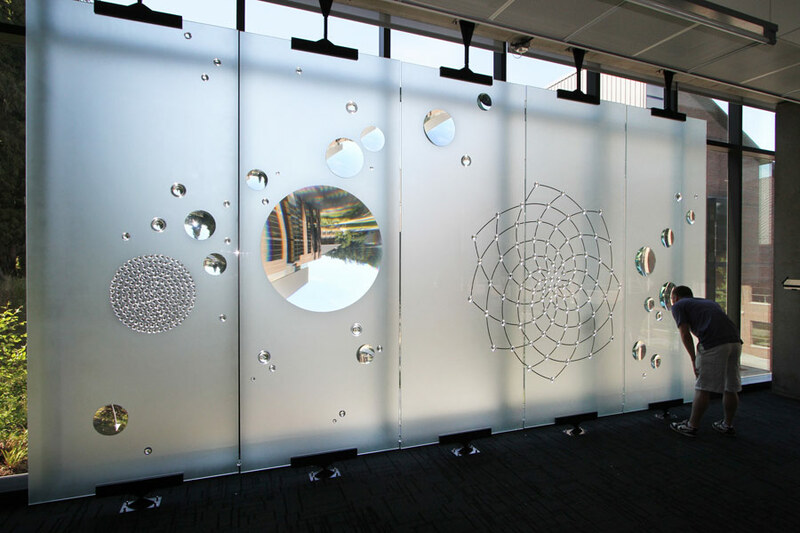 The project is designed to draw your eye away from the white frosted glass and direct it to the many lenses in the project. 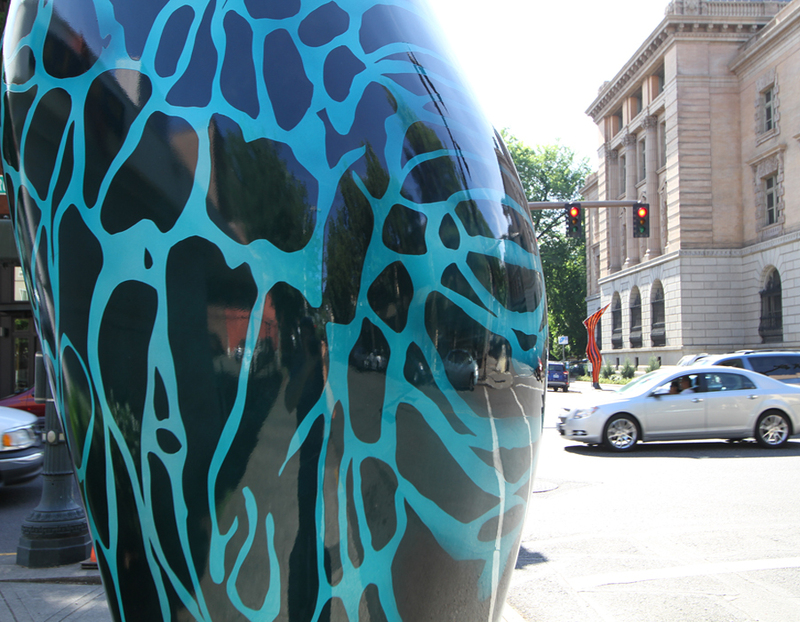 As the outside conditions change and movement happens, this image will be inverted and visible from the inside. 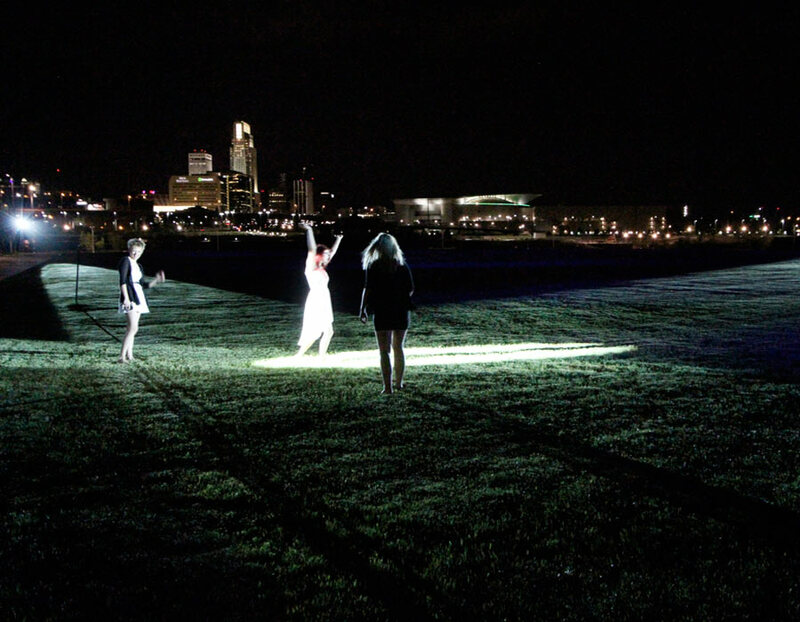 Different distances and perspectives on the piece will provide different views and experiences. 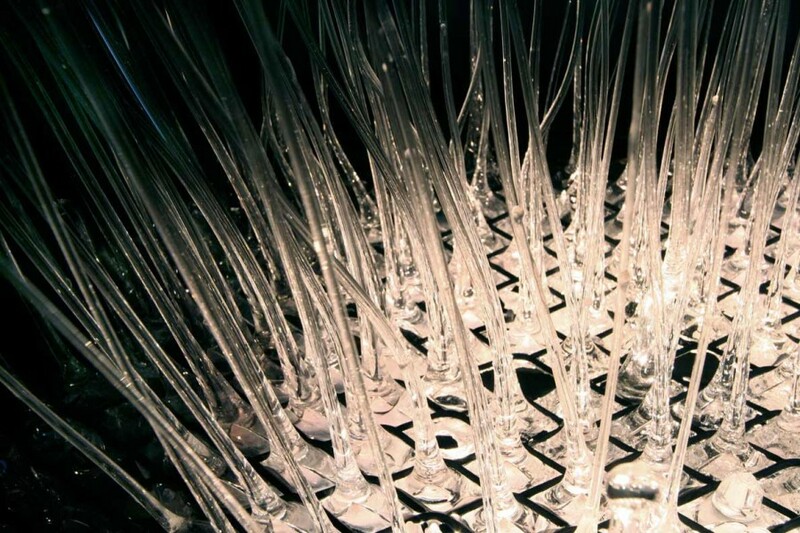 Due to the optics of the lenses, this becomes a passive kinetic piece without any moving parts. 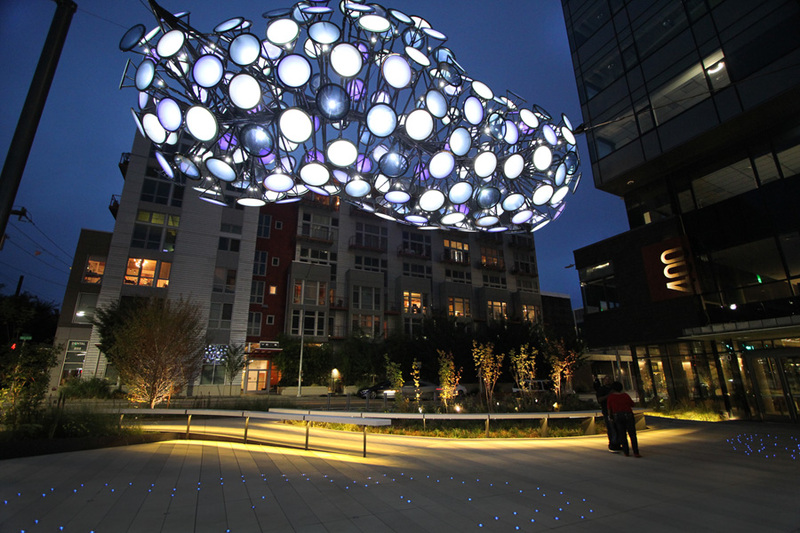 Special thanks to Peter David Studio (glass fabrication), Swenson Say Faget (engineering), Metalistics (steel fabrication and installation), Cascade Glass (glass installation), Washington State Arts Commission (Commissioning agency and PM), THA Architecture Inc. (architecture), and of course to University of Washington Bothell. 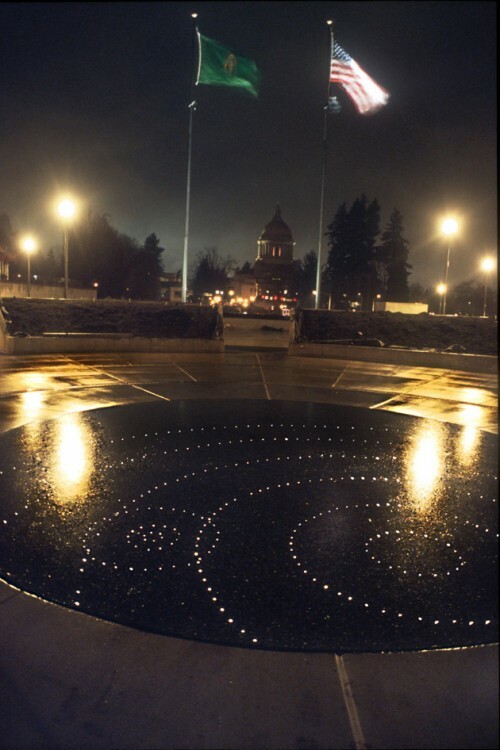 The radiating concentric rings of LED solar lighting are defined in numbers by the Fibonacci sequence and conjure patterns of radiating light, echoes and raindrops. 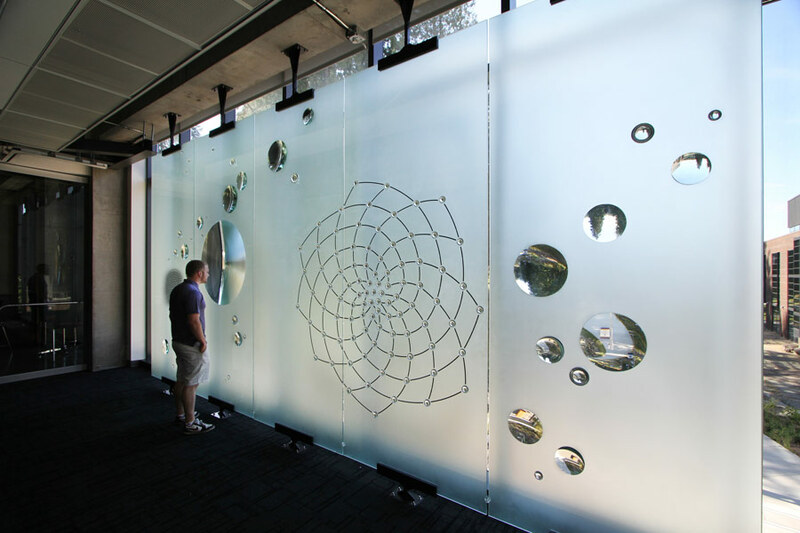 The Fibonacci sequence (a pattern of numbers where a number is found by adding up the two numbers before it) is represented in the architecture of Discovery Hall, but is also found in many natural patterns including spiral galaxies, sunflower seed growth patterns, the chambered nautilus and many other forms of nature. 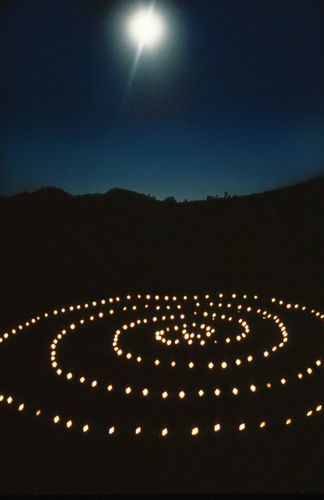 242 solar LED lights make up the radiating concentric rings that are defined in numbers by the Fibonacci sequence and conjure for me the patterns of radiating light, echoes and raindrops. 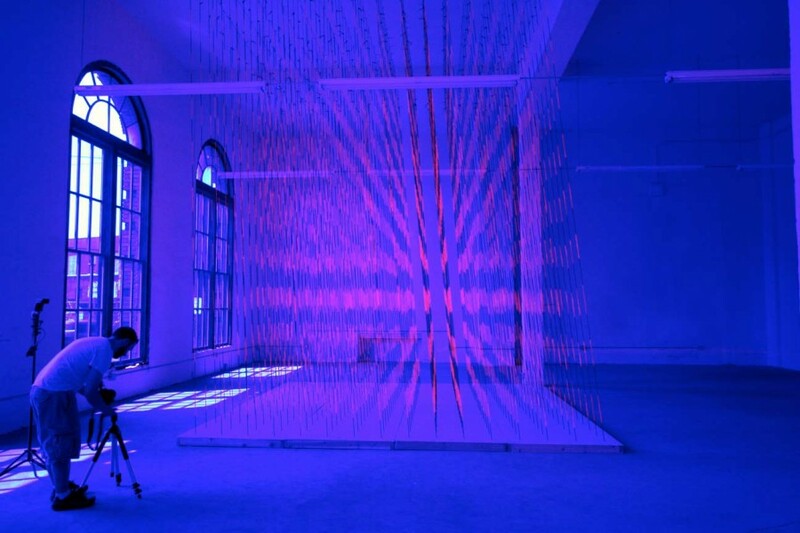 This sequence and the use of light conceptually and physically unify the 2 projects. 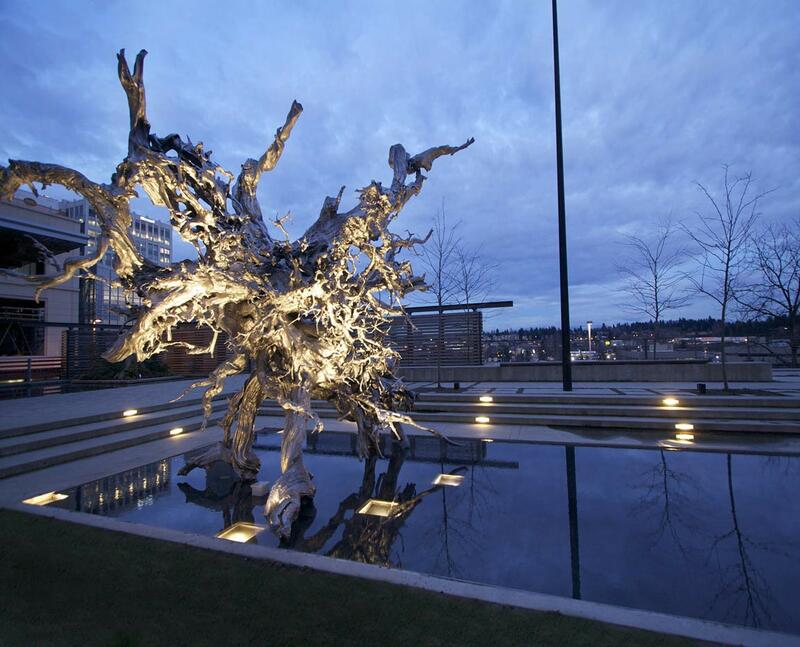 Like its namesake, these sculptural forms appear to appear out of mist and light. 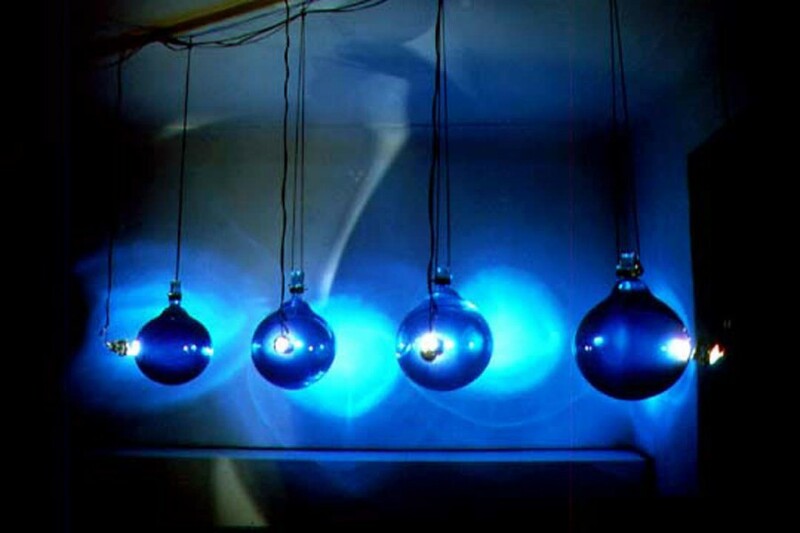 Blue lasers enter the glass vessels holding a dye infused water capturing and bringing form to undulating veils of light. 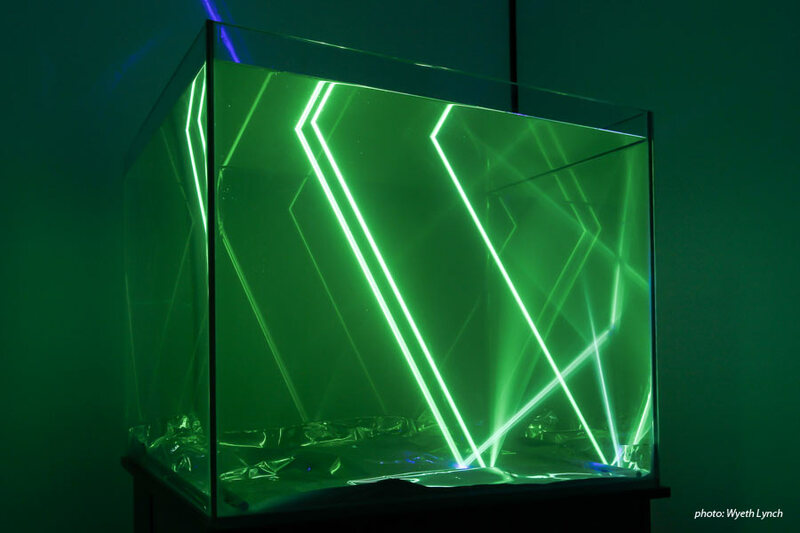 Distortions of the optics of the glass, and crinkled mylar send secondary bounces throughout the pieces further animating the optical geode. 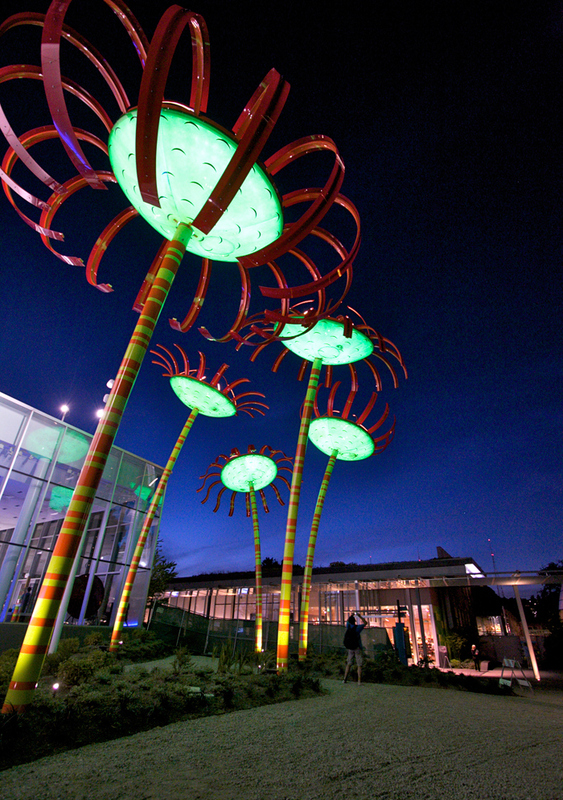 SONIC BLOOM, 2013, Pacific Science Center, Seattle Center, Seattle WA. 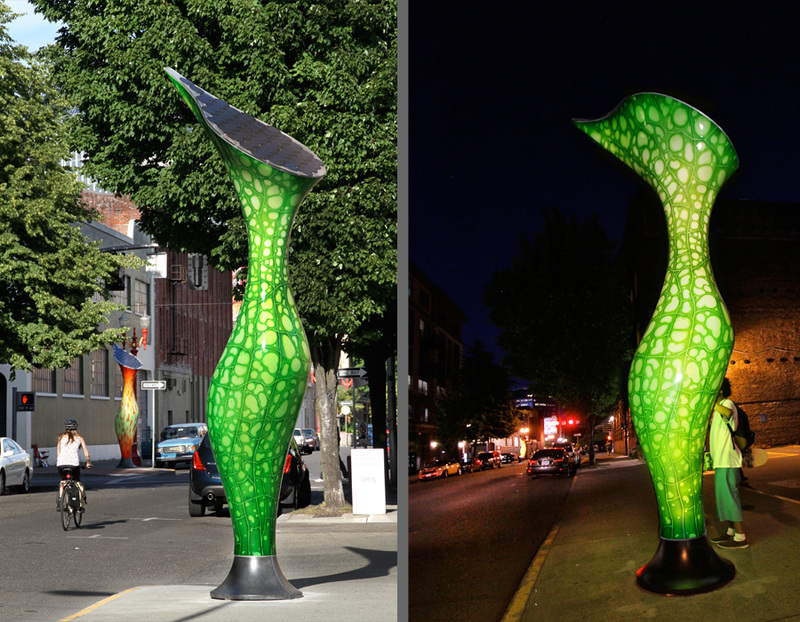 Commissioned by the Pacific Science Center and Seattle City Light’s Green Up Program. 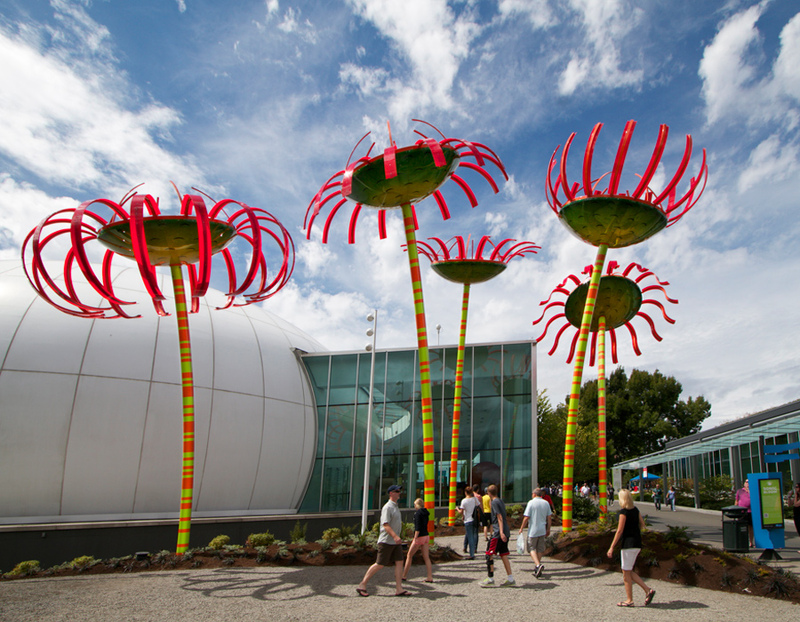 5 flowers: 20’ diameter and up to 40’ tall. 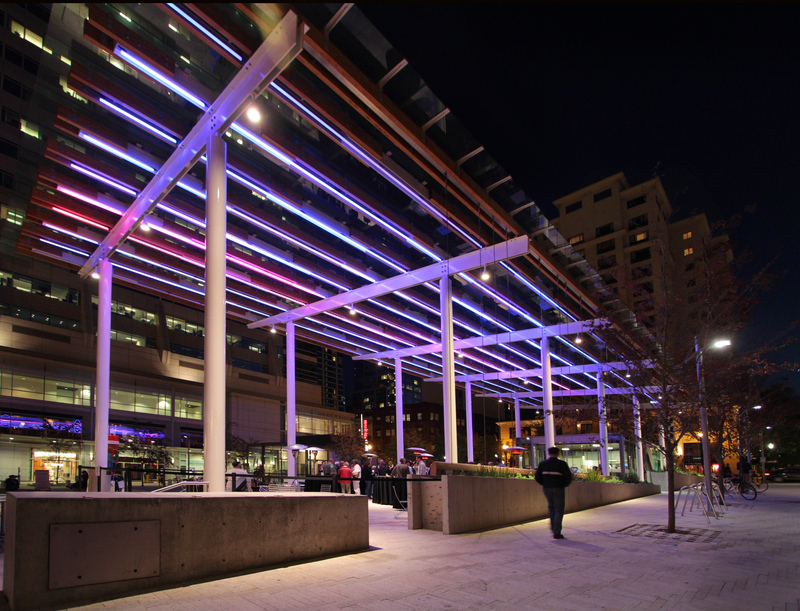 Steel, fiberglass, custom photo voltaic cells, LEDs, sensors, interactive sound system and energy data monitoring. 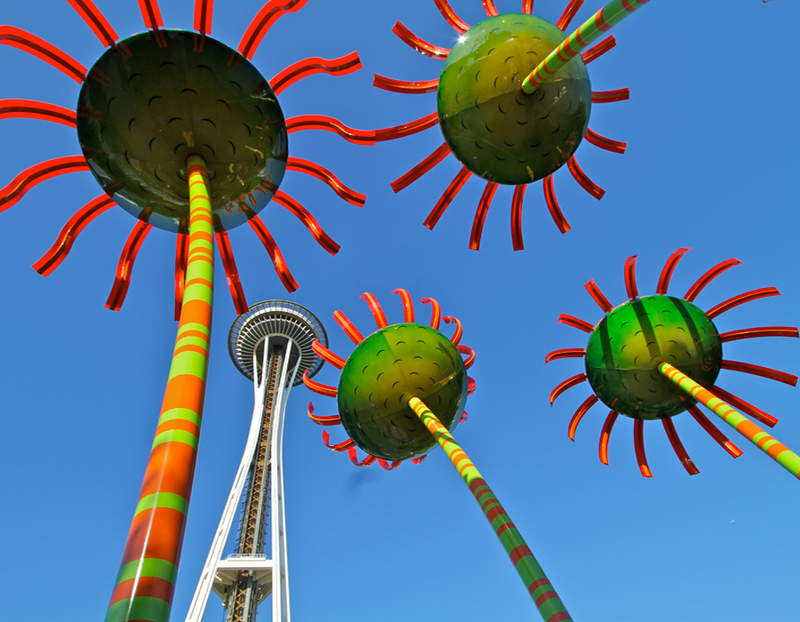 At the foot of Seattle’s Space Needle and a defining entry sculpture to the Pacific Science Center. 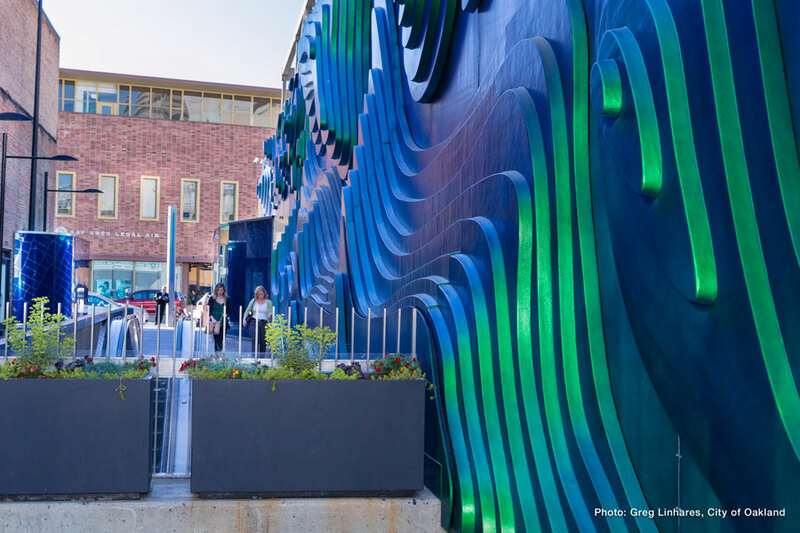 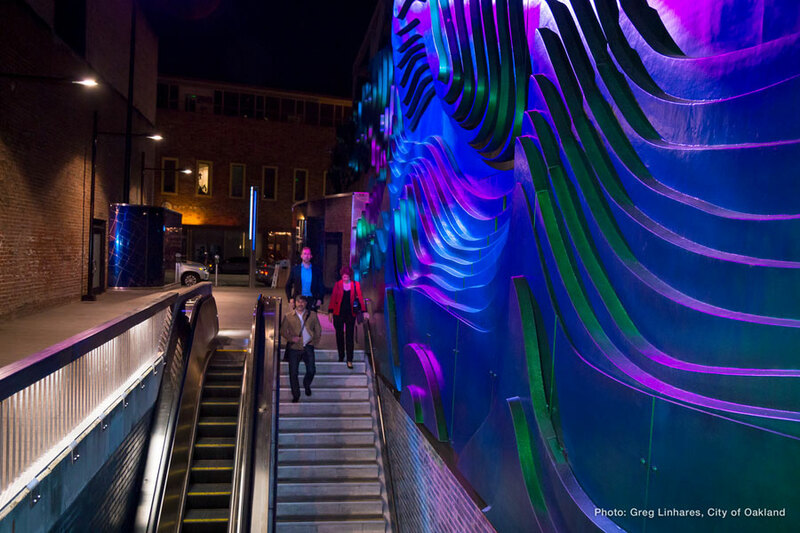 The project was conceived as a dynamic and educational focal piece that would extend the Science Center’s education outside of their buildings while engaging the public with an iconic artwork prompting curiosity and interactivity both during the day and night. 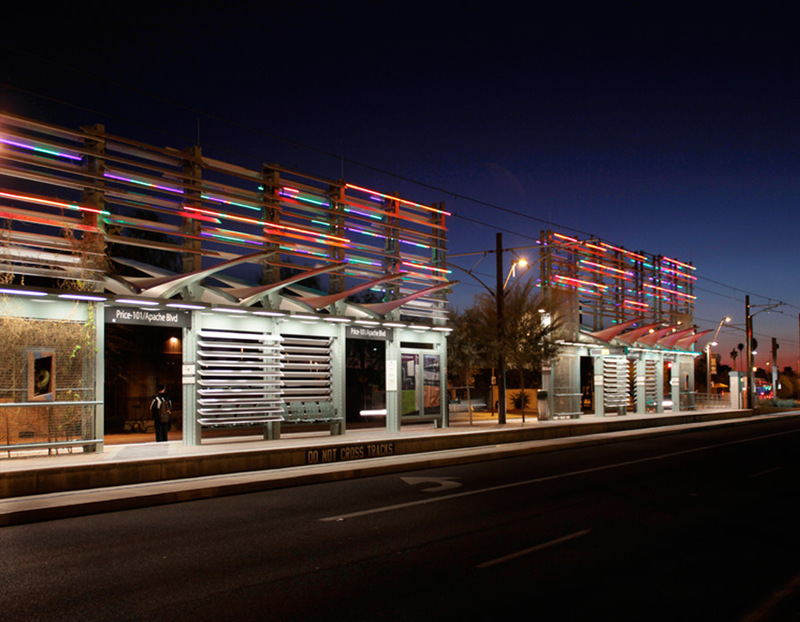 16.5′ h x 4′ x 5.6’w Fiberglass, steel, photovoltaic panels, LEDs, acrylic, GFRC, steel, paint, batteries, electronics. 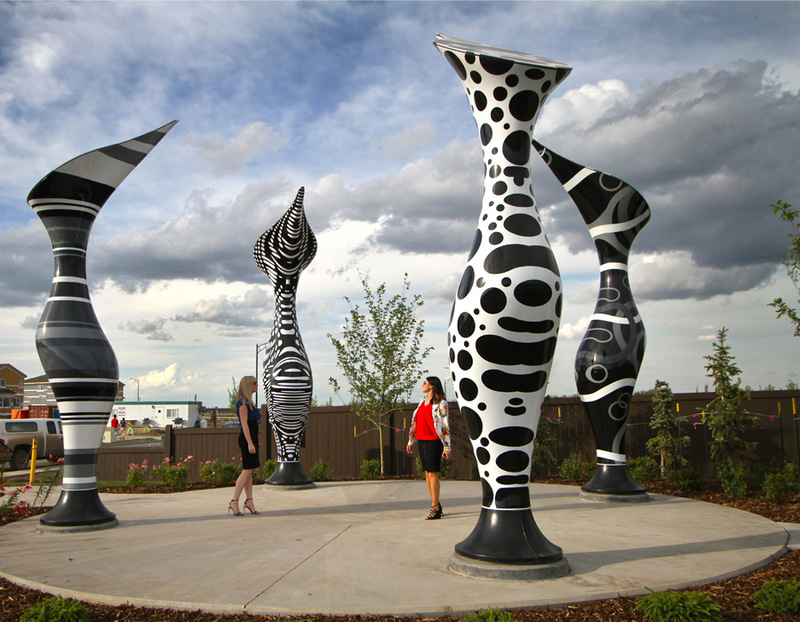 The name of the pieces are “Nepenthes.” The name is derived from a Greek magical potion that would cause the drinker to be relieved from or induce forgetfulness of pain, grief, or sorrow. 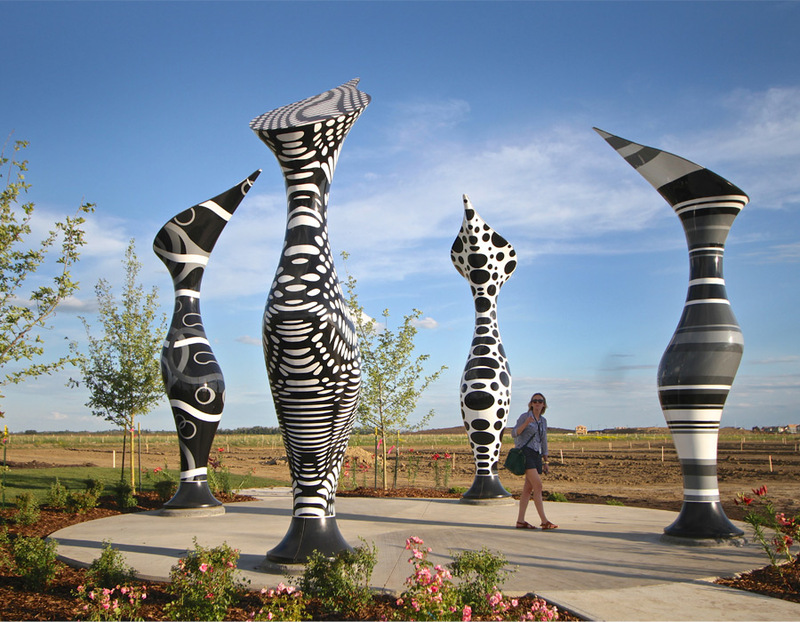 I hope these sculptures might provide a brief respite from a hectic daily life, transporting us briefly somewhere else. 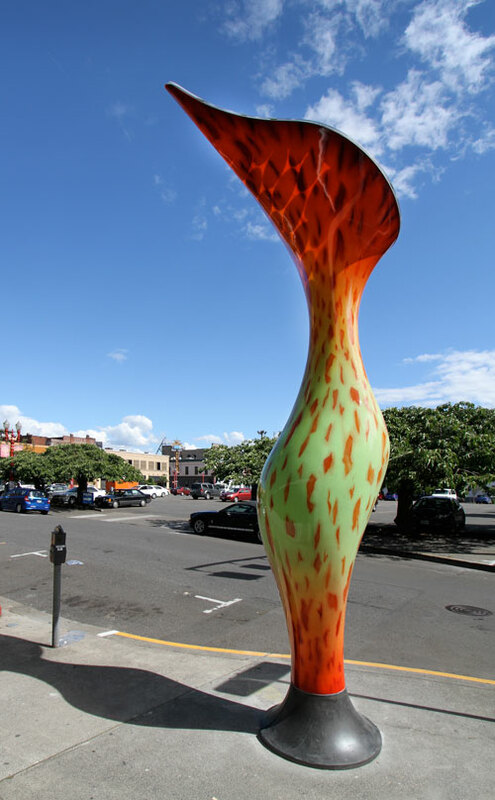 Nepenthes is also the name of a family of Carnivorous plants. 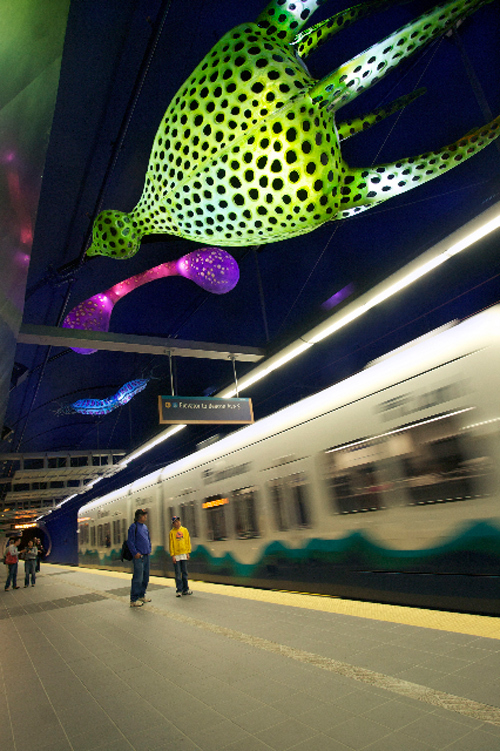 Beautiful, quirky, unusual, weird (not unlike Portlandians). 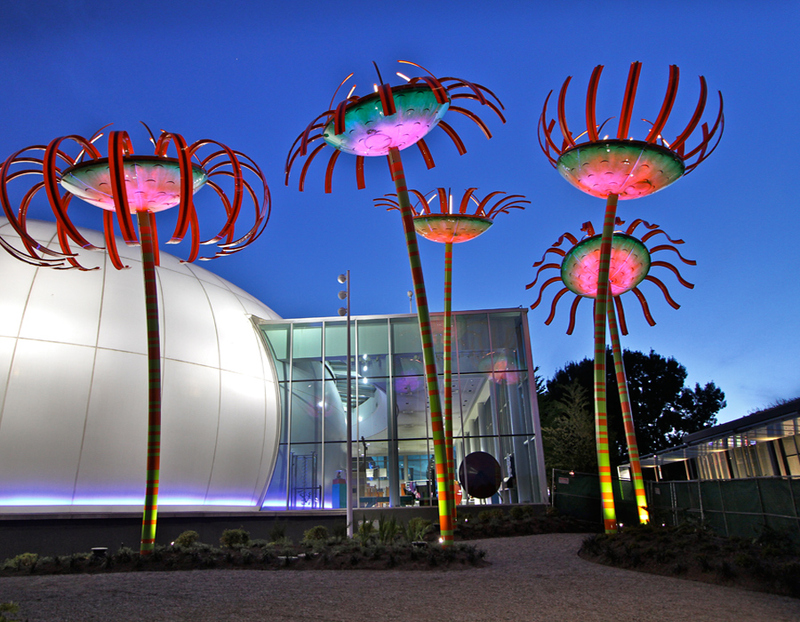 They are the fascinating tropical pitcher plants or “monkey cups” that collect water in their leaf vases that sometimes monkeys drink from. 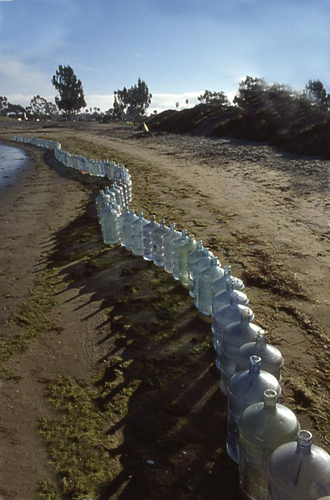 The water has an enzyme in them that helps dissolve insects (and sometimes small animals) that find their way into the cups providing fertilizer for the plants that normally live in infertile locations. 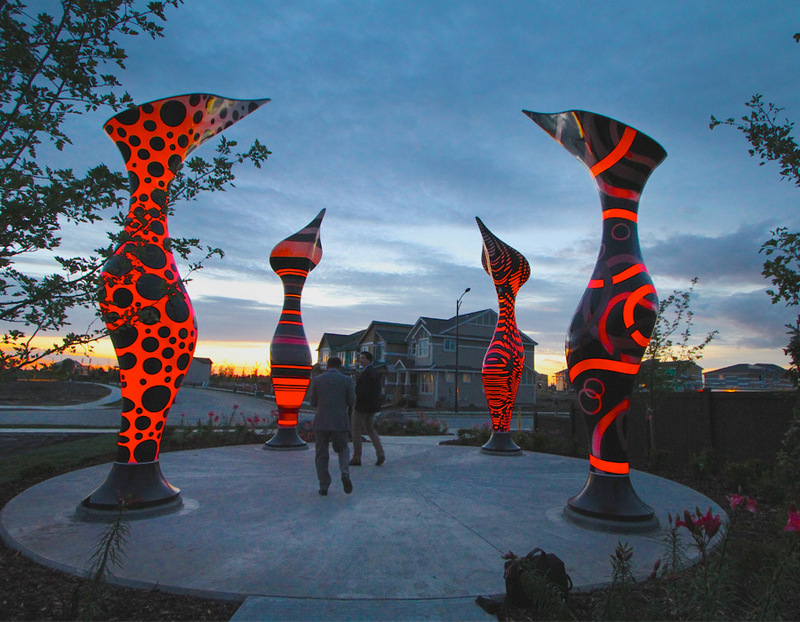 The shapes of the sculptures are inspired by the shape of a variety of Nepenthes and celebrates the wonderful diversity and quirkiness of this colorful neighborhood. 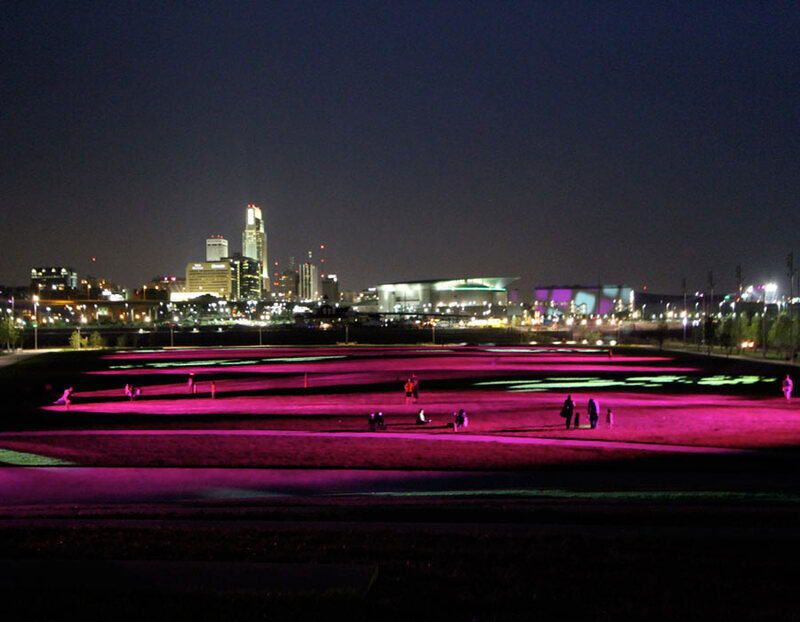 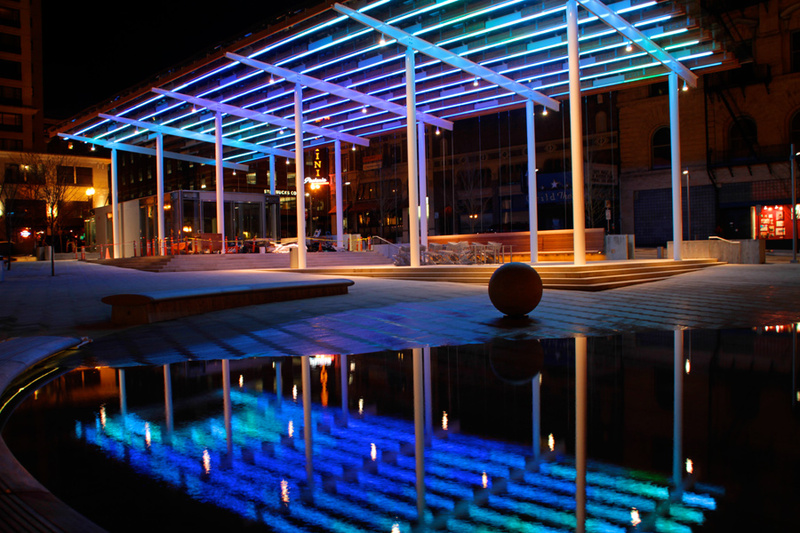 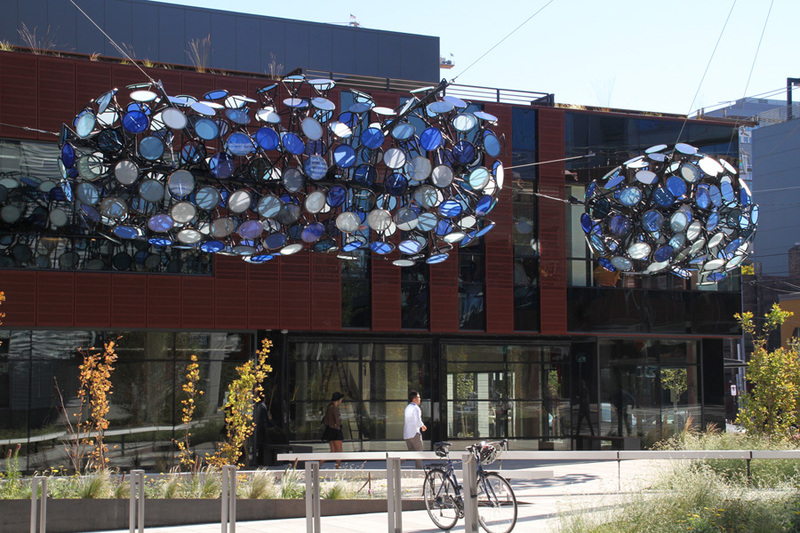 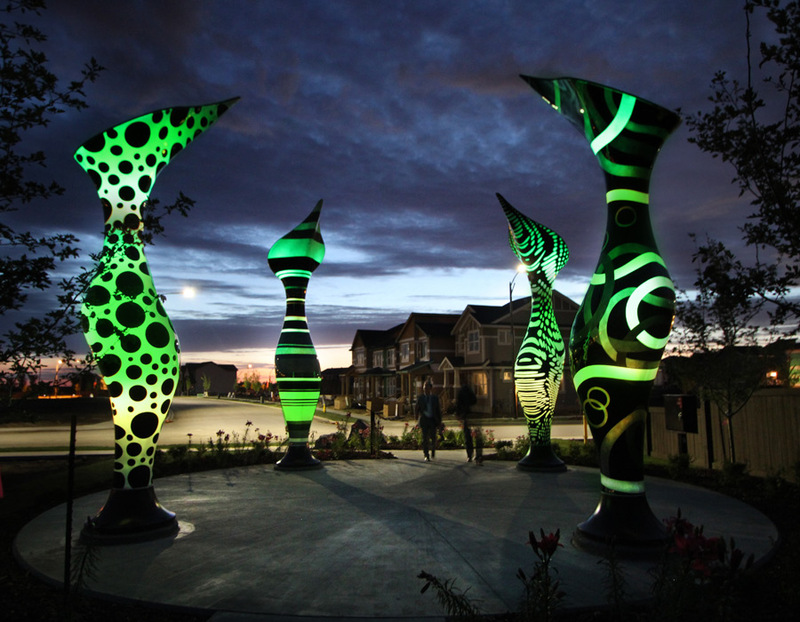 Each sculpture contains solar cells and batteries that take in energy in the daytime and allow them to glow after dark. 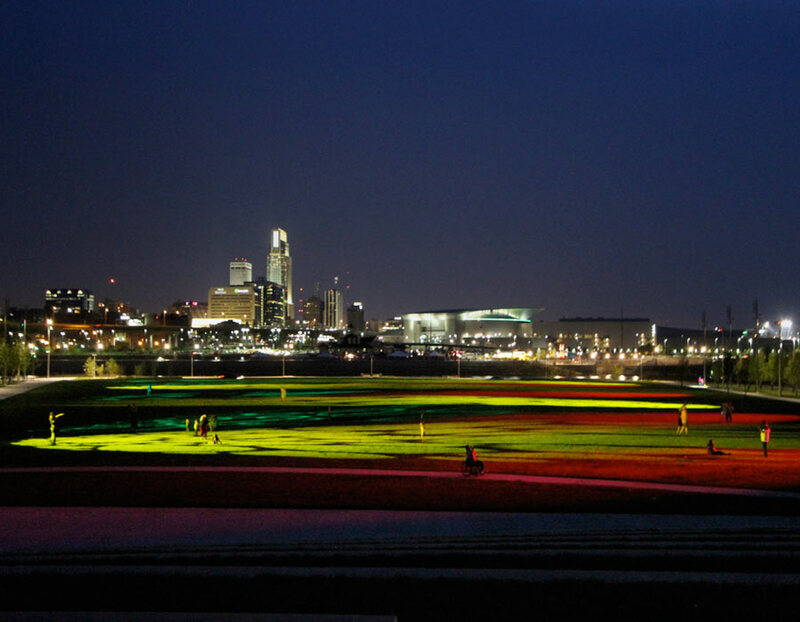 The time on changes with the season….about an hour after sundown. 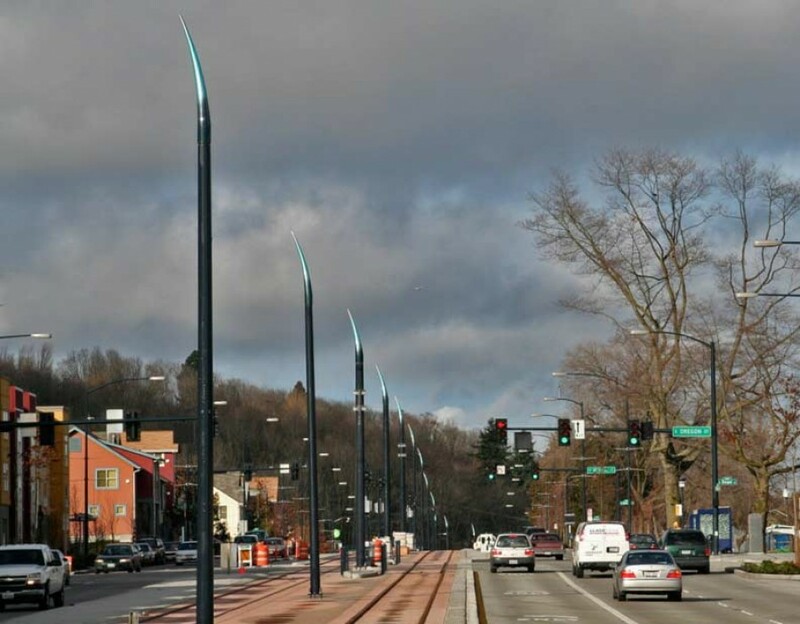 They stay on for 4 hours after they turn on. 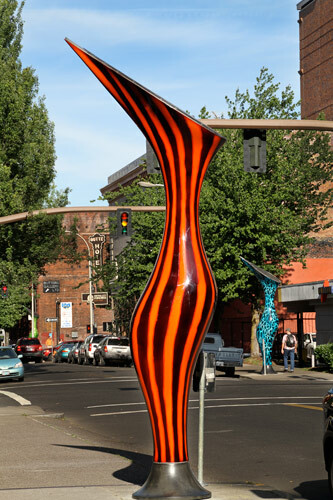 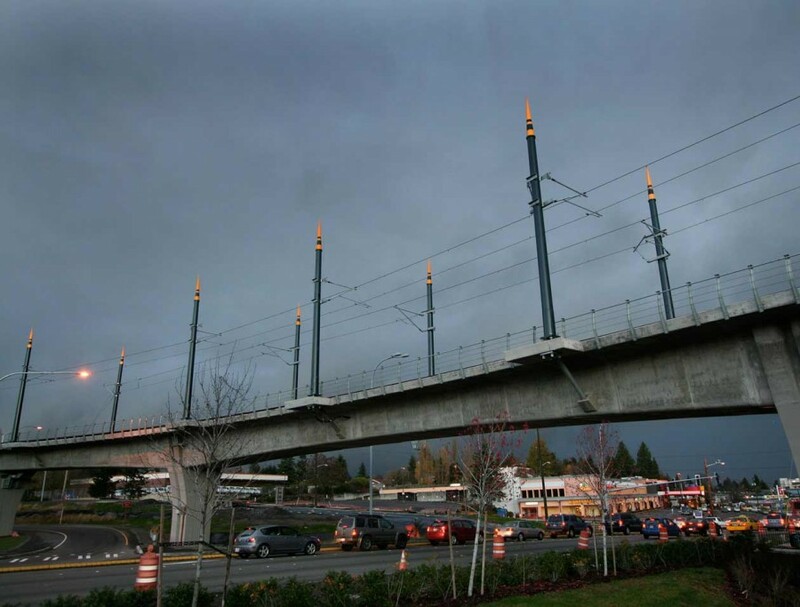 The project was funded by TRIMET and was administrated by the Regional Arts and Culture Council of Portland (RACC). 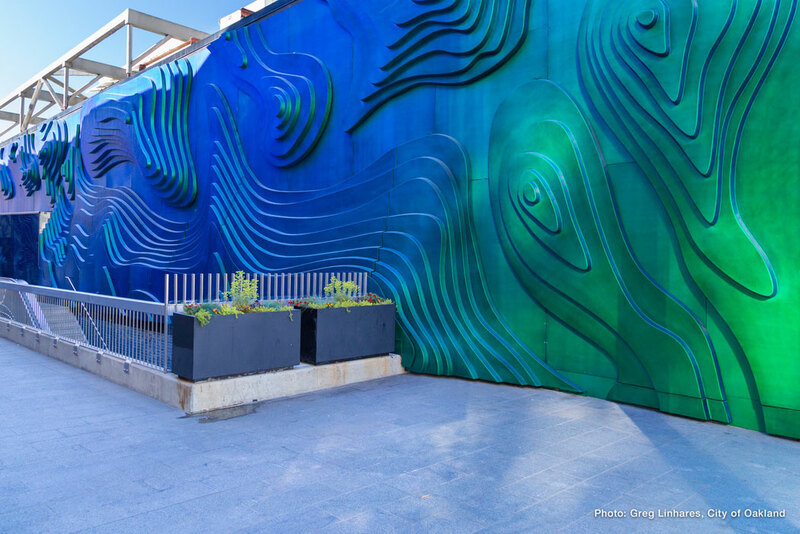 The project began with construction funds that were originally allocated towards stamped concrete in the center of 4 blocks. 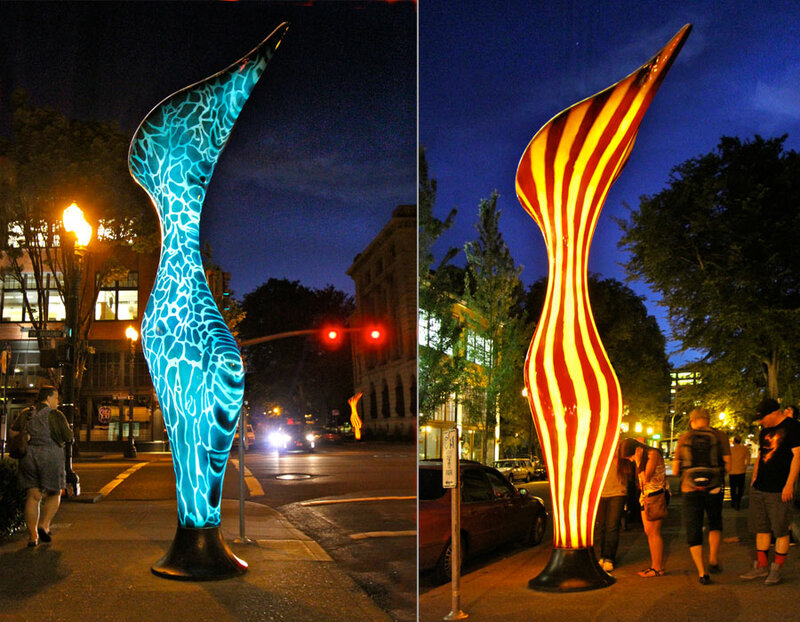 The community requested the funds be used for “Markers” to connect China Town to the Park Blocks (and possibly the Pearl District) along Davis Street- highlighting the street as a vibrant walking corridor and connector. 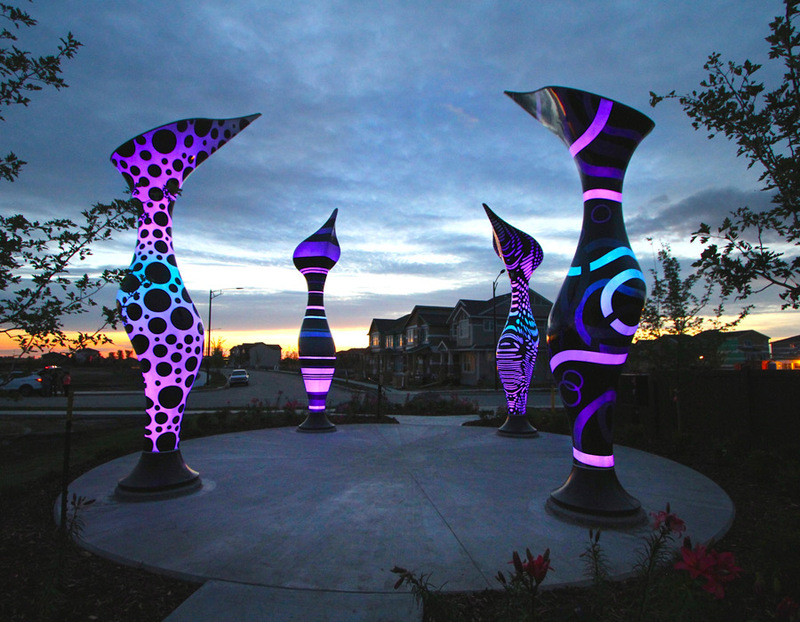 The “Markers” project took a few twists and turns and ultimately became these glowing sculptures. 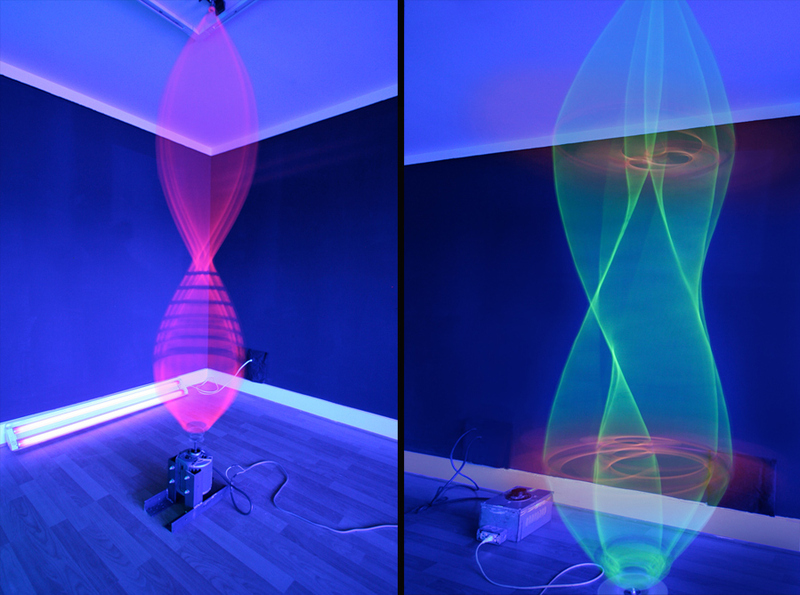 These kinetic sculptures engage the air and our persistence of vision with tracings of light generated by multi-color fluorescent materials. 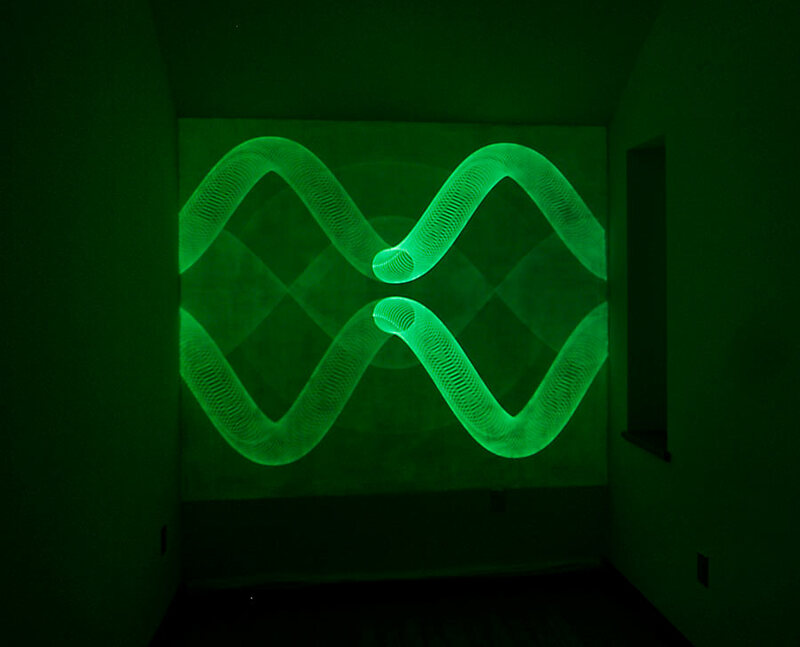 Depending on speed and material length, the sculptures can create various “resonance patterns” producing different “standing wave” shapes. 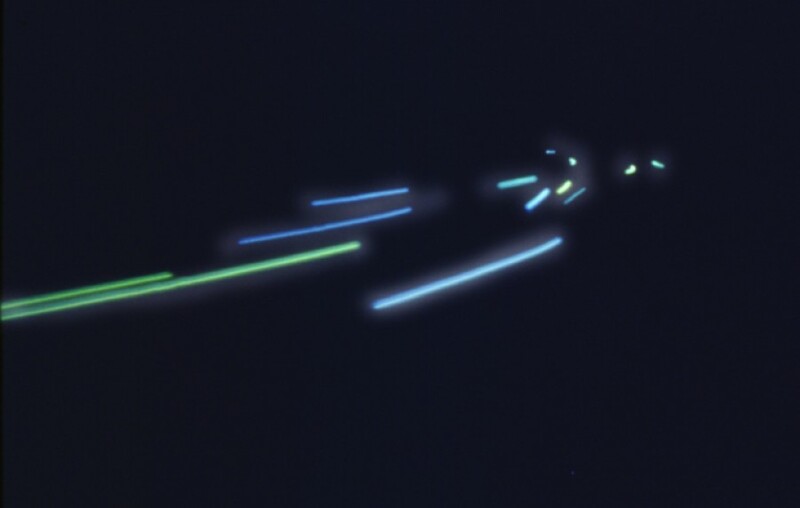 Working in 1914, Lillian & Frank Gilbreth, were pioneers of light painting in the interest of studying “work simplification” for efficiency of parts assembly. 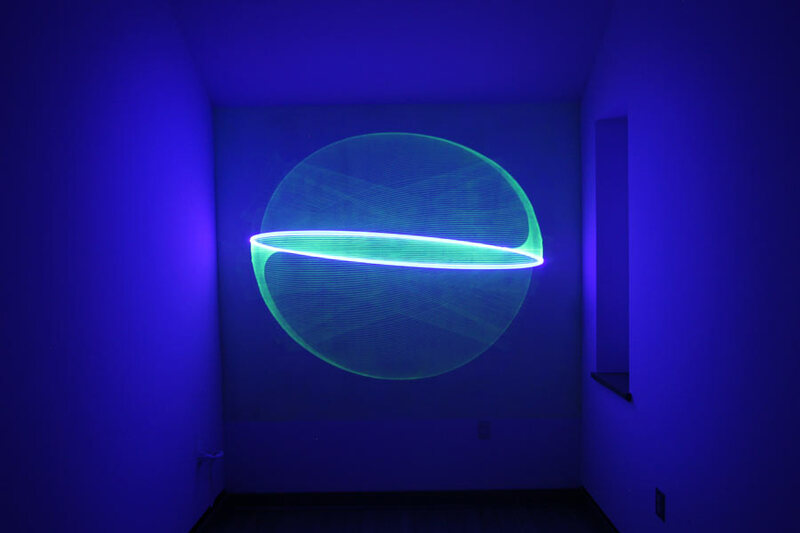 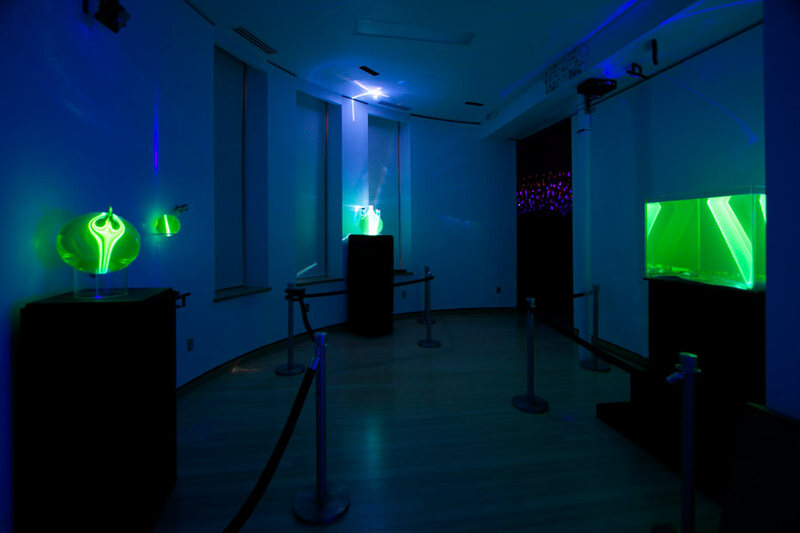 Their early capturing of the form of moving light for their research inspired these sculptures that seek to give luminosity and sculptural form to air. 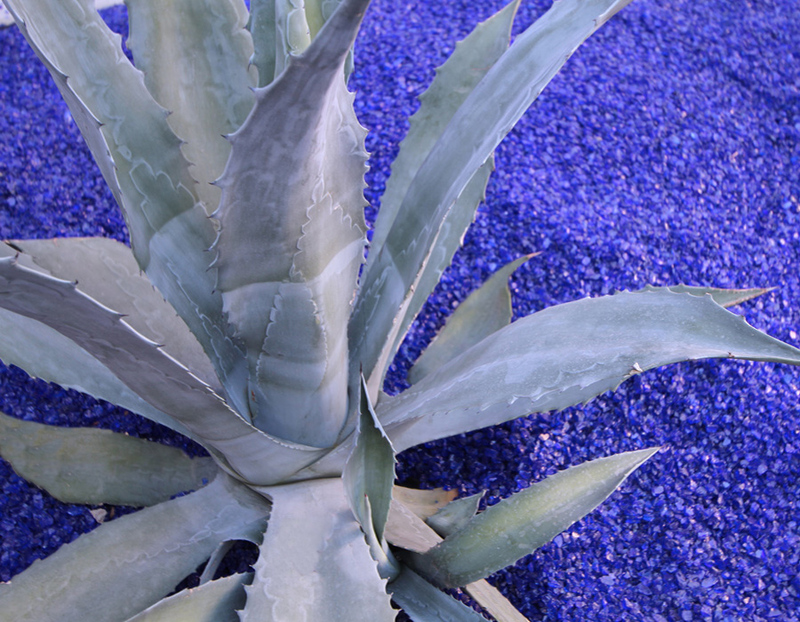 In ancient Egypt the city of Heliopolis (in Greek, or “iwnw” in Egyptian) was a famed center of healing. 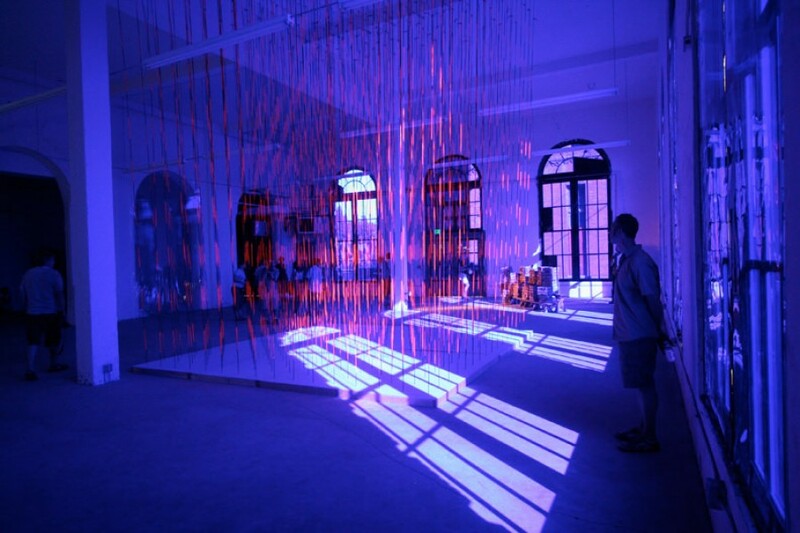 They created the first solariums that filtered light into the rooms through glass and colored silks, infusing the rooms with colored light. 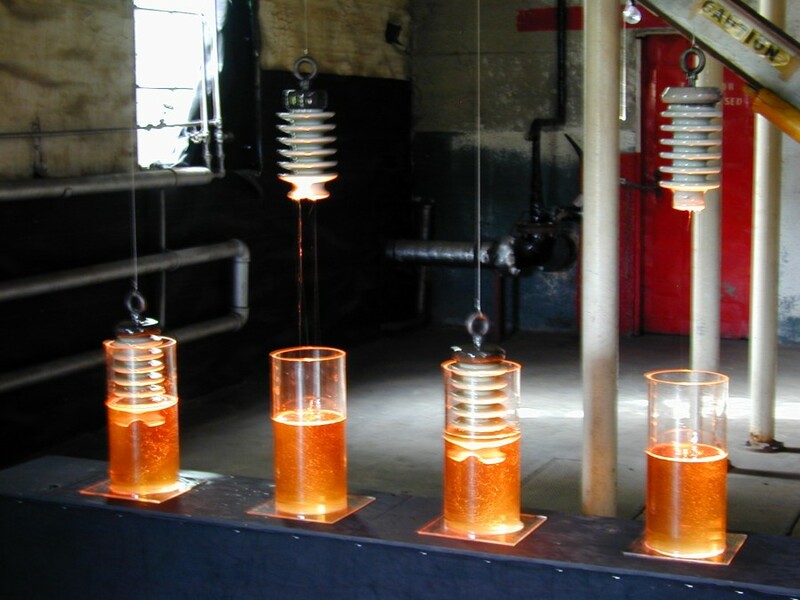 This early “chromotherapy” was used to treat a variety of ailments and spiritual conditions. 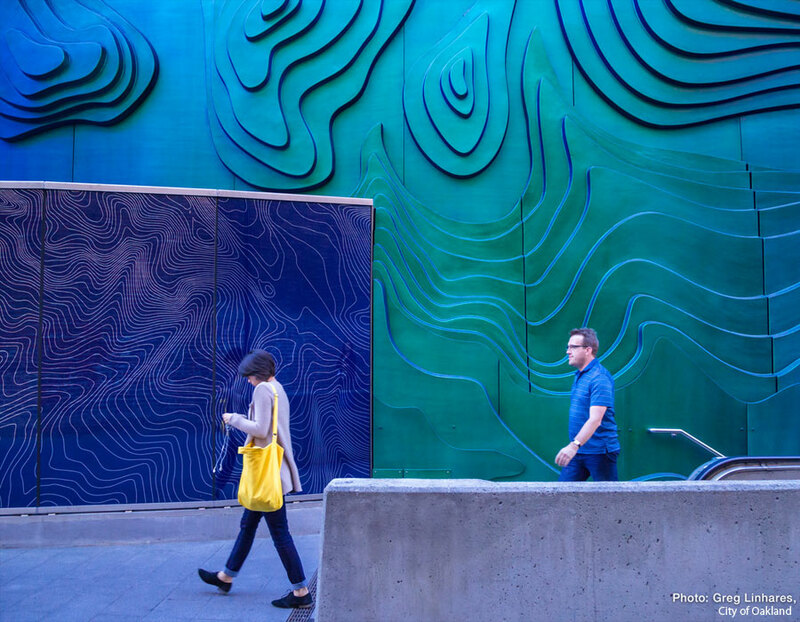 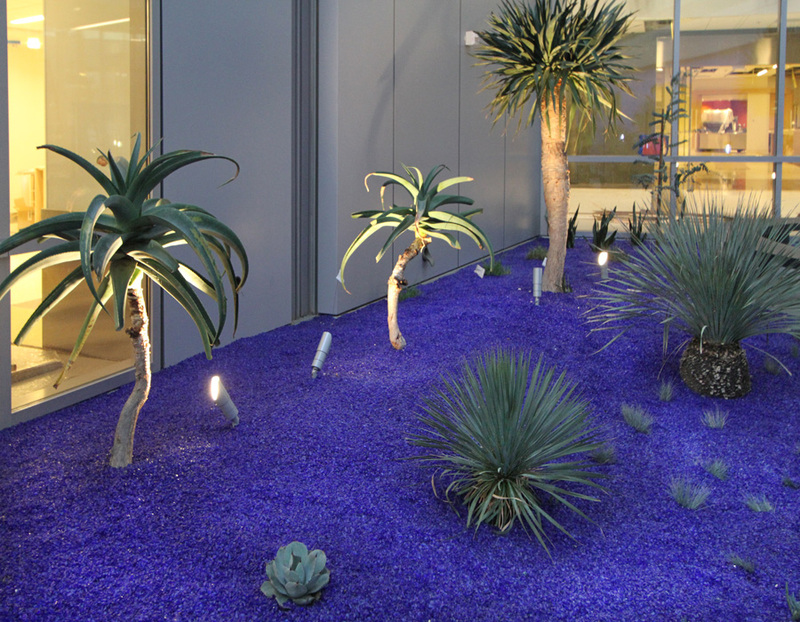 This updated project utilizing theatrical filters on the windows infuses the gallery with saturated indigo and creates a backdrop of color for the other projects while referencing this ancient temple and the healing practices that took place there. 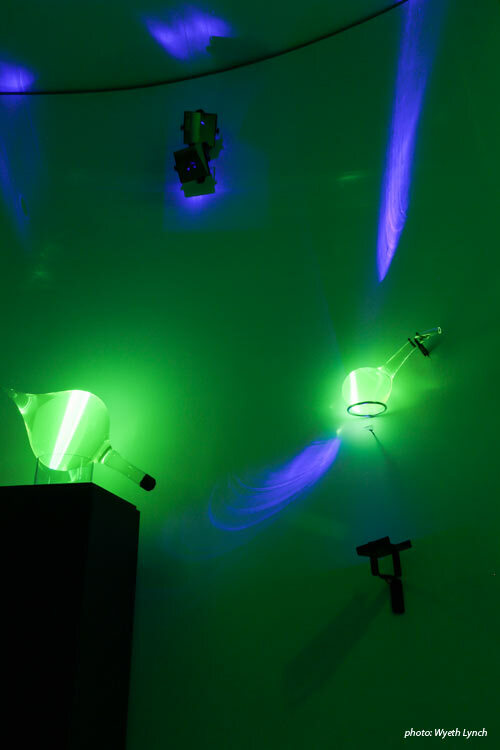 These theatrical filters change the frequency of daylight in order to mimic UV “blacklight” thereby activating the florescent materials in the gallery. 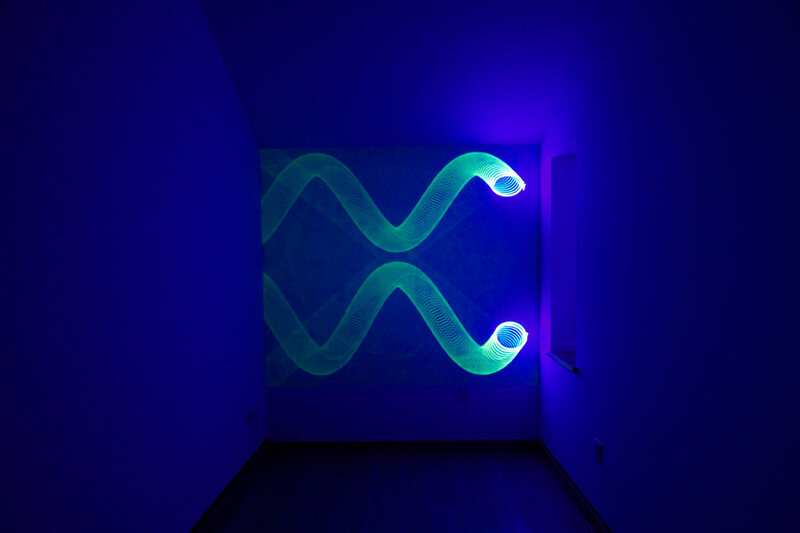 Notice after being in the gallery for a while that upon leaving, the brain tricks the eye in an effect called “retinal fatigue” changing the color balance in your brain. 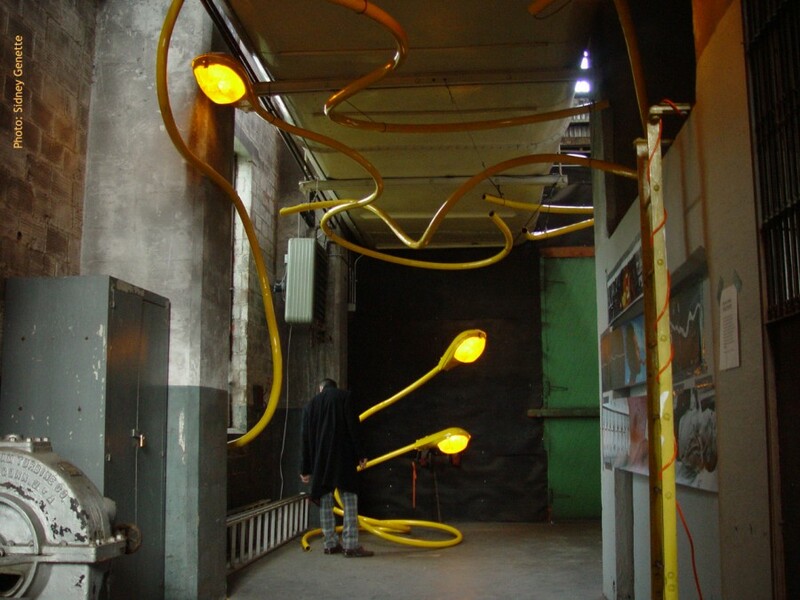 As you exit, it will briefly give the outdoor light a decidedly golden color (the opposite of the blue). 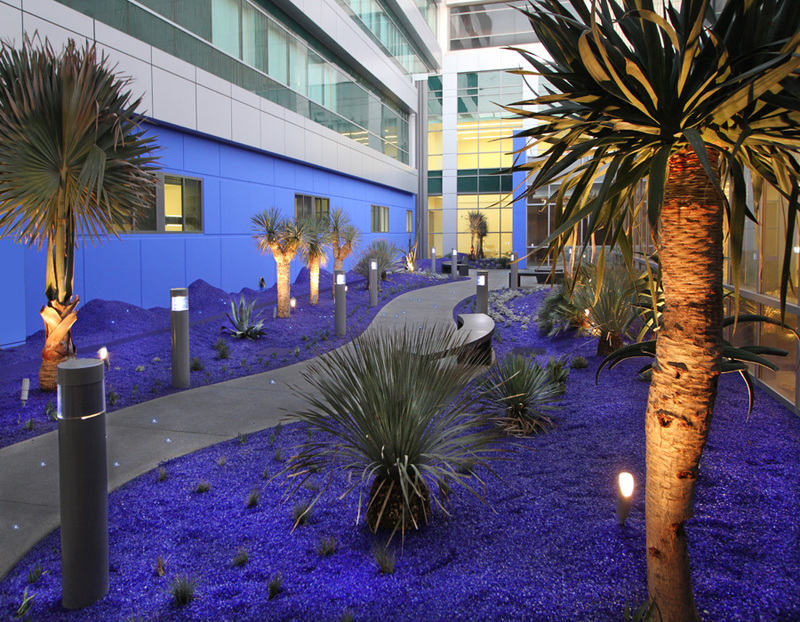 A ring of trees and walkway surrounds the central lawn. 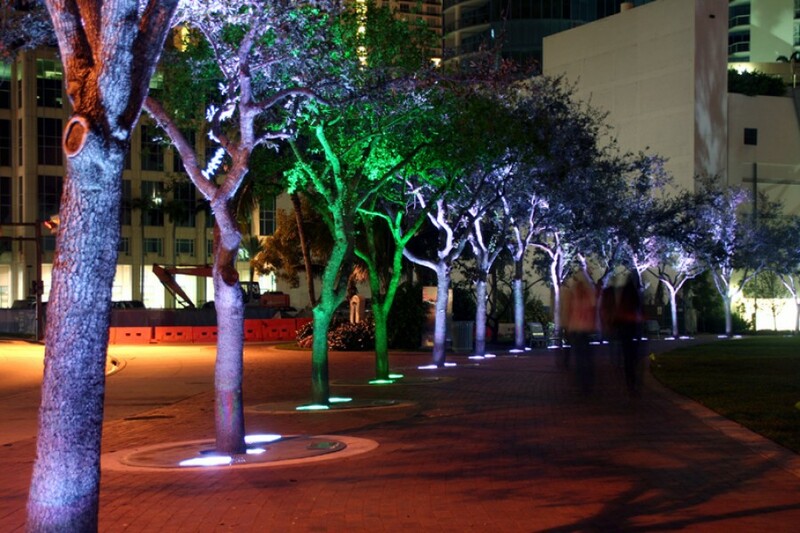 As a person walks by an individual tree it changes color from white to green, then slowly fades back to white. 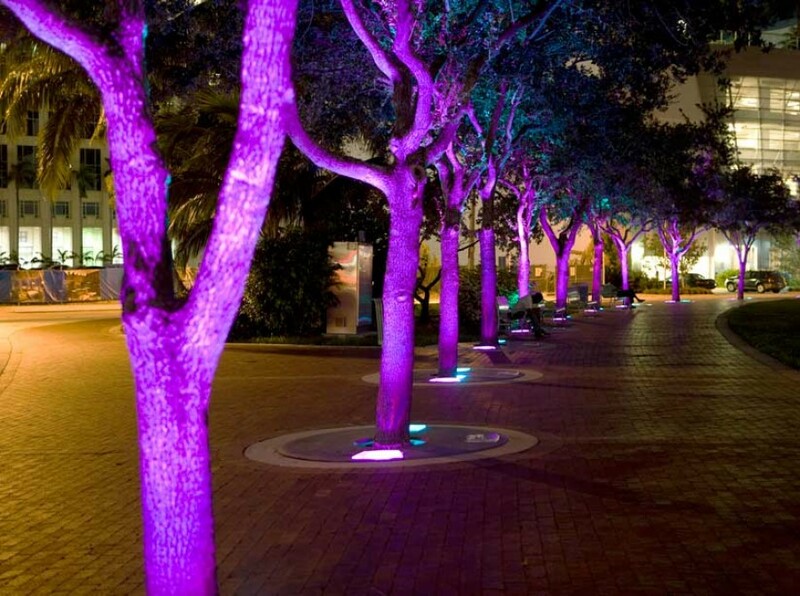 Riding a bike around the park can quickly sequentially trigger the trees. 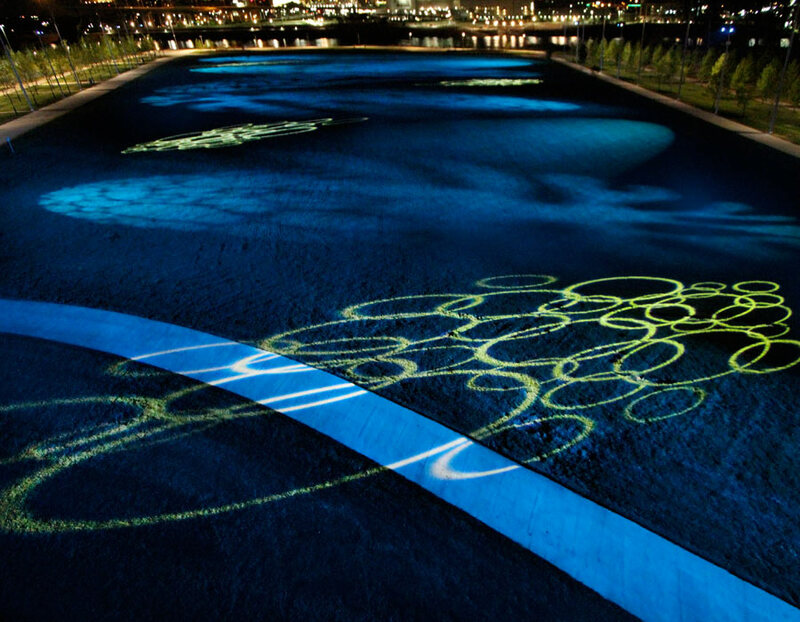 As we move through the park, we affect the space around us and leave a temporary mark. 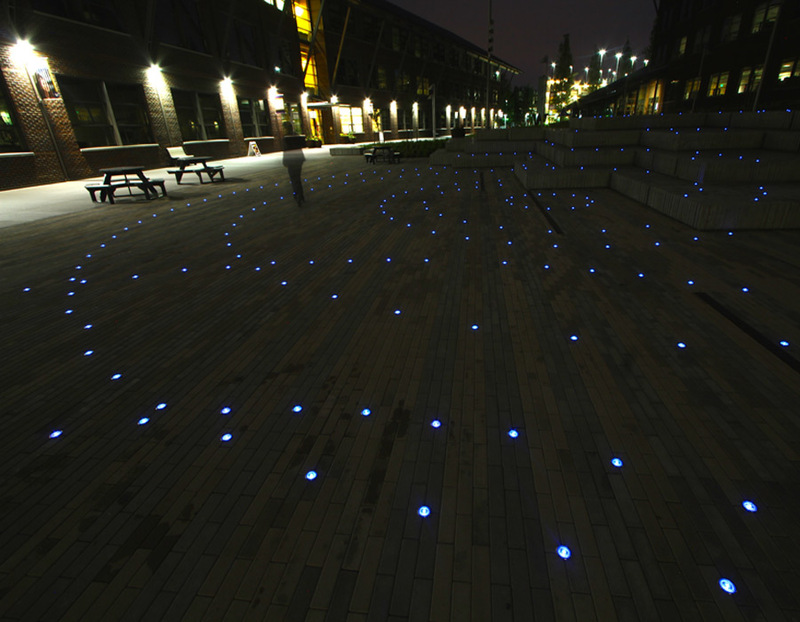 Also hidden around the park within the pavement are 5 metal medallions. 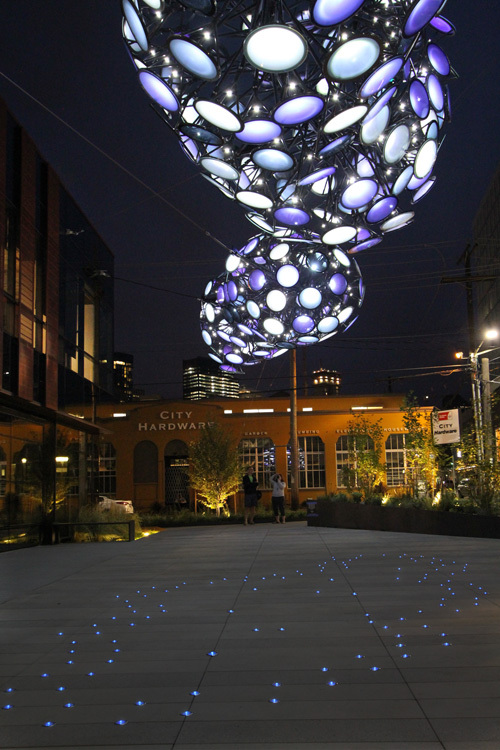 When you step on these medallions it sets off a pre-programmed sequence of lighting events, making the trees dramatically change color, chase, simulate fire, sparkle etc. 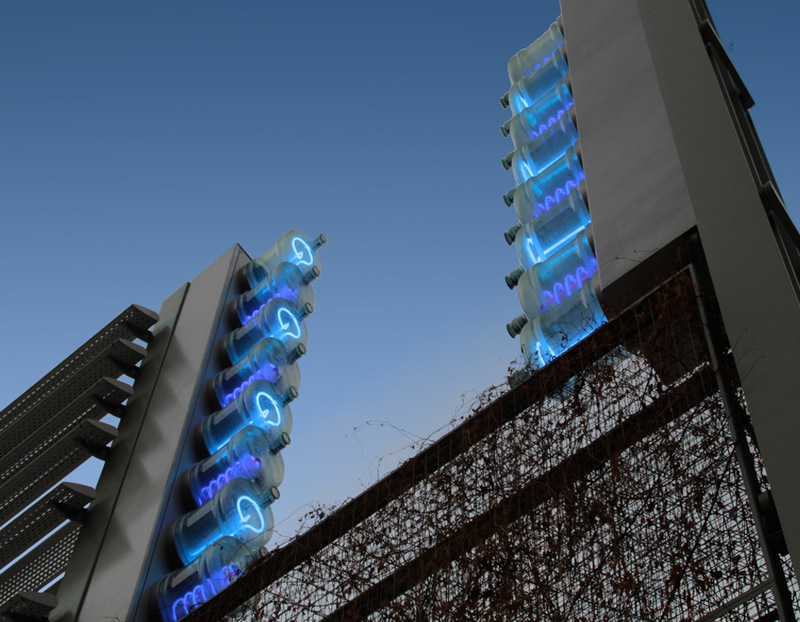 4 medallions are programmed with consistent sequences, 1 is a wild card that randomly changes the lighting effects on the trees at every new activation. 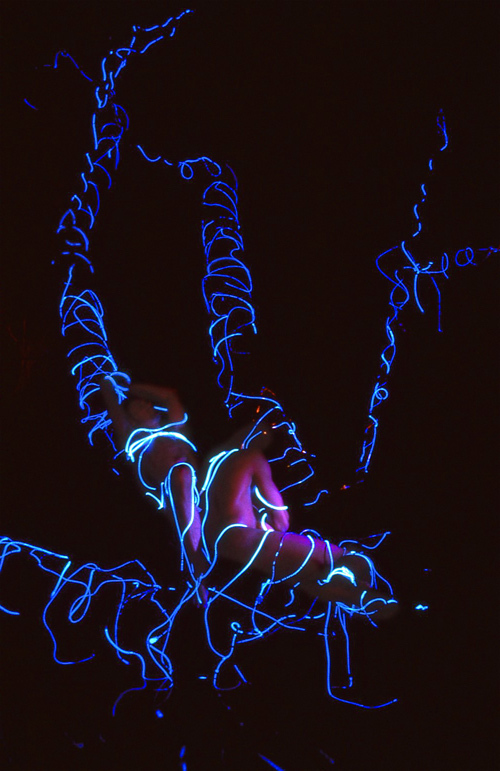 This project was documentation of an installation done in the woods on Bainbridge Island. 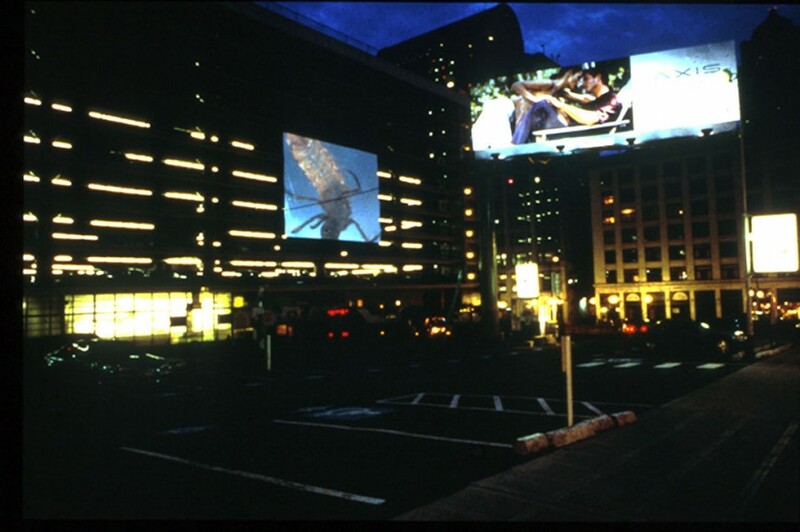 Its final format was 3 large-format Cibachrome prints that are part of the City of Seattle's Portable Works Collection. 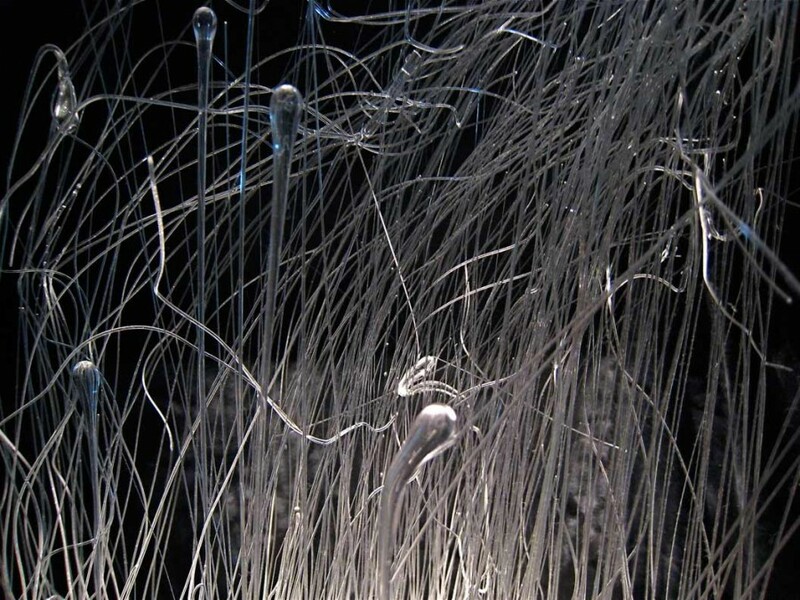 This project was a meditation on the correlation between new emergent diseases/conditions and the unintentional results of manufacturing process that make their way into the environment and ultimately into our bodies. 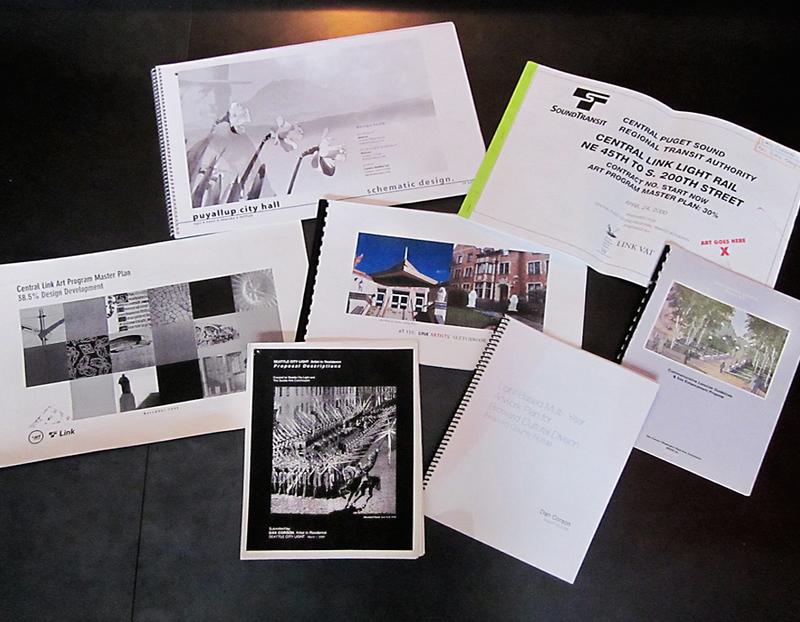 A range of Art Plans for various municipalities and agencies. 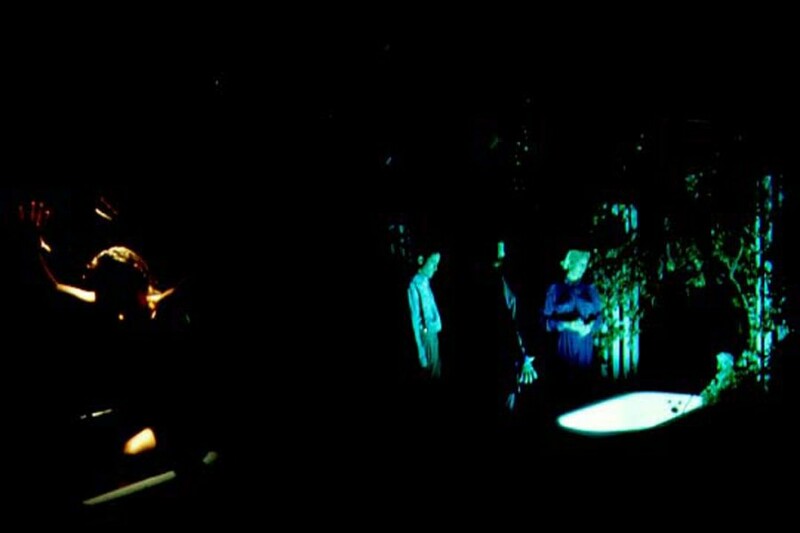 A few of which are excerpted below. 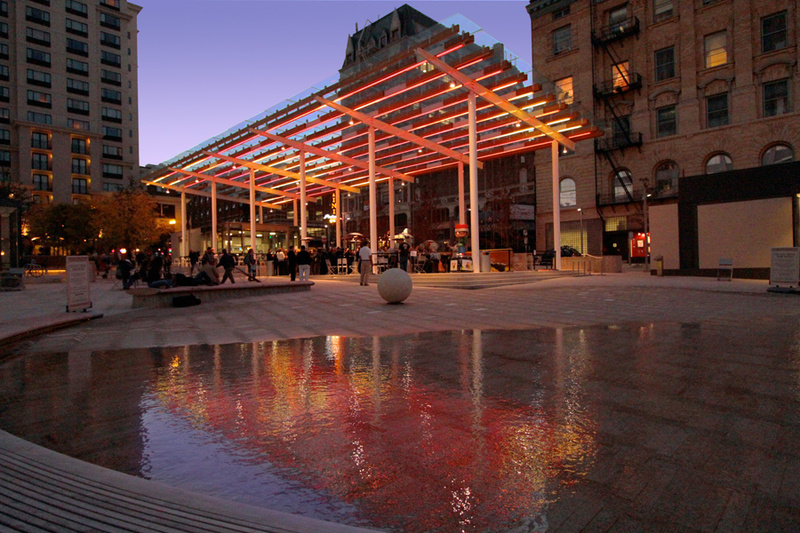 This Public Art Master Plan was created as a complementary Arts planning document to the Diridon Neighborhood Master Plan for the City of San Jose CA. 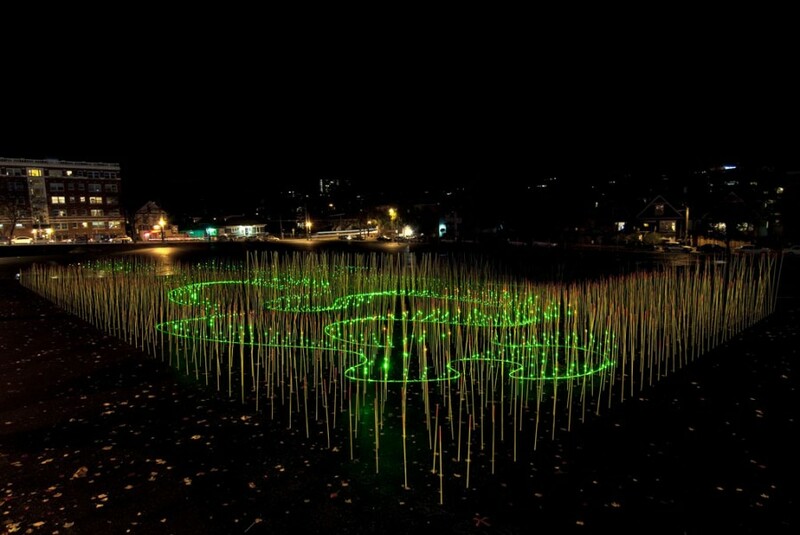 This was created in collaboration with Ellen Sollod. 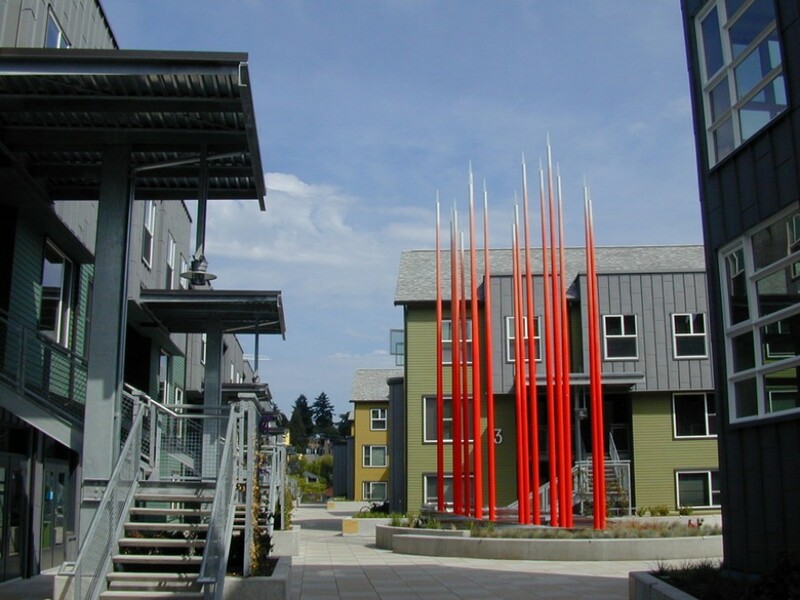 This Neighborhood Master Plan was created by Field Paoli with contributions by Dan Corson and Ellen Sollod (Arts Planners). 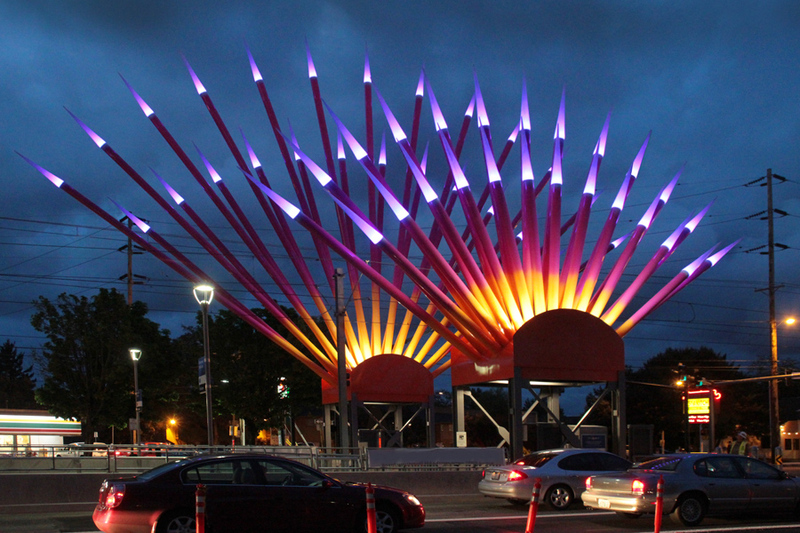 The Arts Plan team also assisted in leading public meetings and community charrettes. 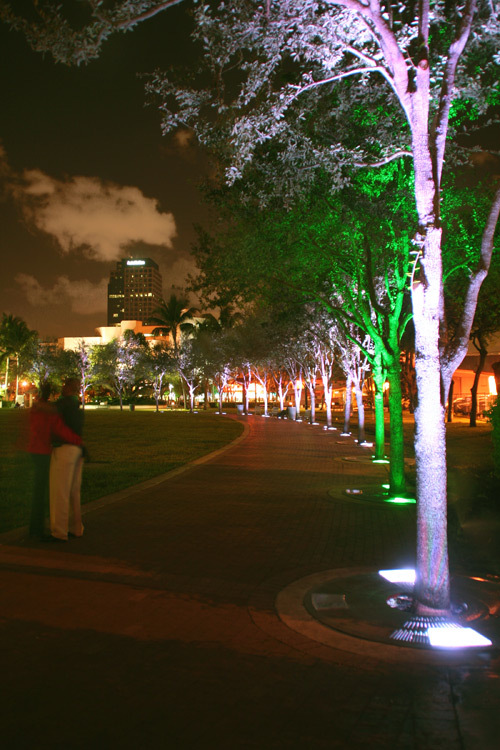 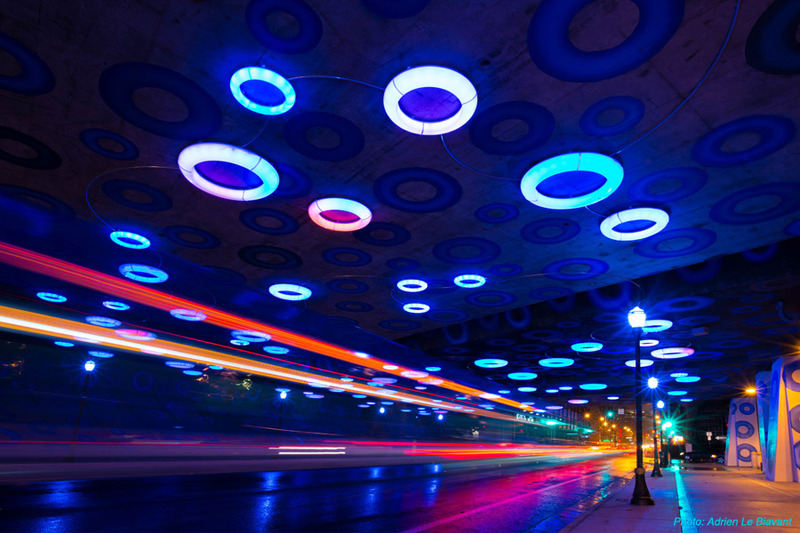 This Light-based planning document looks at a variety of lighting opportunities and expressions for Broward County Florida. 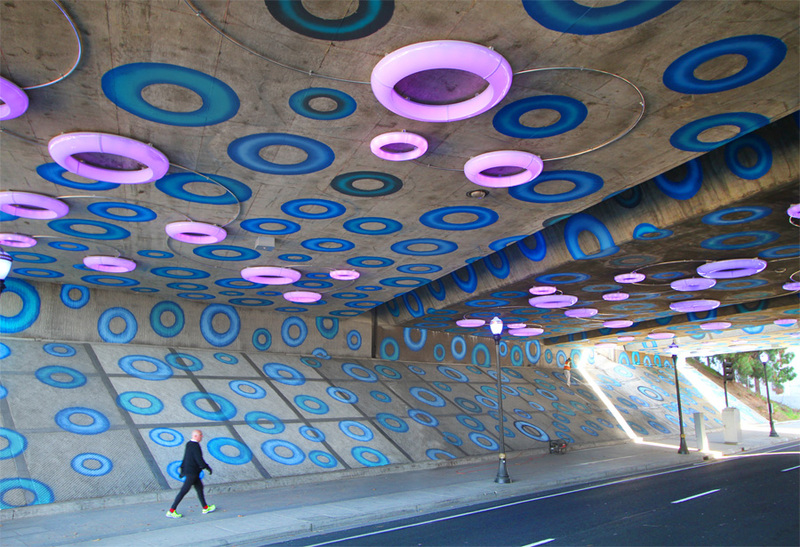 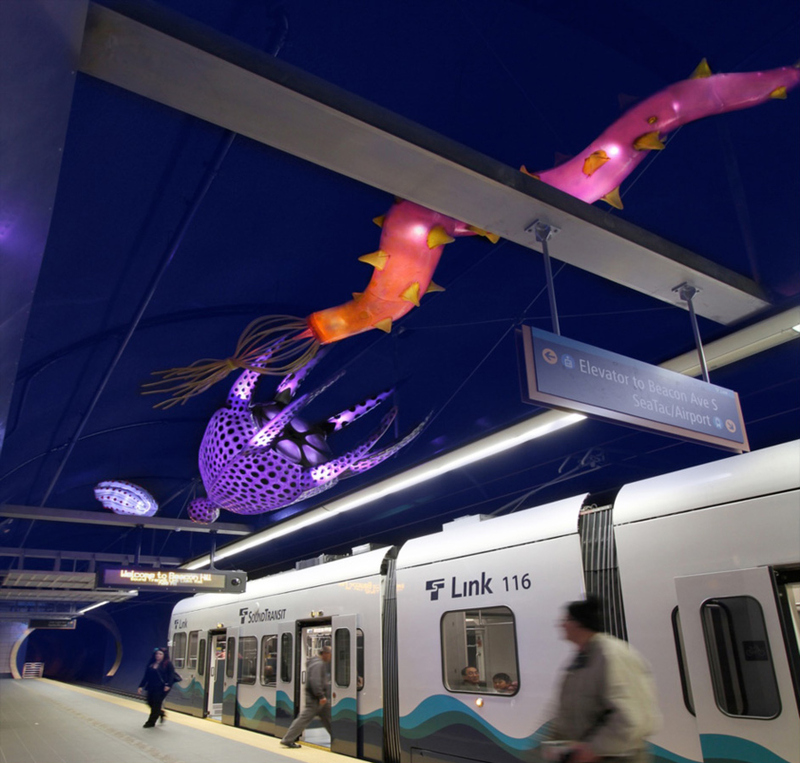 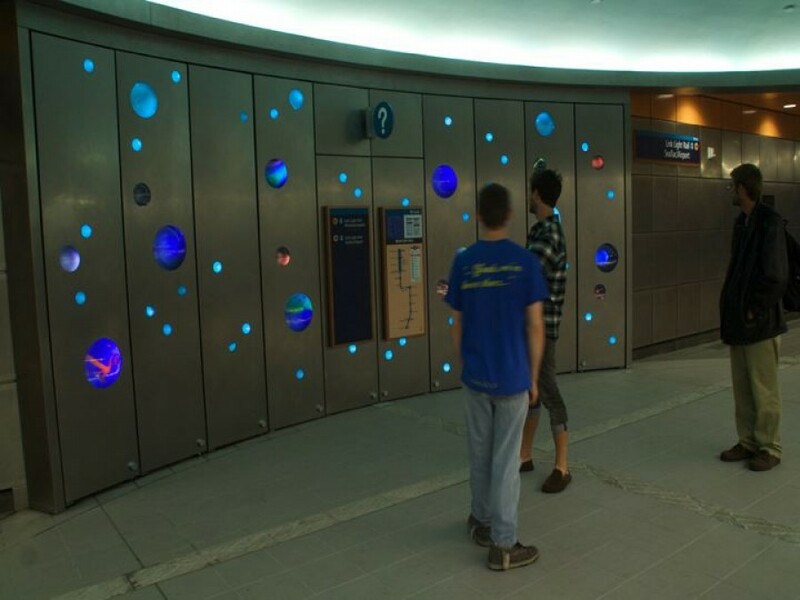 18 large-scale glowing sculptural forms suspended from a cobalt blue ceiling in the 2nd deepest light rail tunnel in N. America. 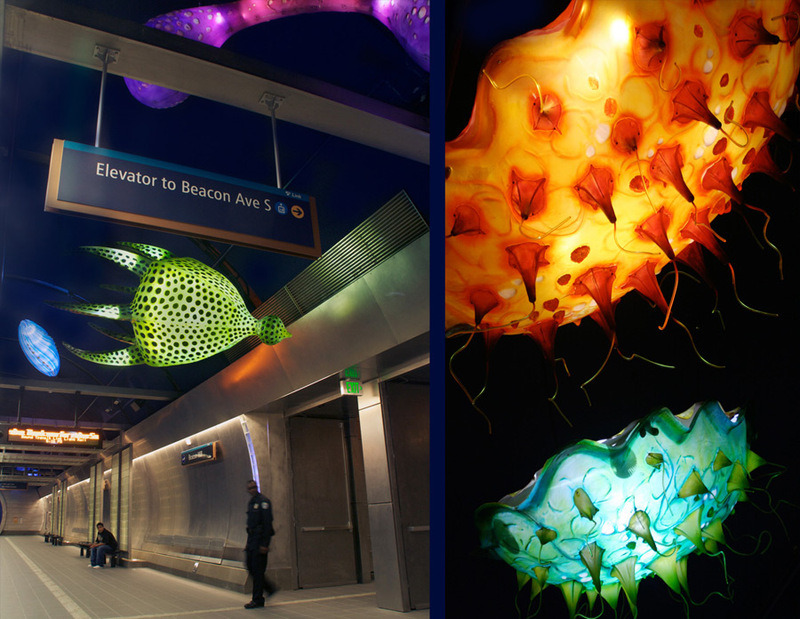 Glowing forms inspired by microbes, deep sea creatures and other objects of indeterminate scale. 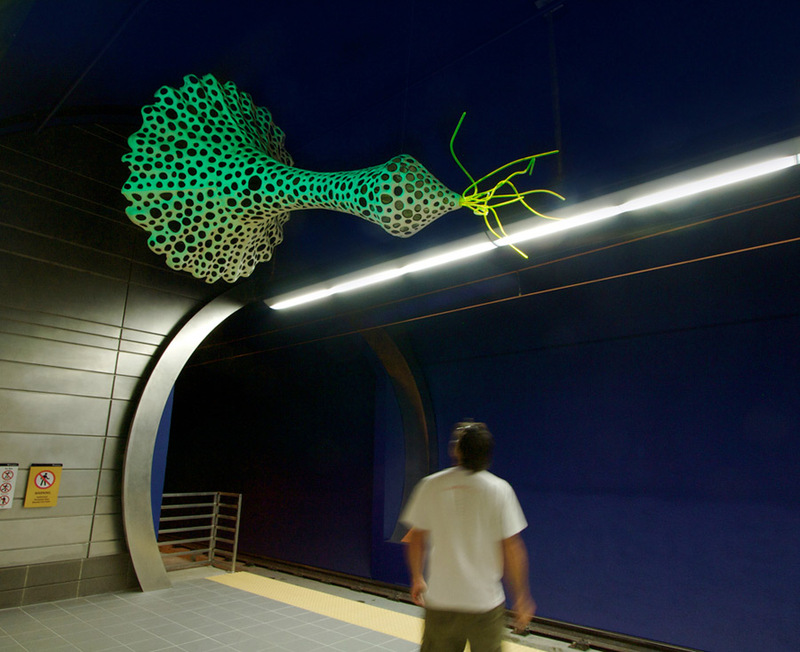 In this station removed from the context of the neighborhood, an other-worldly mix of shapes and forms make us scratch our heads and wonder if we are looking through a microscope or telescope. 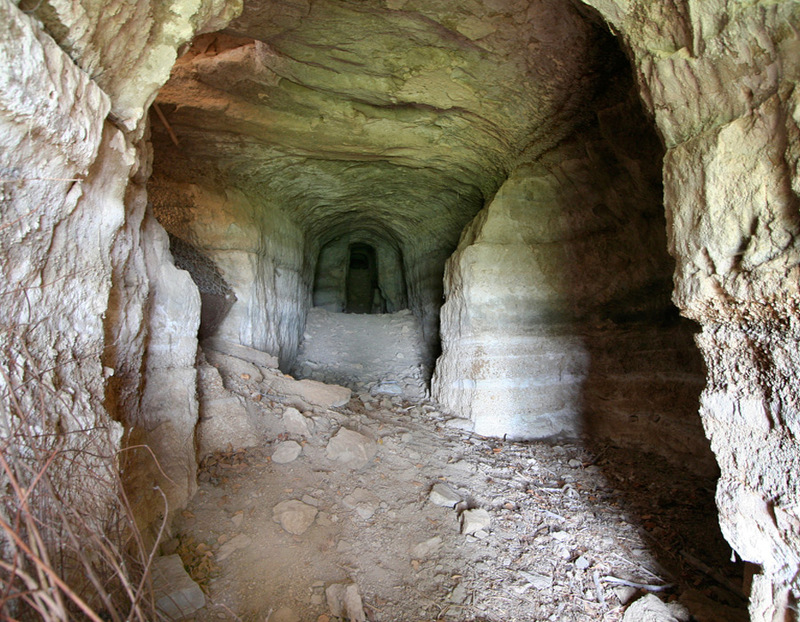 In a remote Italian hilltown, I participated in a NIAUSI residency exploring and documenting the series of caves, cisterns, carved cellars and grottos in this pre-post Eutruscain village. 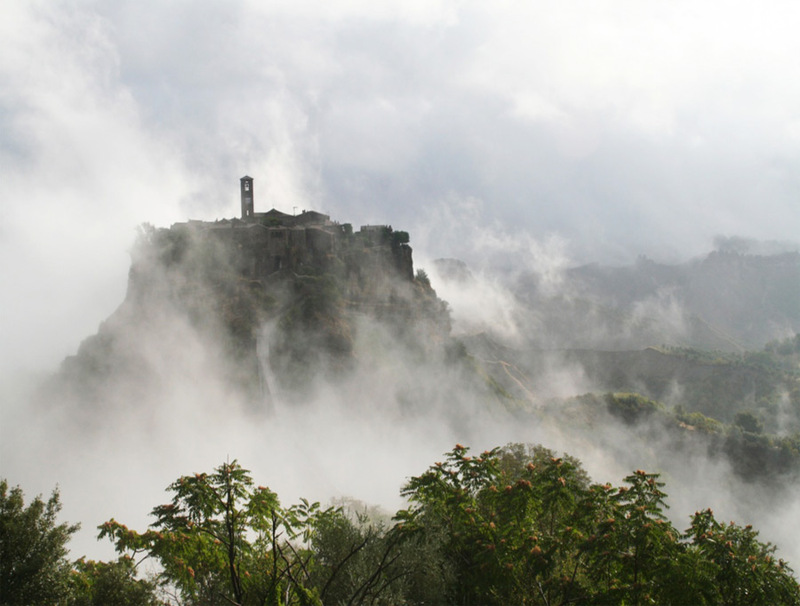 Known as il paese che muore (the dying city), Civita is an interesting ghost town almost frozen in time, acting as a defacto hilltown reliquary. 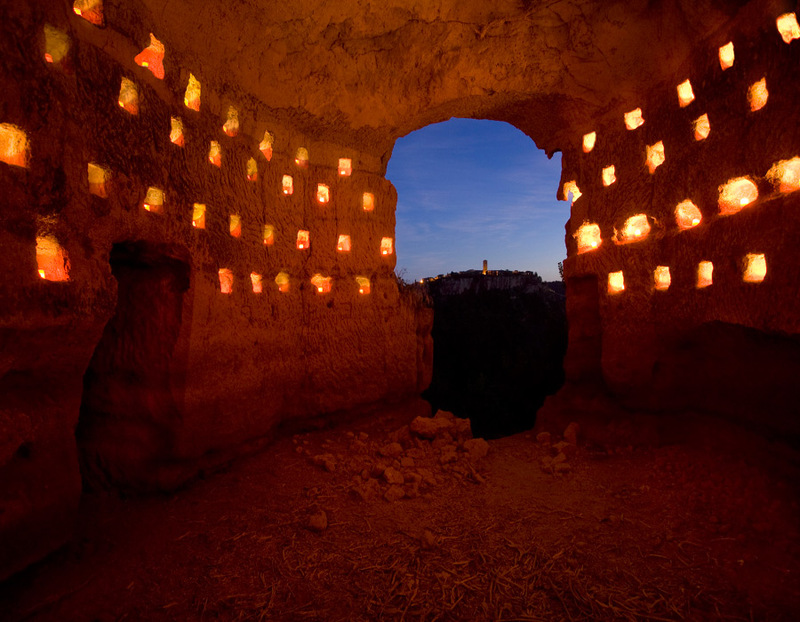 A series of temporary installations and subsequent photographs were created from these caves- many containing “colombari” or dovecotes. 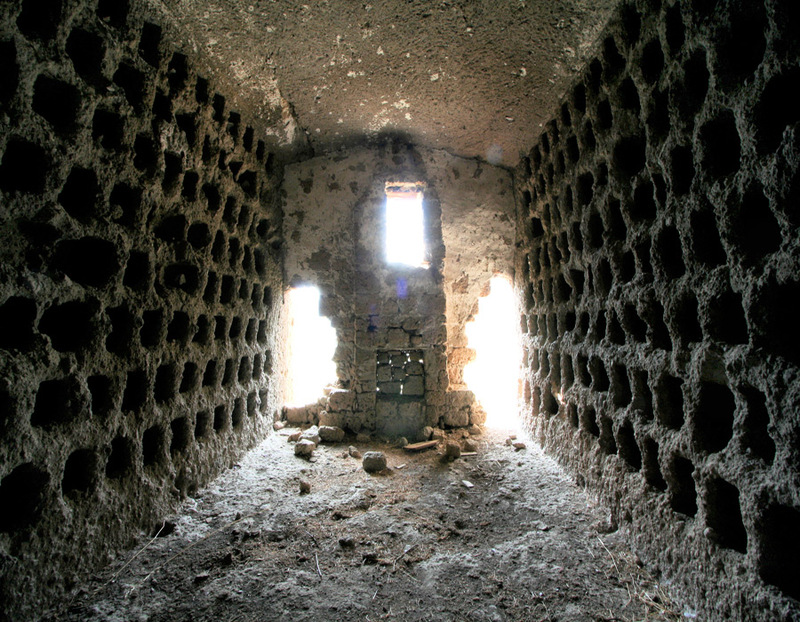 In the Middle Ages, these colombari: dove nesting condos were developed to provide protein in the form of eggs and meat at all times, but especially when the towns were cut off due to a siege. 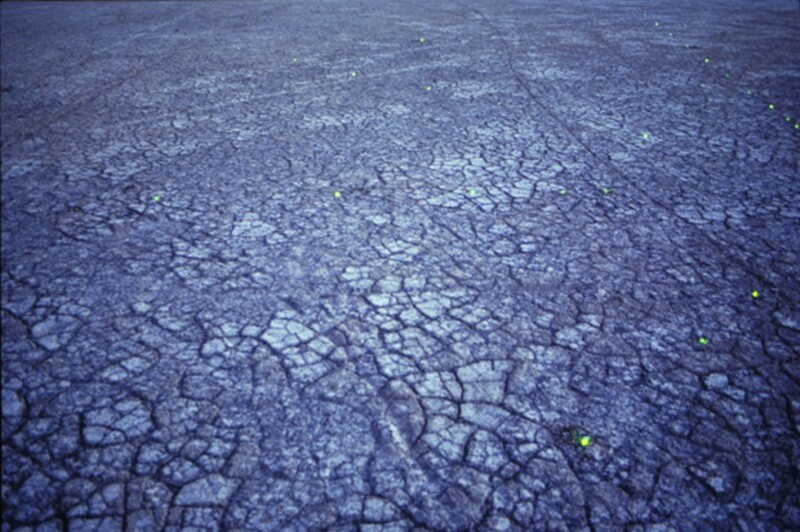 Hundreds of these small nesting holes were carefully carved into the tufa to create homes for these birds. 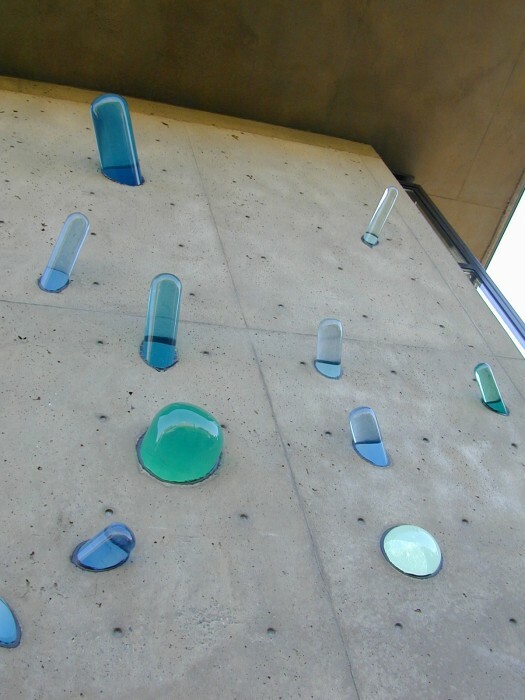 Located half way up a cliff face, allowed the birds to have a protected home with ample ventilation and flying access far away from terrestrial predators. 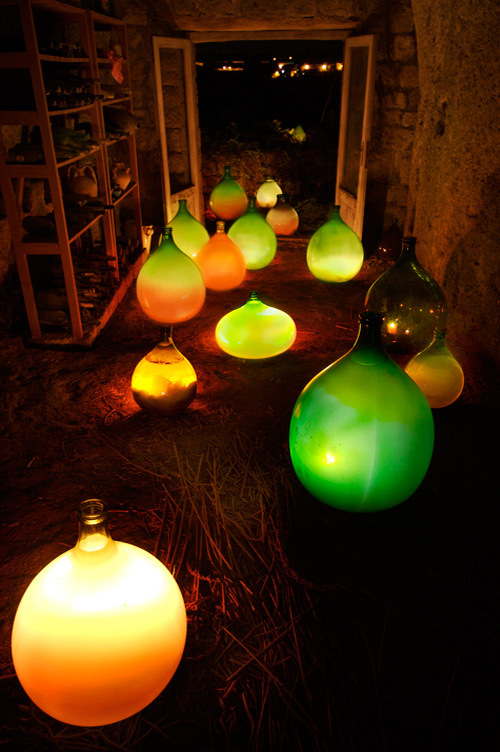 At left is a temporary installation utilizing fluid-filled, illuminated dimigiani (wine and olive oil containers) in the ancient cellar of Astra Zarina and Tony Hayward. 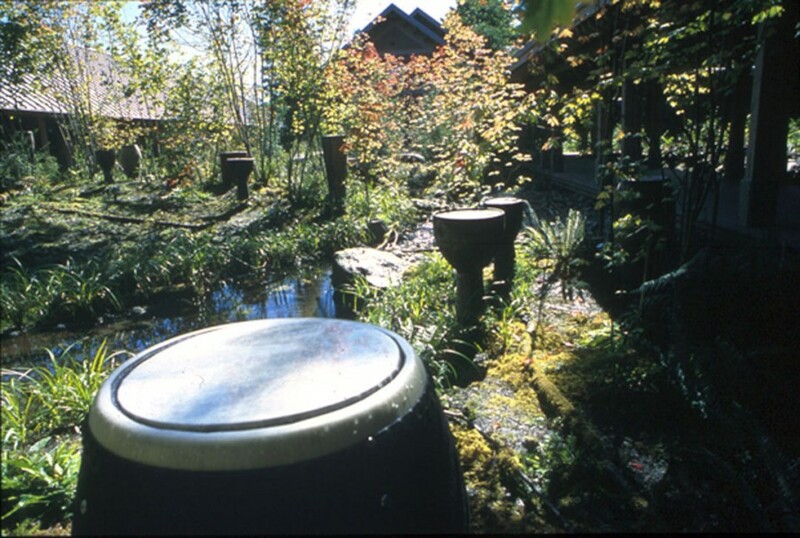 This collection of ancient buildings and foundations was the Bishop's complex built on top of pre-eutruscian foundations and sub-terranian spaces now reconfigured into a home and center of NIAUSI. 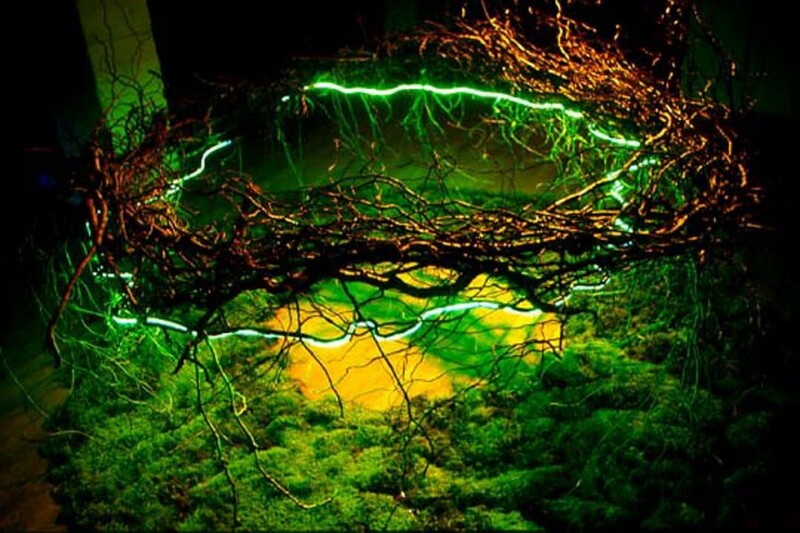 This cellar opens up mid cliffside to the beautiful views of the valley and adjacent hilltown. 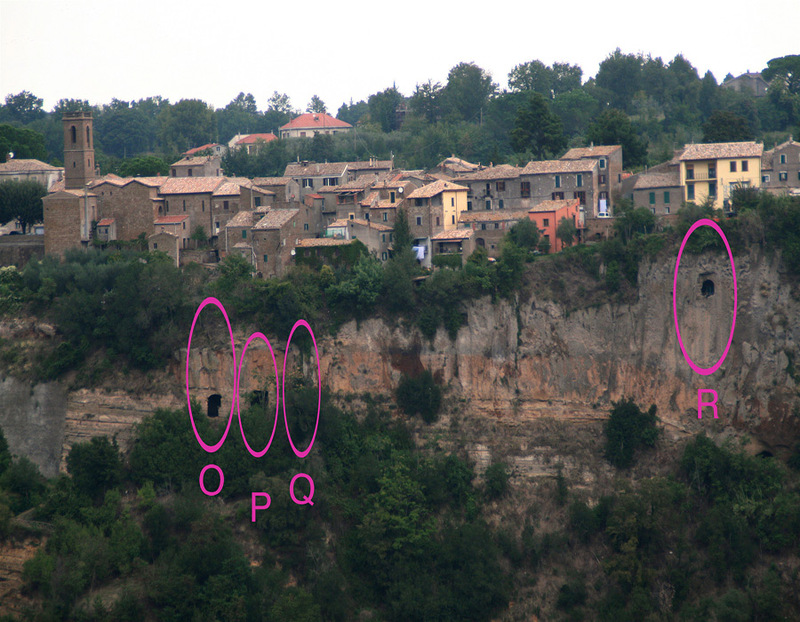 Using a telescopic lens on my camera, I photographed the sides of the cliff and with the print in hand was able to climb up the cliffs to locate these ancient abandoned caves. 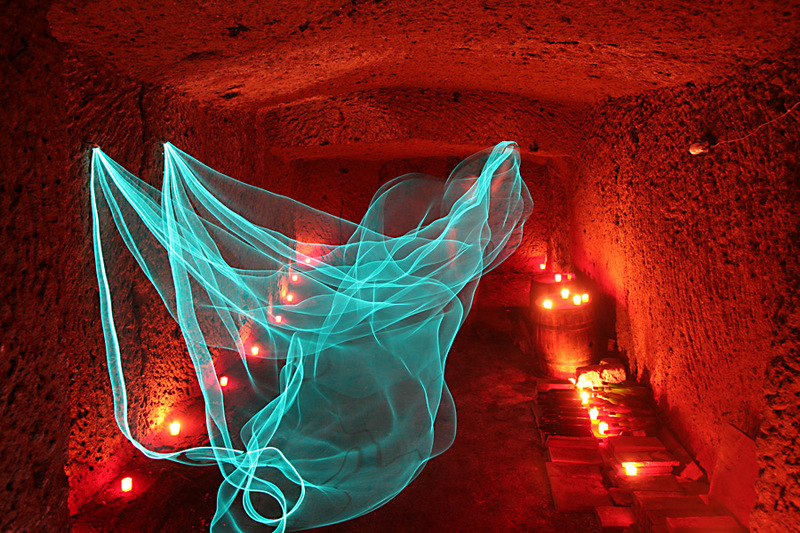 Etruscan cellar 3 stories under the tuffa. 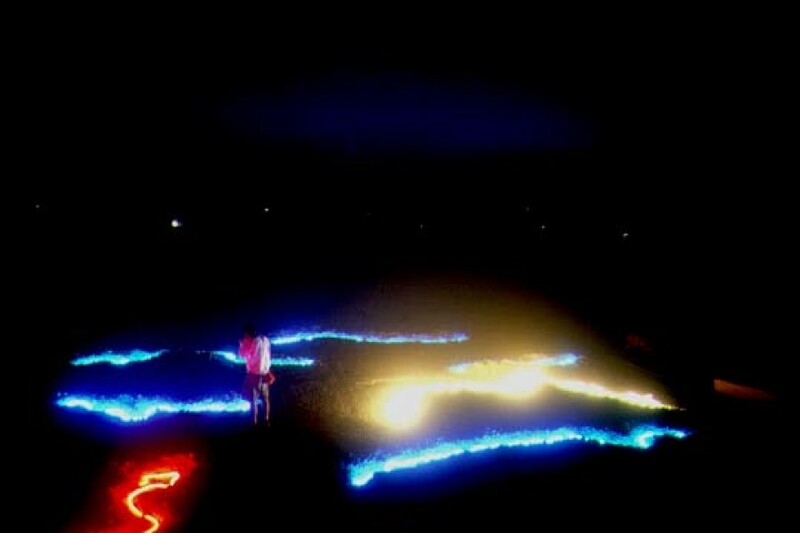 Timelapse experimentation with electroluminescent cable and funerary candles. 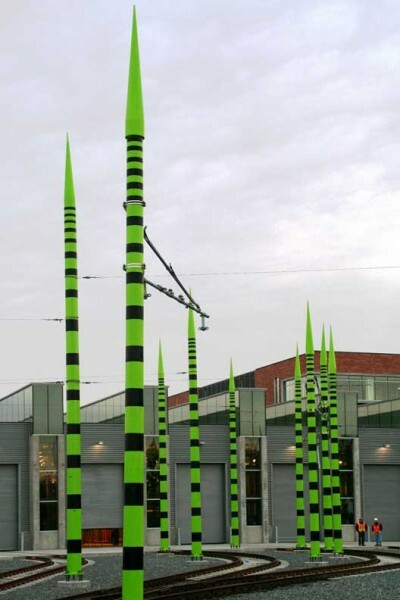 A dramatic cluster of large tapered poles with frosted tips quake in the wind like giant industrial “reeds” on steroids. 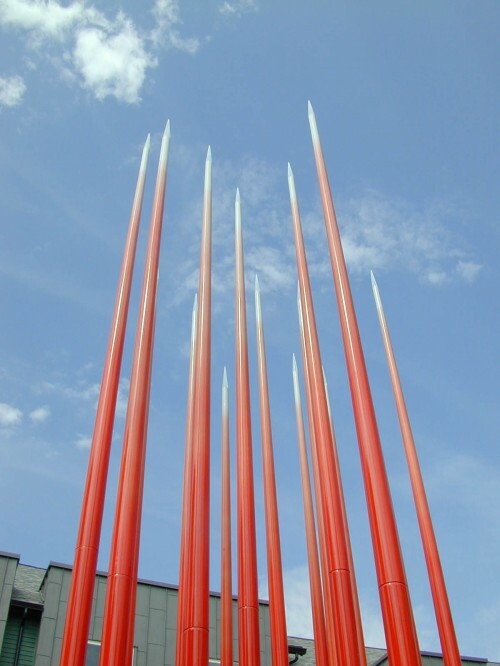 The rods are painted fire engine red that fades into a sky gray at the tips. 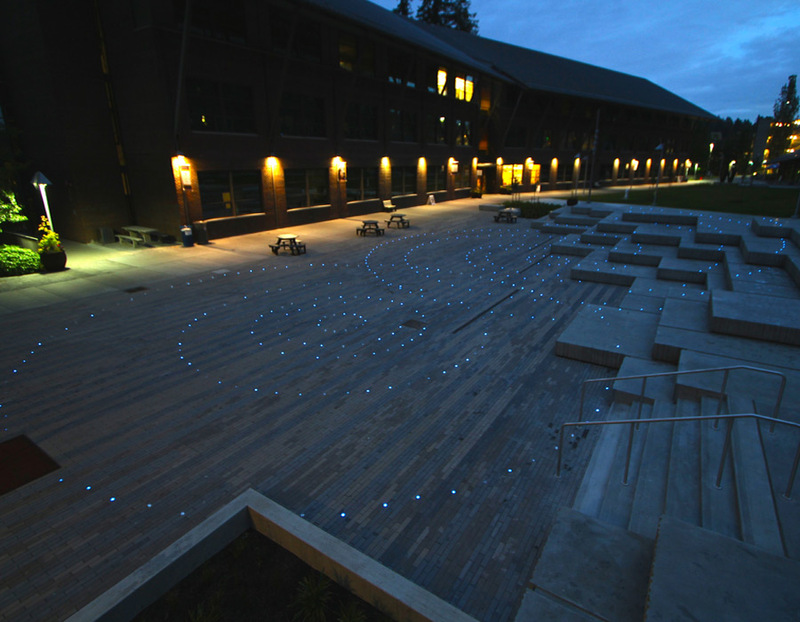 In the evening the tips glow an intense blue to match the color of the Fiber Optic Reed project in the nearby pond. 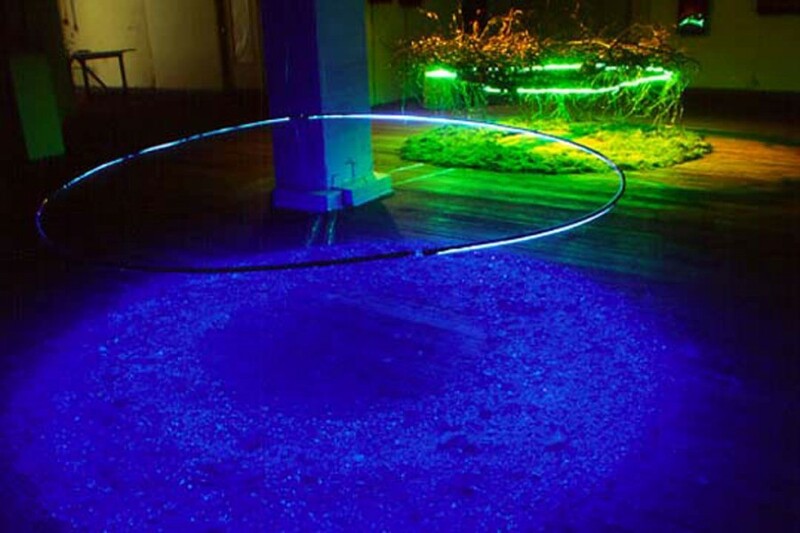 Both projects evoke a sense of transference of knowledge and information (antennae, fiber optics) and the use of high tech materials in juxtaposition to nature. 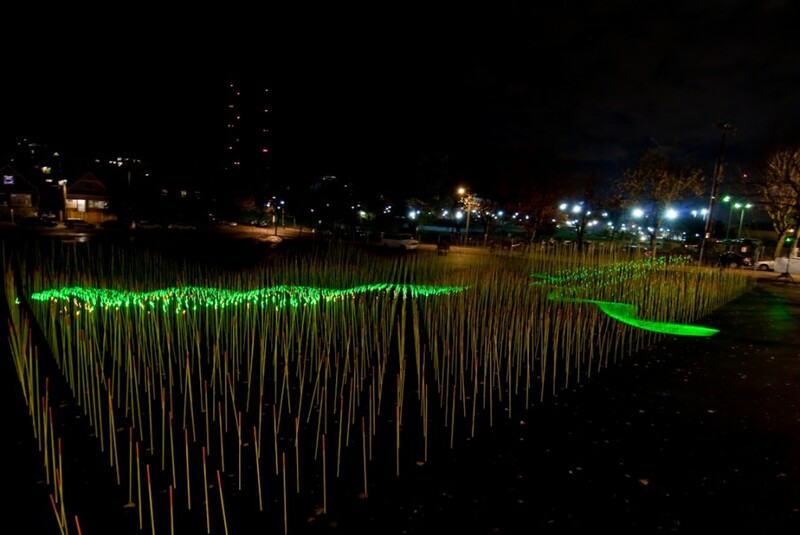 Antenna Reeds is a companion piece to a project called Fiber Optic Reeds that is also on the Nordheim Court property. 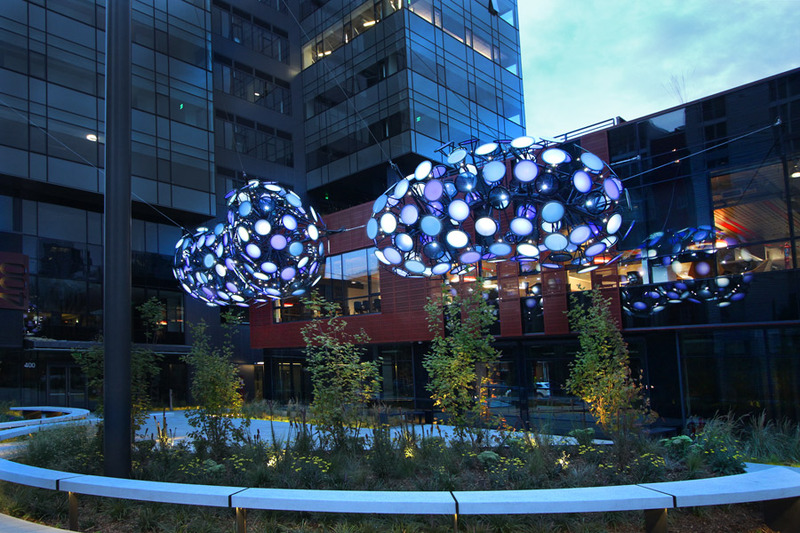 Both projects address transmission of knowledge and data as well as the importance of good communication skills...a few of the important things learned in university...as well as linking technology to nature in a very hip urban environment. 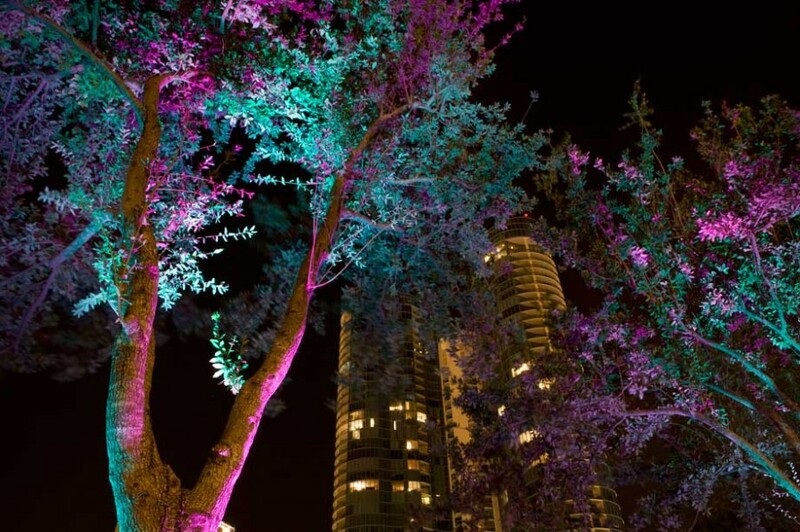 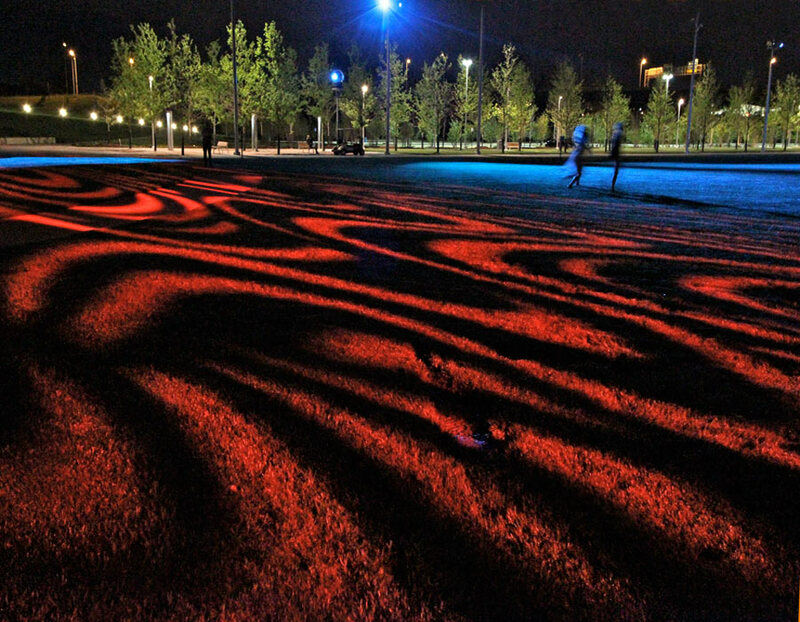 In downtown urban park devoid of “nature” and plant material, the specialty lighting added to the giant canopy lights up the park at night with a series of ultra low-resolution videos capturing the movement of natural sequences (eg:moving water, a breeze moving branches, fire, clouds, pulsating jellyfish). 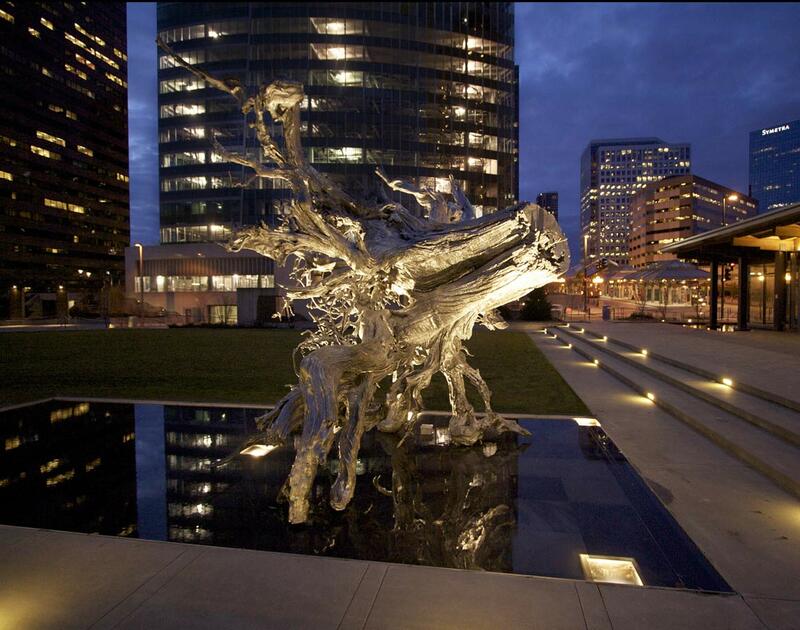 Looking from a distance or watching reflections in windows compresses the movement into discernible form. 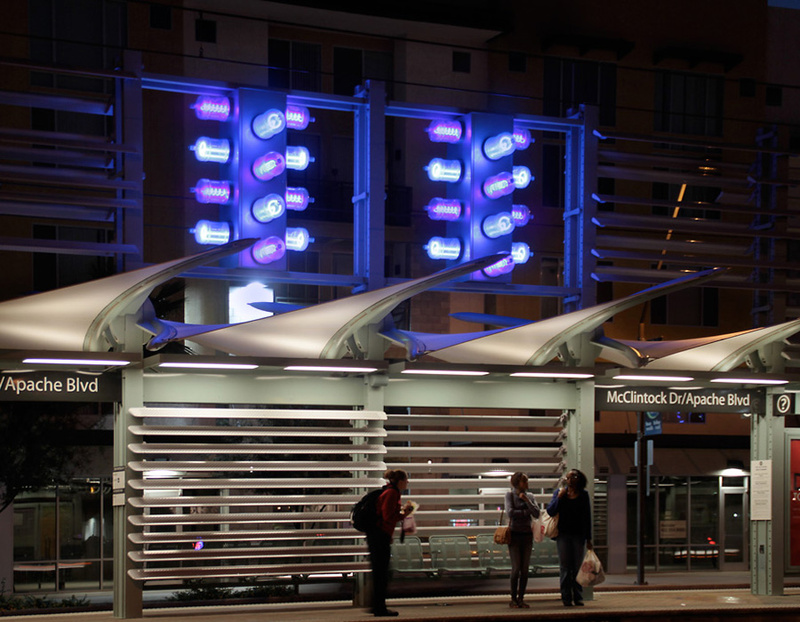 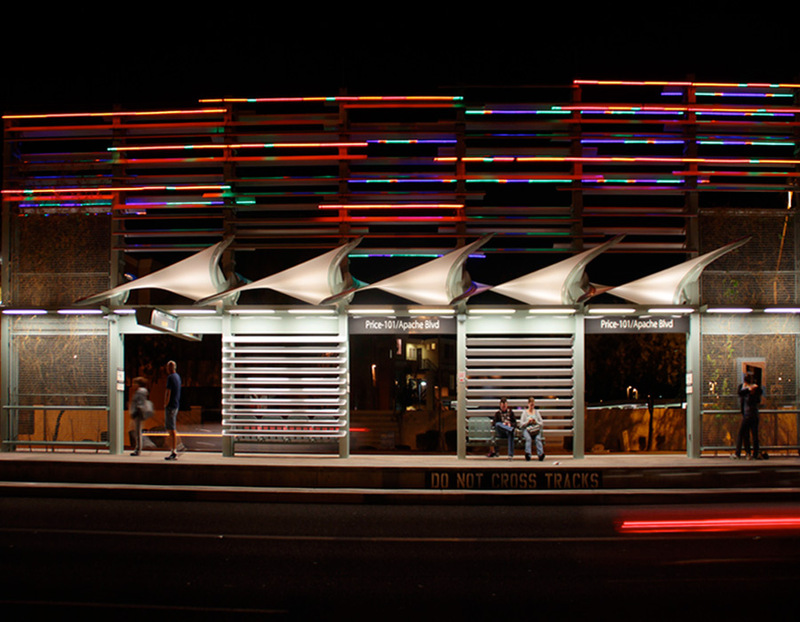 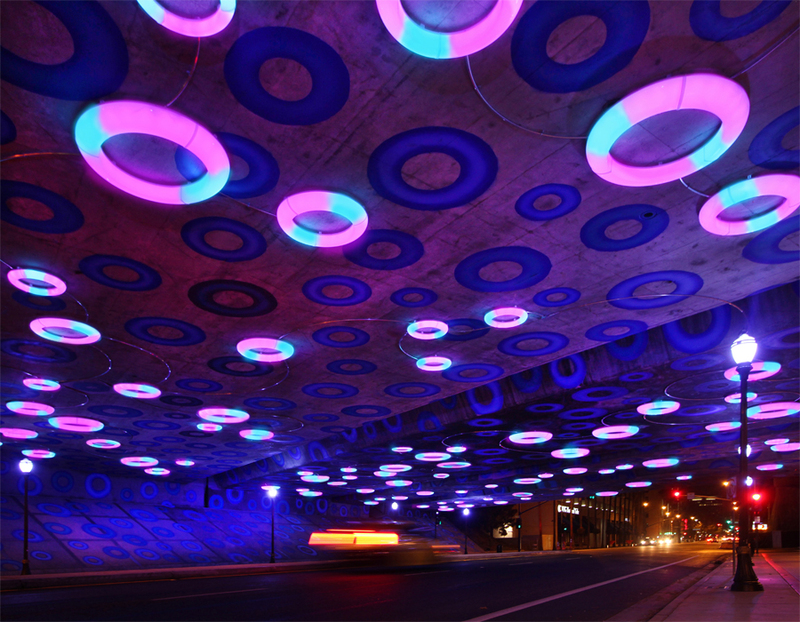 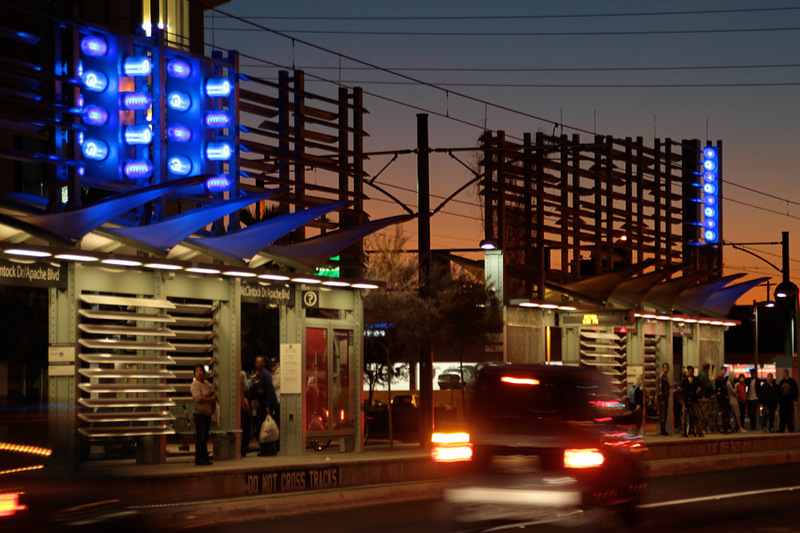 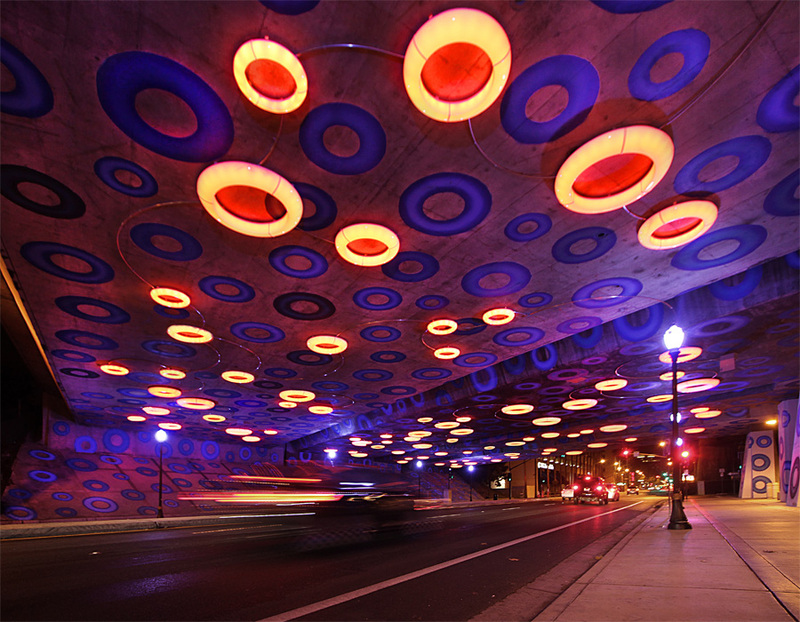 A series of illuminated “water bottle” chandeliers marks the top of the Metro Valley light rail station. 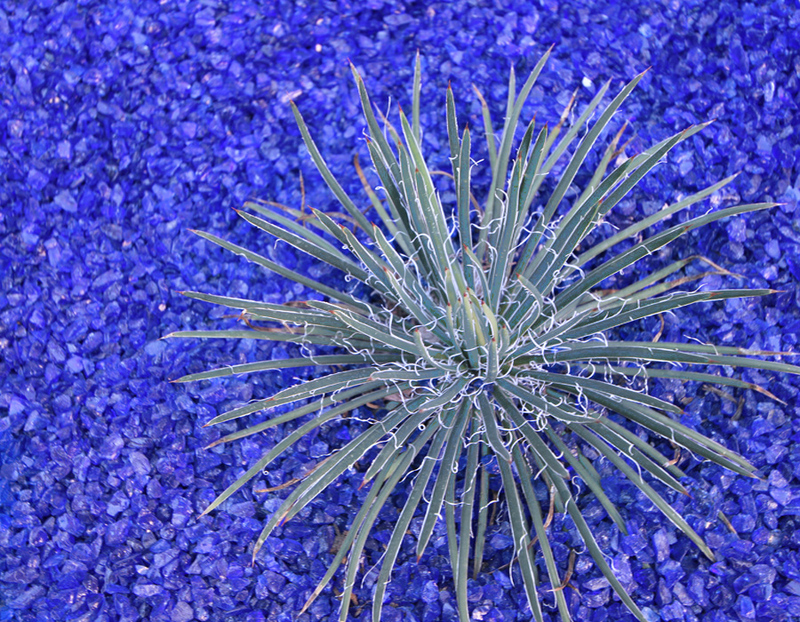 The new adage: “water is the new gold” draws attention to the preciousness of every water drop in the desert. 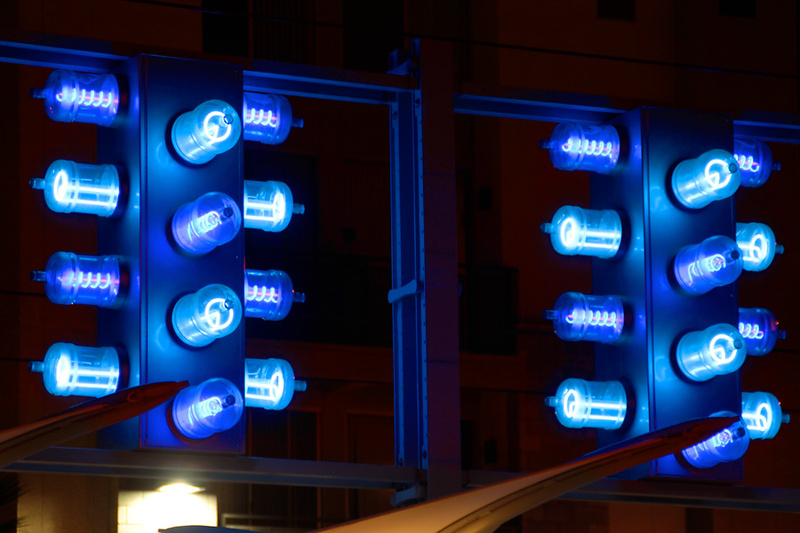 Enlarged “compact florescent” shape neon tubes, cause the water bottles to glow a range of blue colors, providing a nod to both energy savings and ecological stewardship. 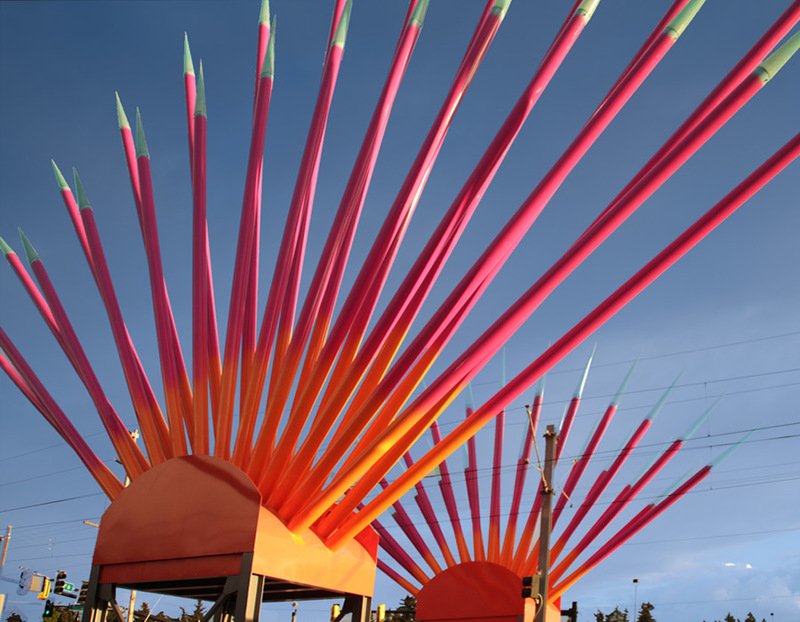 Referencing the 1st Multnomah County Fair, Latino Cultural iconography and the sunrise (from Portland’s perspective), these giant colorful fans produce kinetic moiré effects as one passes by. 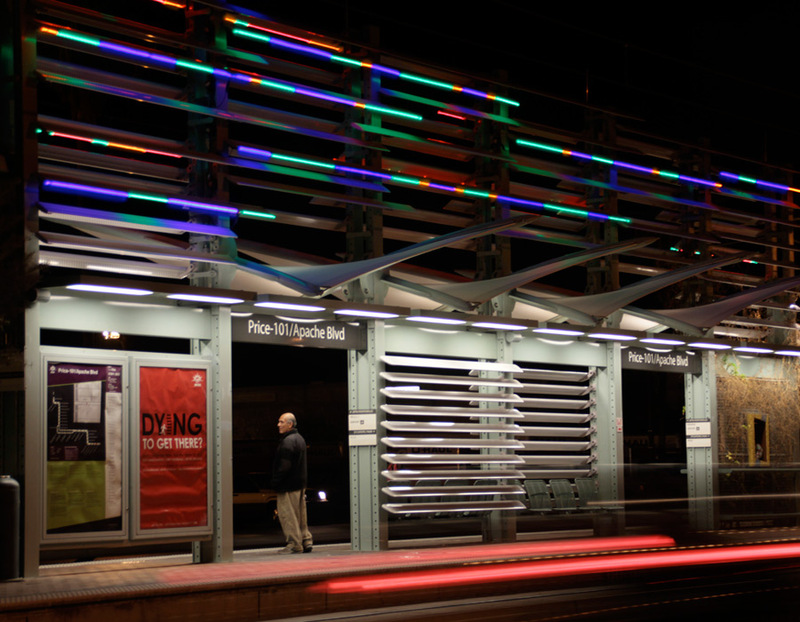 Triggered by approaching trains, the fans produce dynamic color sequences for 5 minutes before shifting back to aqua colored tips. 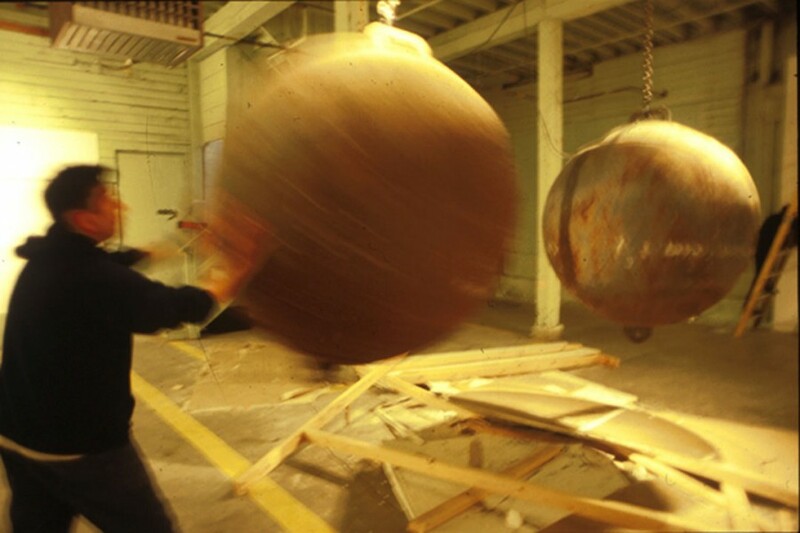 Rockwood's ethnically diverse community is composed of many Asian and Latin cultures. 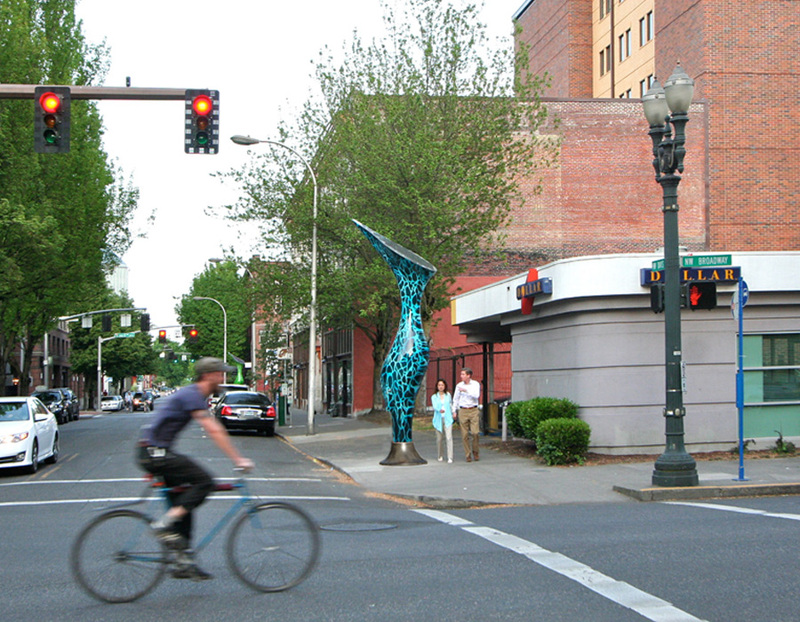 This area was also the home to the 1st Oregon State fair. 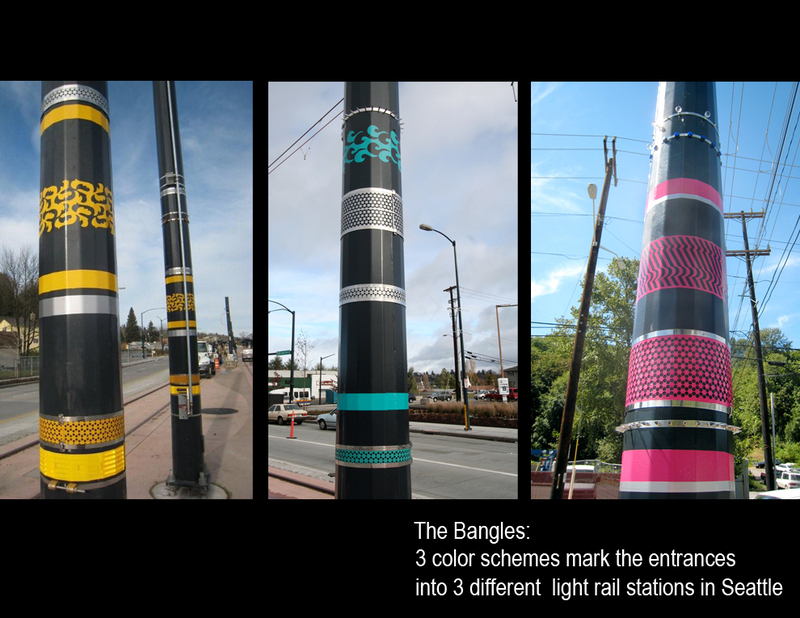 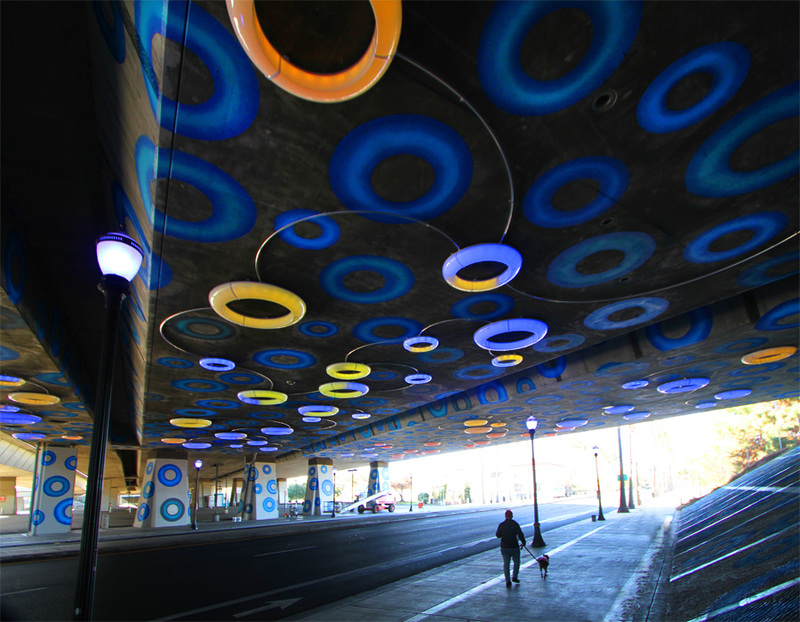 The colors, patterns and spirit of the project seeks to energize and help support a revitalization of the neighborhood. 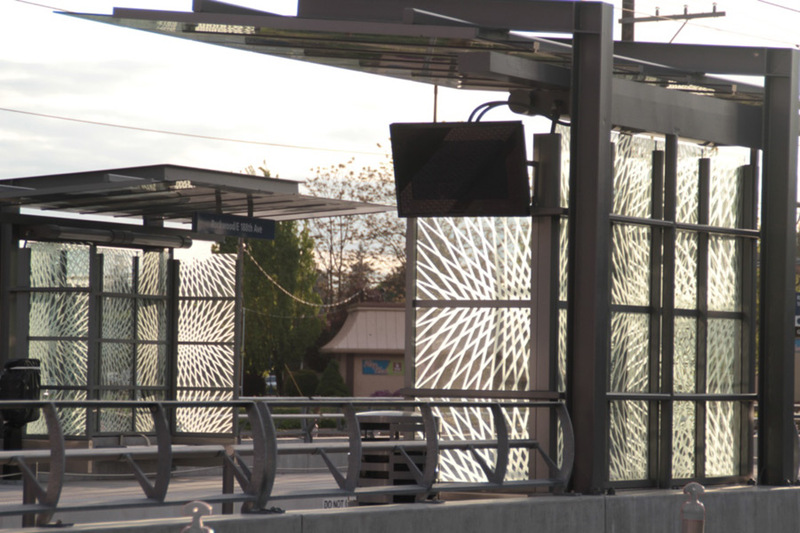 Etched safety glass patterning for the transit shelters was also a part of this project. 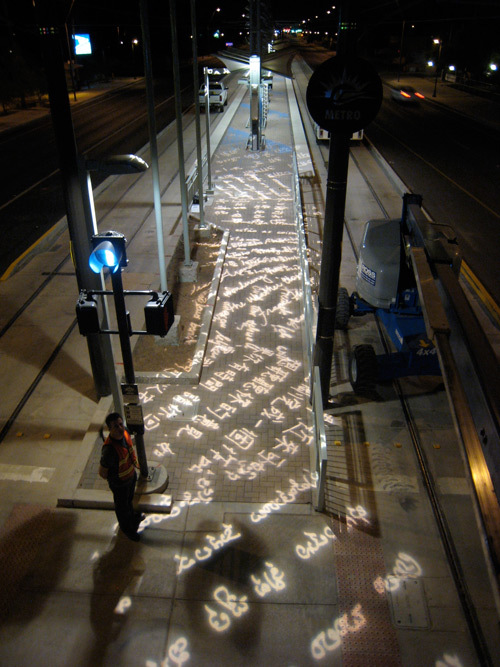 There are over 70 languages spoken in this very diverse and international community. 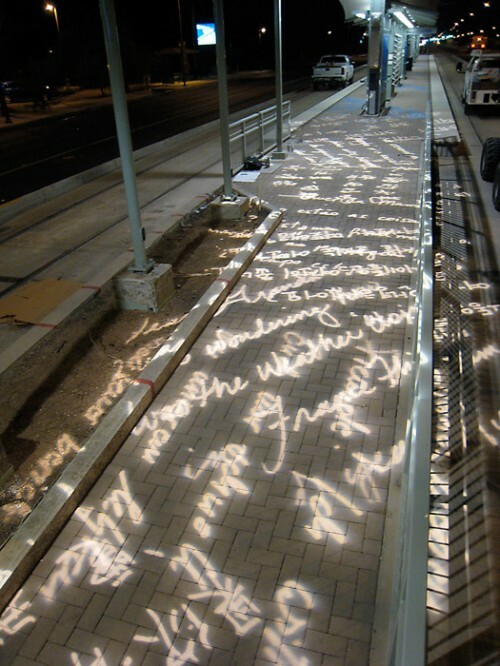 This light sculpture is composed of snippets of text taken from letters to grandmothers in 9 of these languages. 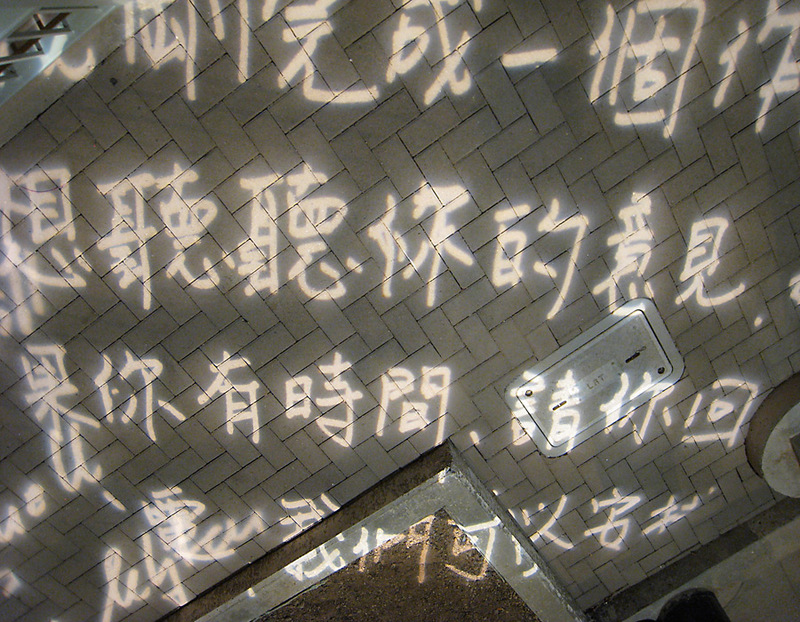 These phrases are projected onto the walkway to the station- literally walking through script and words from many cultures like walking the halls of the United Nations. 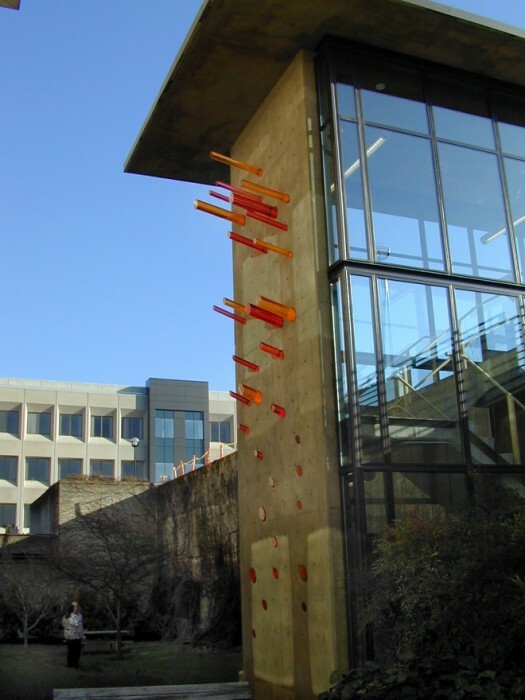 The Sculptures were designed as "guardian" door pieces for the side of a medical building. 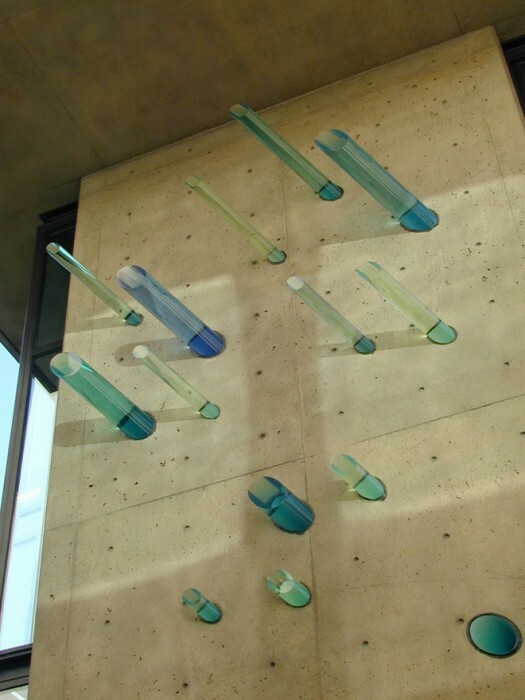 Glass columns contain water and IV tubing. 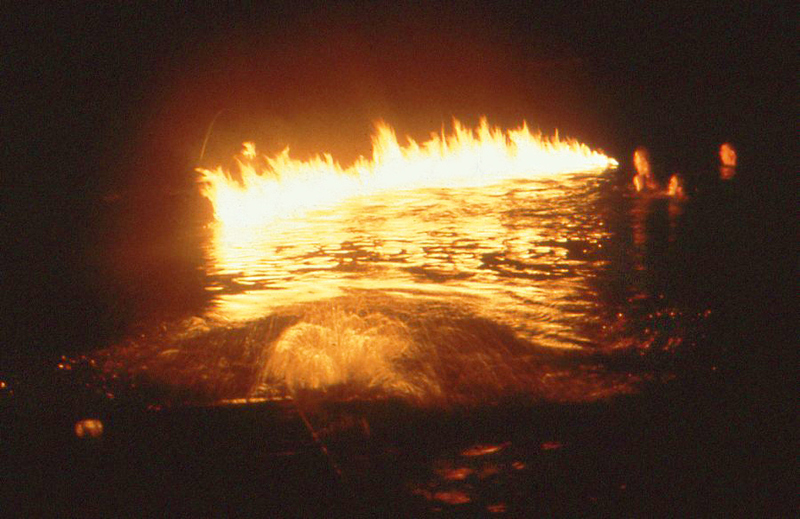 Below illuminated gas bubbles rise to the surface and erupt into flame. 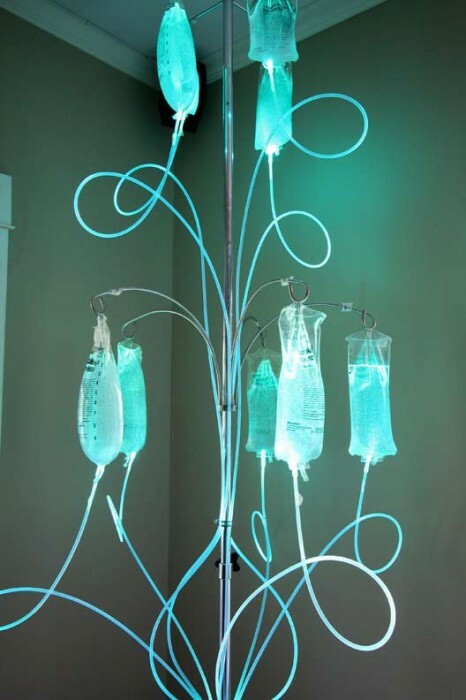 Drip IV with light blue light. 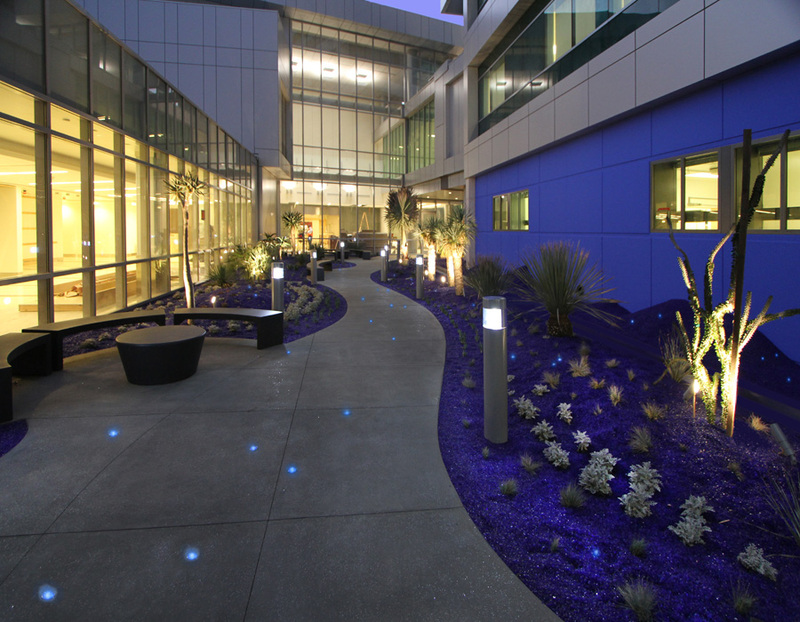 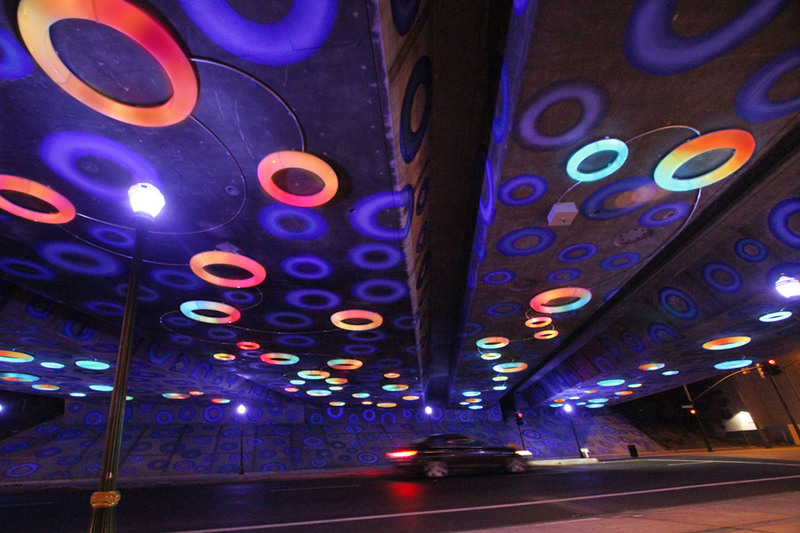 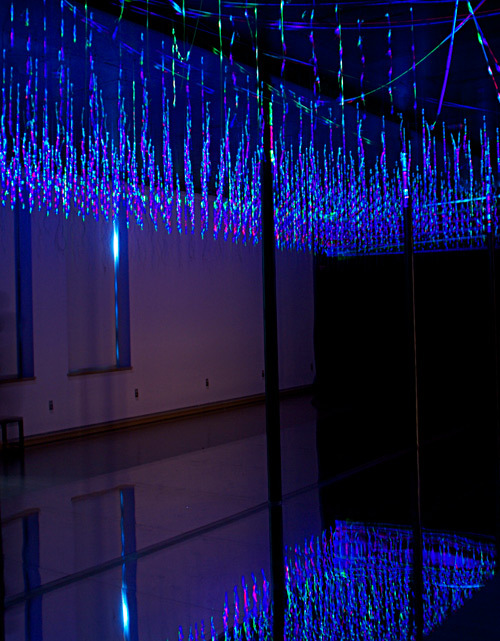 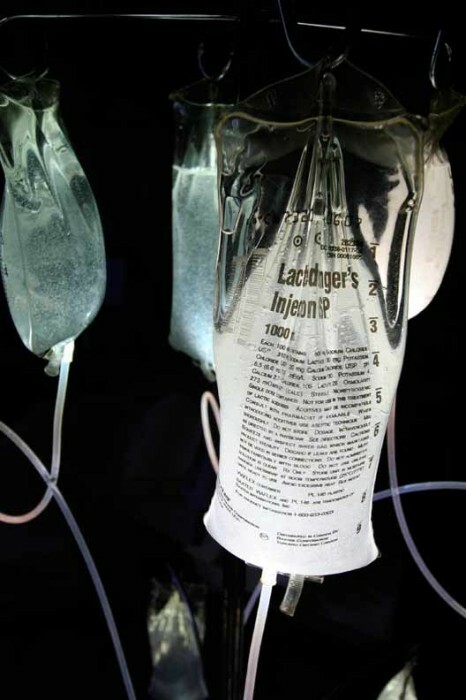 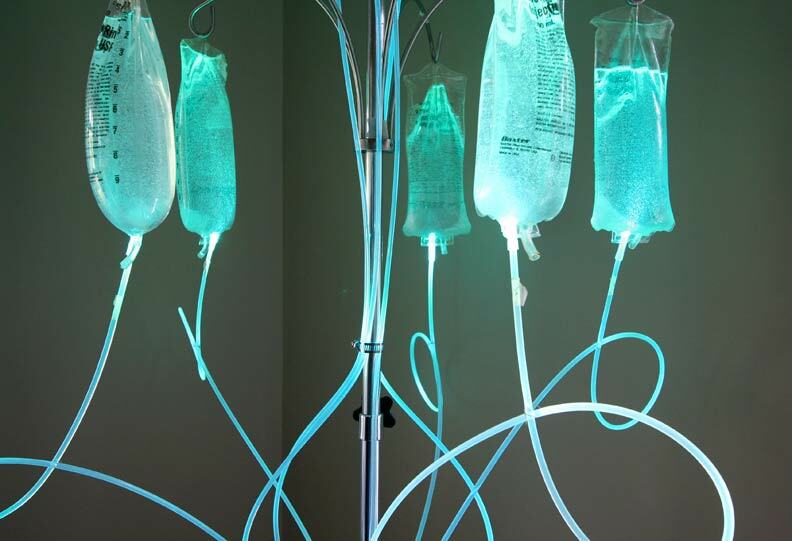 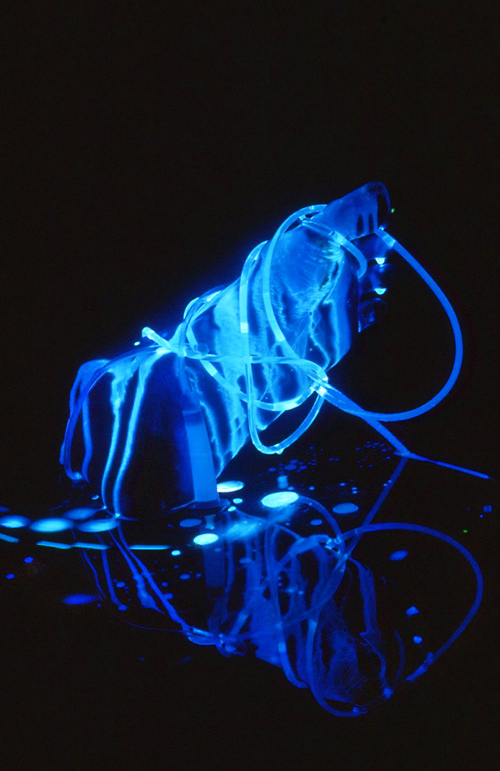 As this sculpture is illuminated with a fiberoptic lighting system, the color of the IV bags and dripping can be changed with colored filters applied to the lighting engine. 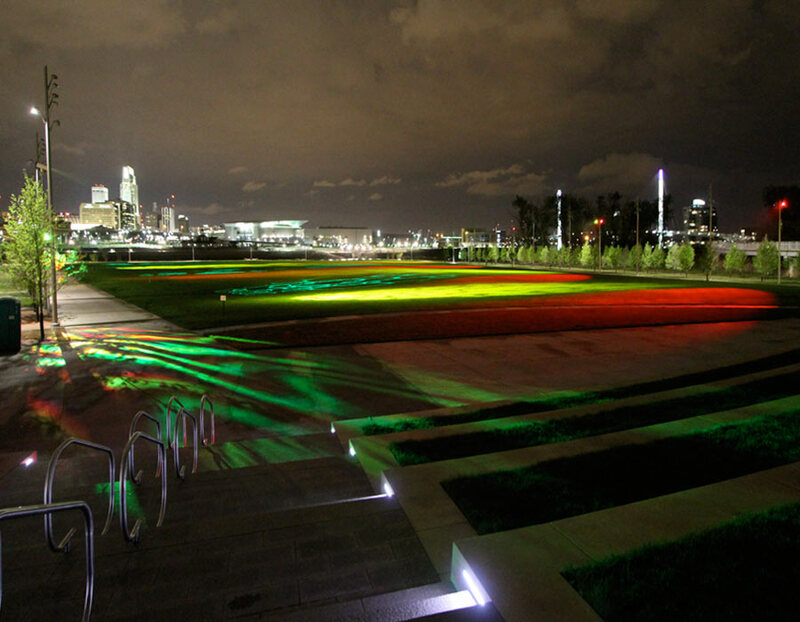 Very special thanks to Martin Blank of Martin Blank Studios and his team. 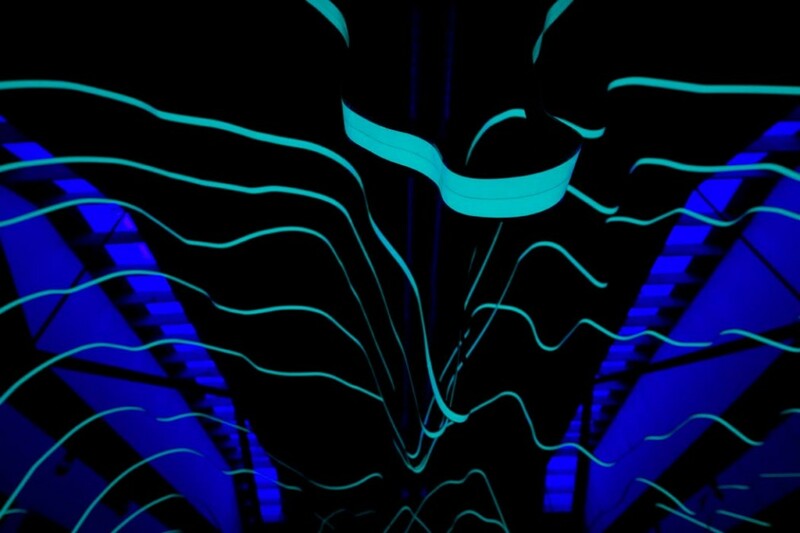 The project was composed from 6-8 foot long fluorescent tubes 10 feet under water, 100 ft offshore that were colored the hue of blue bioluminescent water creatures. 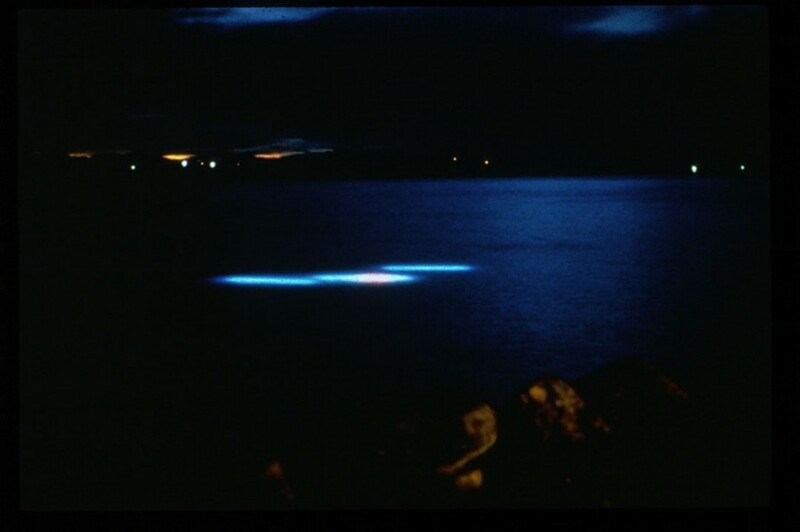 The tubes appeared to float 3″ above the lake surface when the weather was calm. 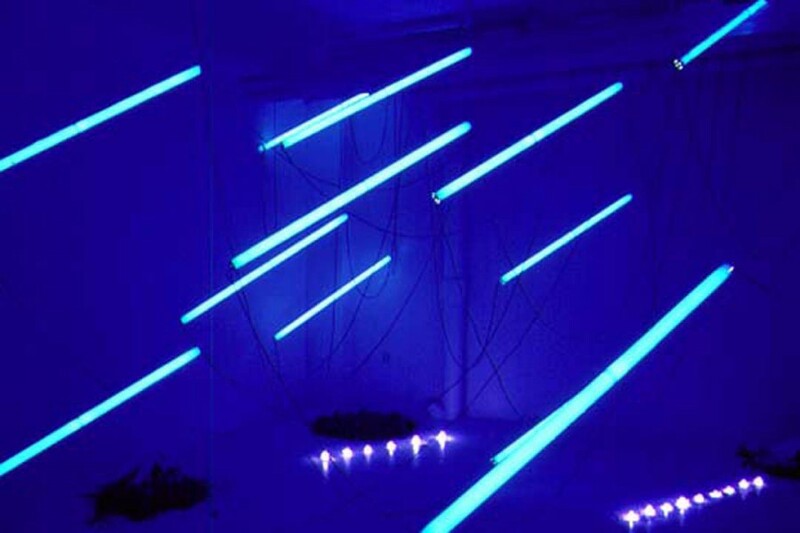 On other occasions, the light provided blue lightening like patterns, and when storms created swells, the waves were filled with volumes of blue light, and then returned to darkness. 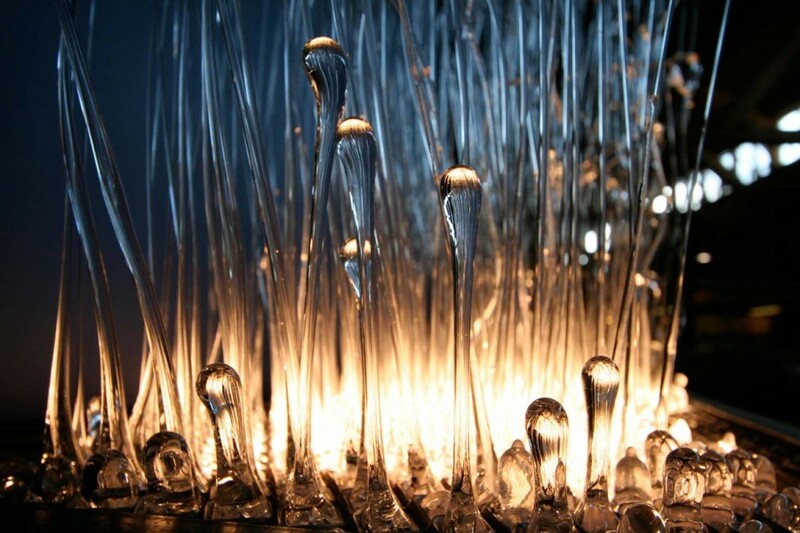 A timed exposure of the glass floats as they decended down the stream into the ocean. 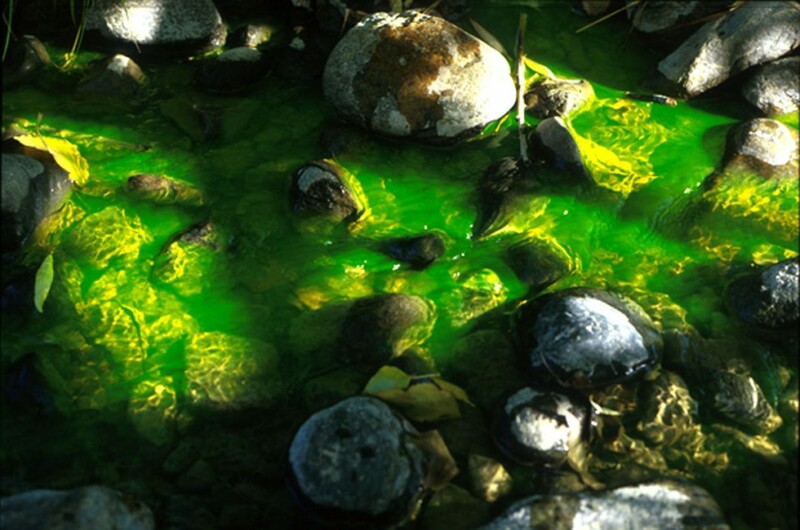 Japanese fishing floats were filled with chemiluminescent fluid and floated en-masse down a stream back into the ocean from where they were last found. 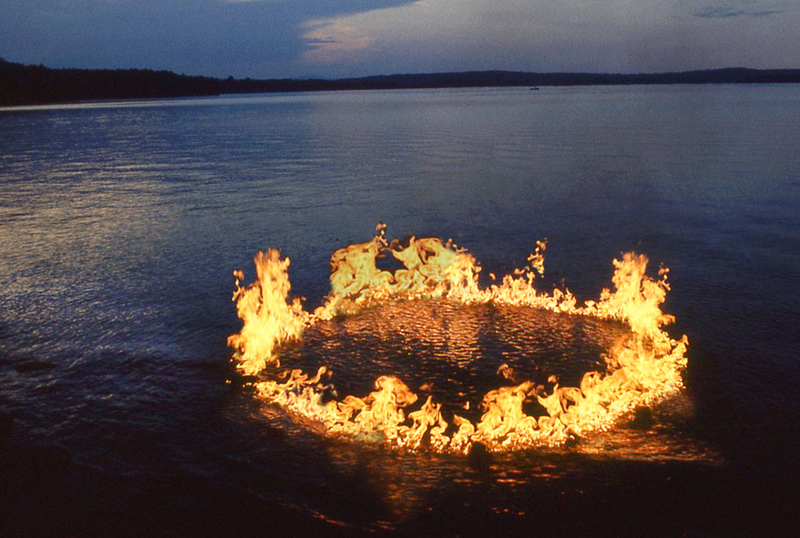 "15' d: water, propane flame: ©1991A site specific environmental sculpture of a 15 foot diameter ring with flames erupting up to 3 feet high. 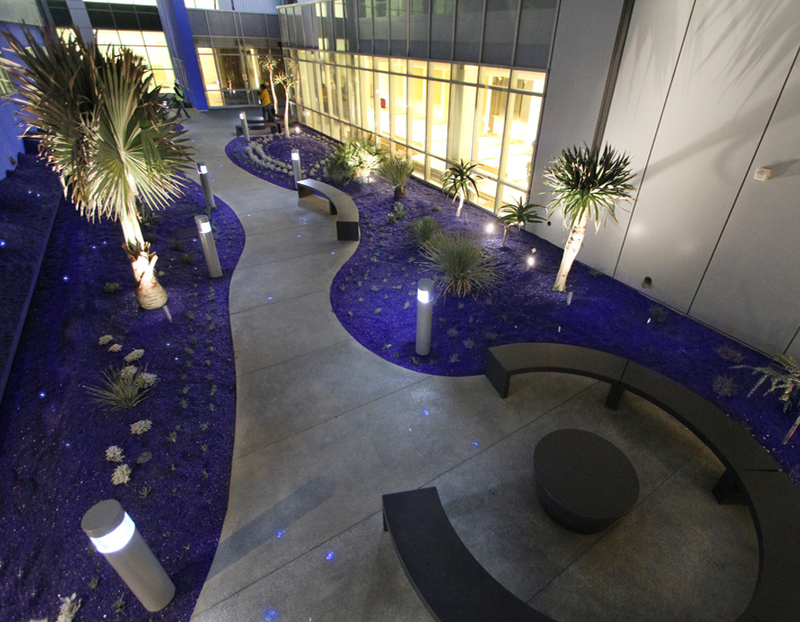 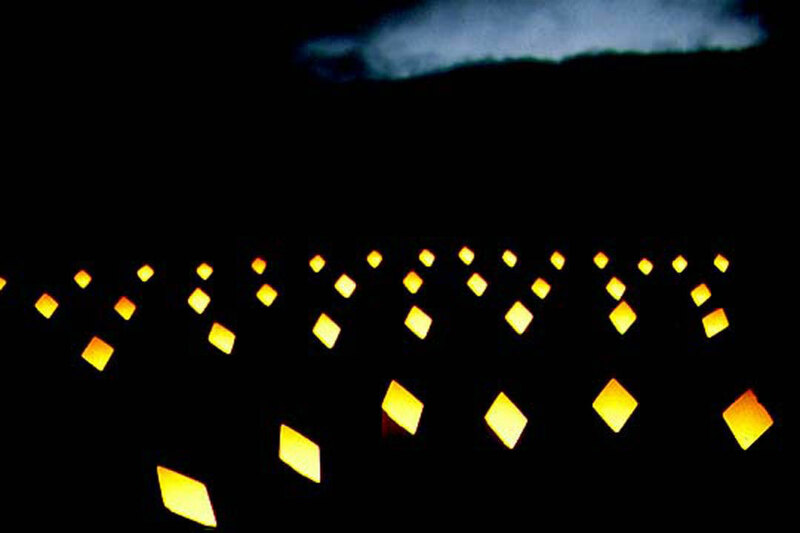 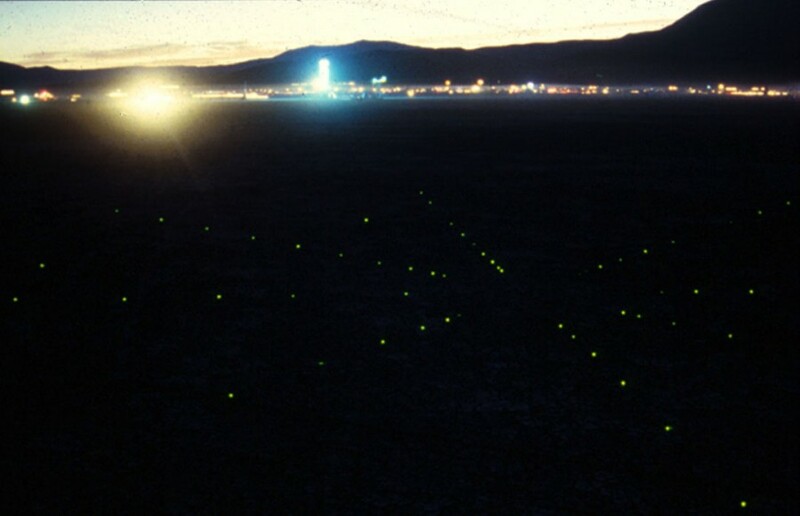 Hundreds of green blinking LED’s were buried in the desert floor in a large star landing strip pattern. 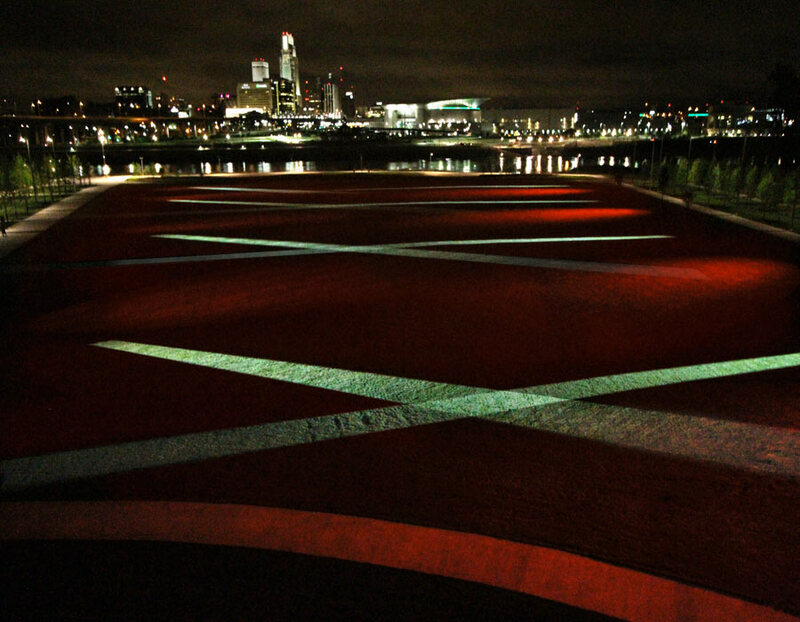 Not visible in the daytime, the large area became a visual pulsating magnet from many directions in the evening hours. 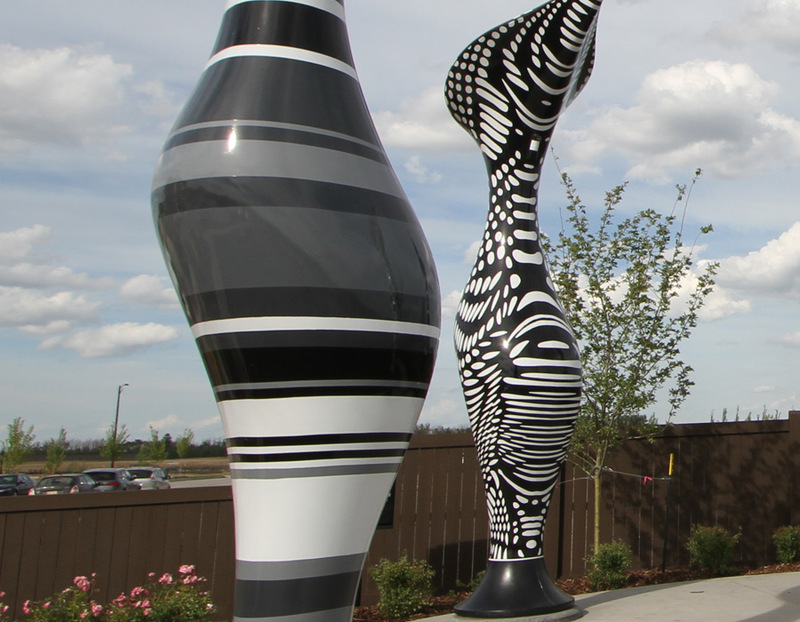 Special thanks to : Steve Monsey, Jeff Larsen and the installation crew. 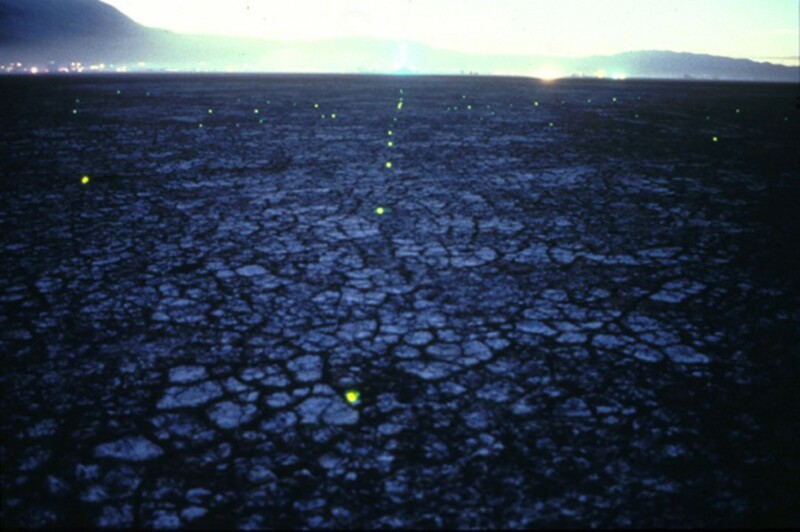 Post Apocalyptic Mythos was a temporary environmental installation created for the Burning Man Project in an expansive dry lakebed desert. 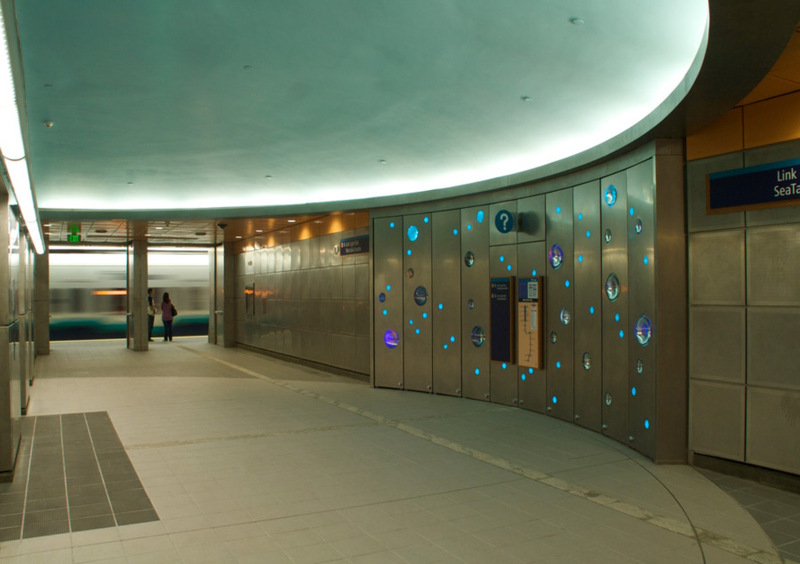 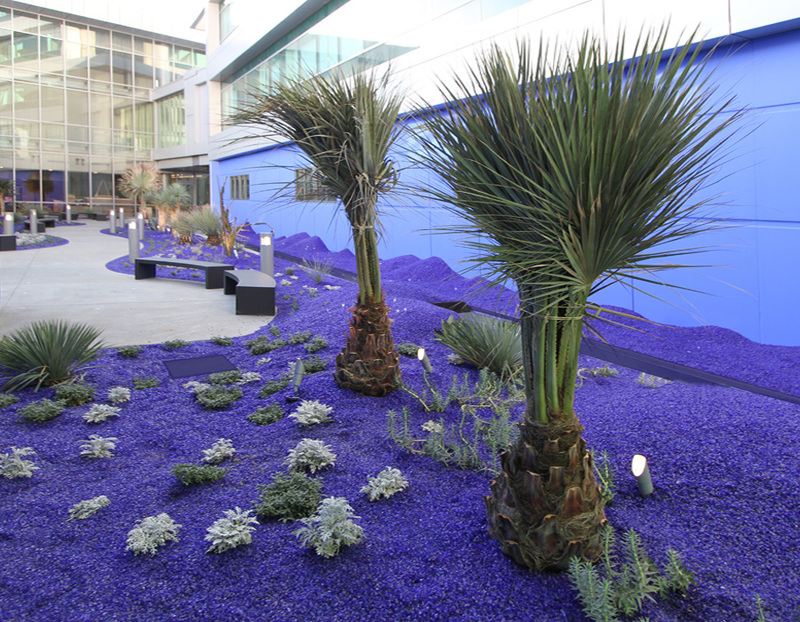 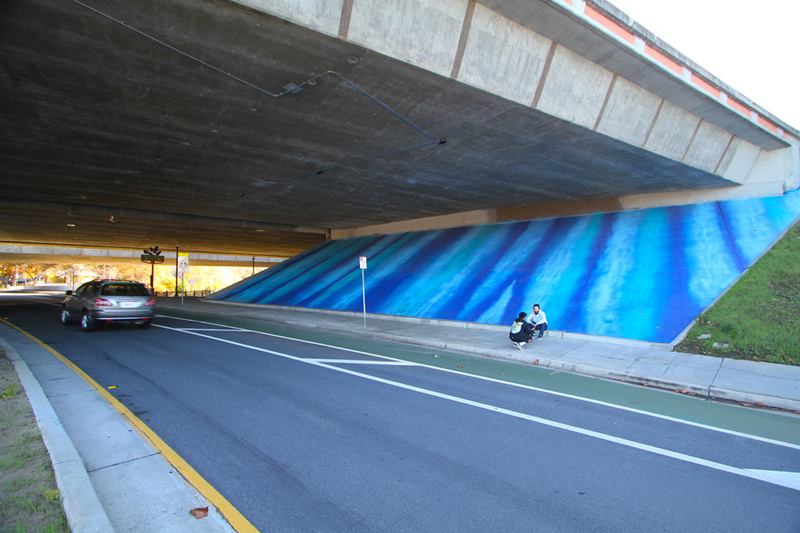 Neon wave forms were top painted to focus blue and turquoise light into the sculpted troughs. 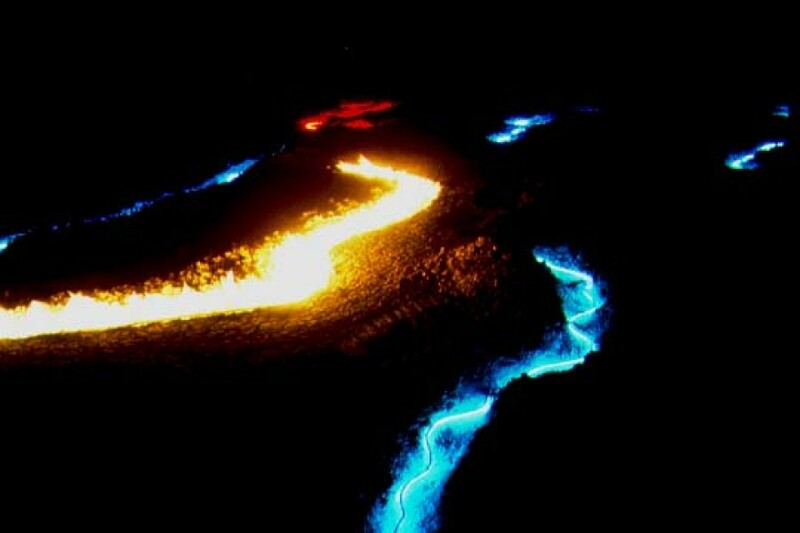 Fire erupted from another rippling trough, and a red neon snake matched the other light emitting undulating forms. 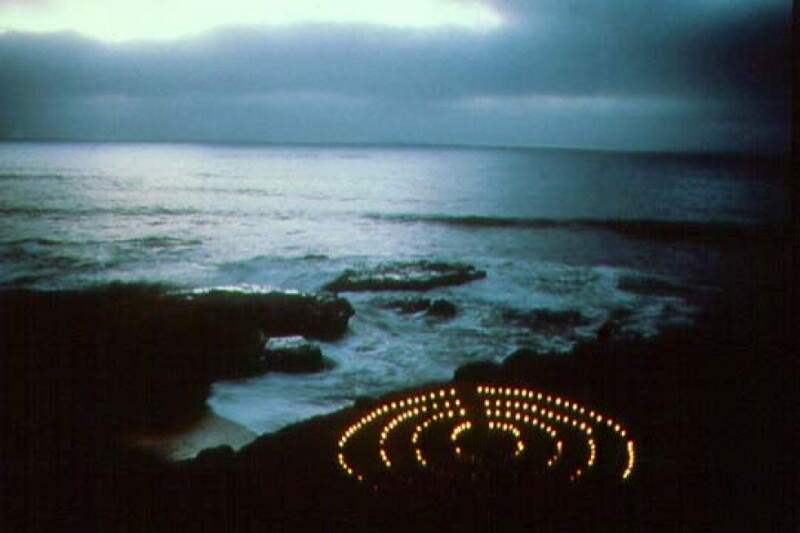 Imagery for this project was inspired by a previous exhibition in Prague titled Jeskyne Ohniveho Draka or the "Grotto of the Flame Serpent"
This fire medicine wheel was created as a temporary installation at the summer solstice on Sunset Cliffs in San Diego. 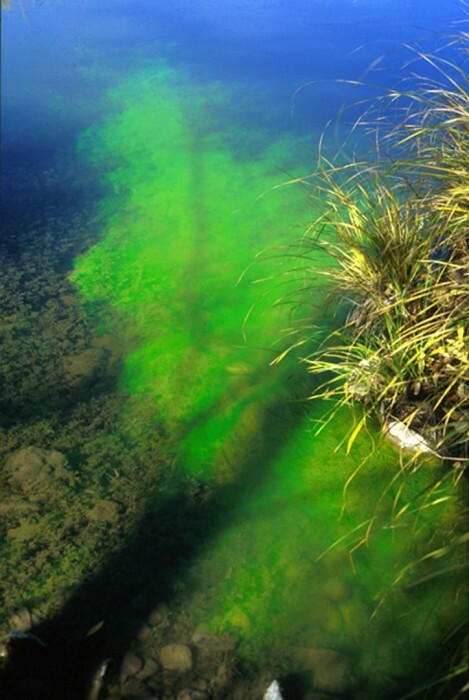 Veiled Aquifer Mist detail. 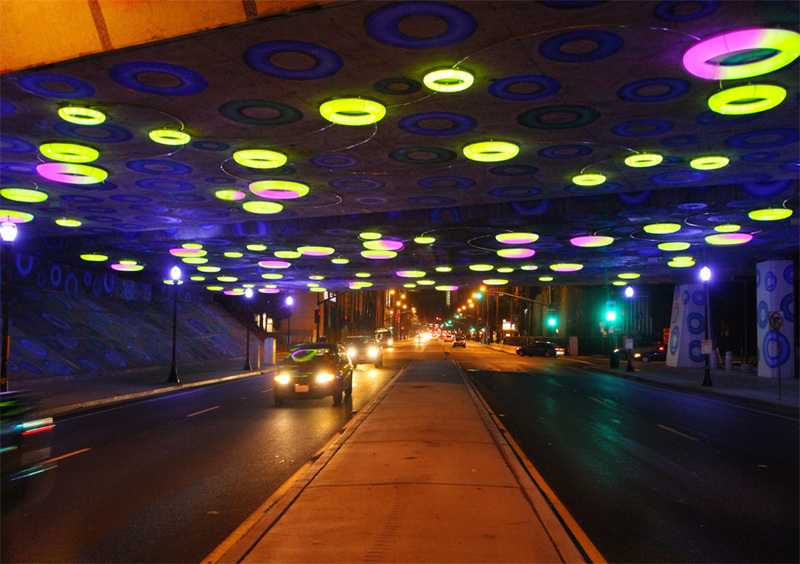 The project was a 3 month public installation. 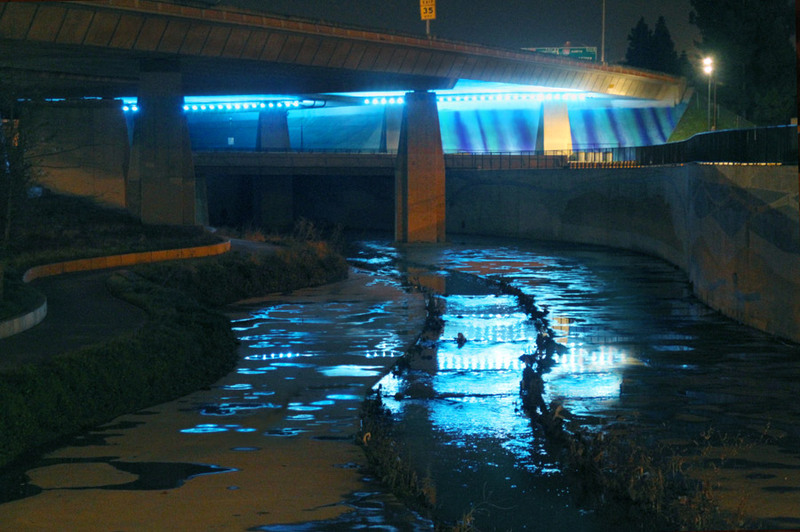 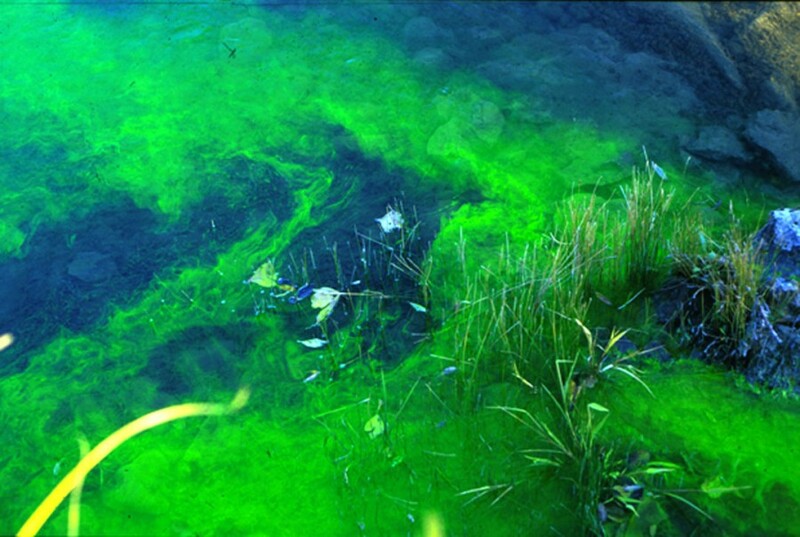 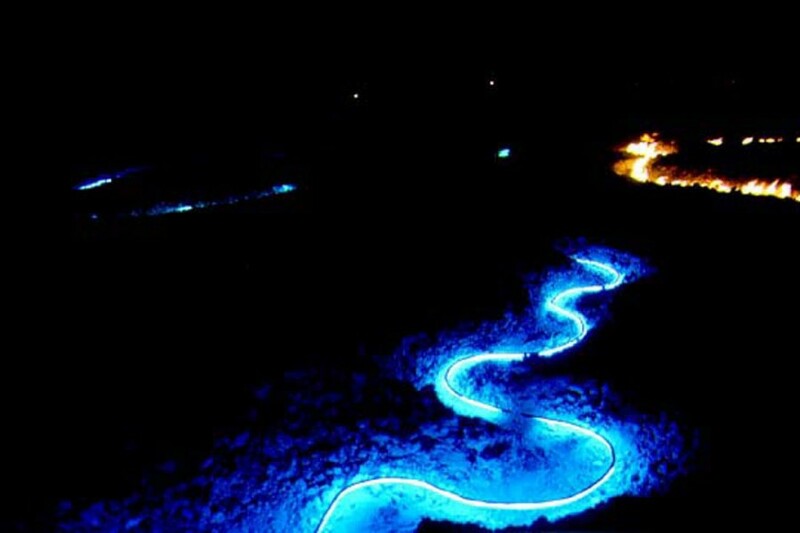 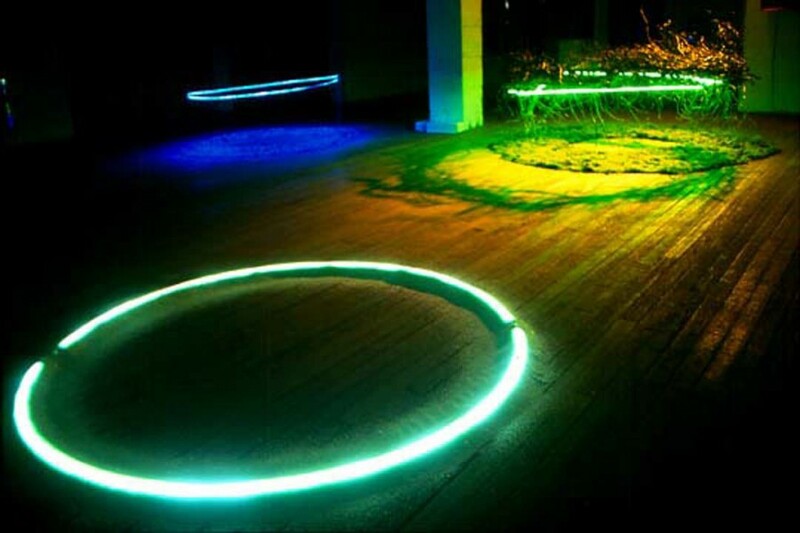 Created at the Ucross Foundation artist residency in Ucross Wyoming, a fish-safe Fluorescent water tracing dye is added to a river to make the invisible currents visible. 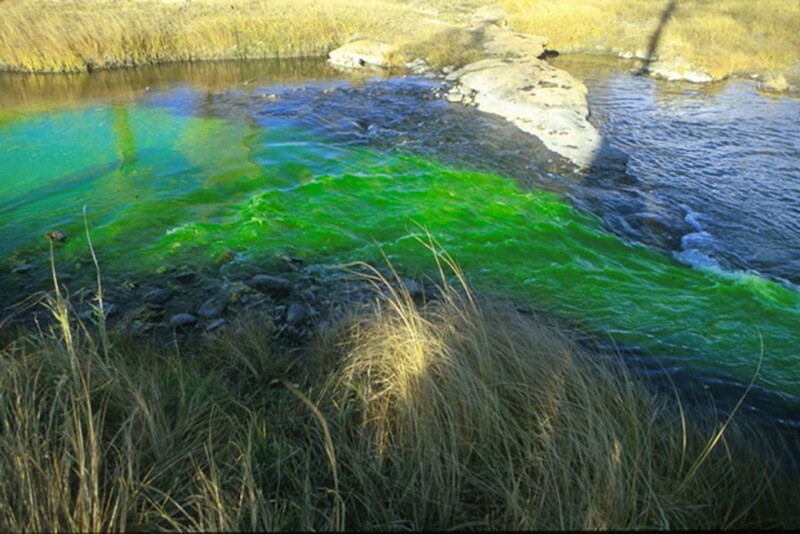 The toxic looking (antifreeze colored) dye transform this beautiful prairie river into something more curious and almost sinister for albeit a brief time. 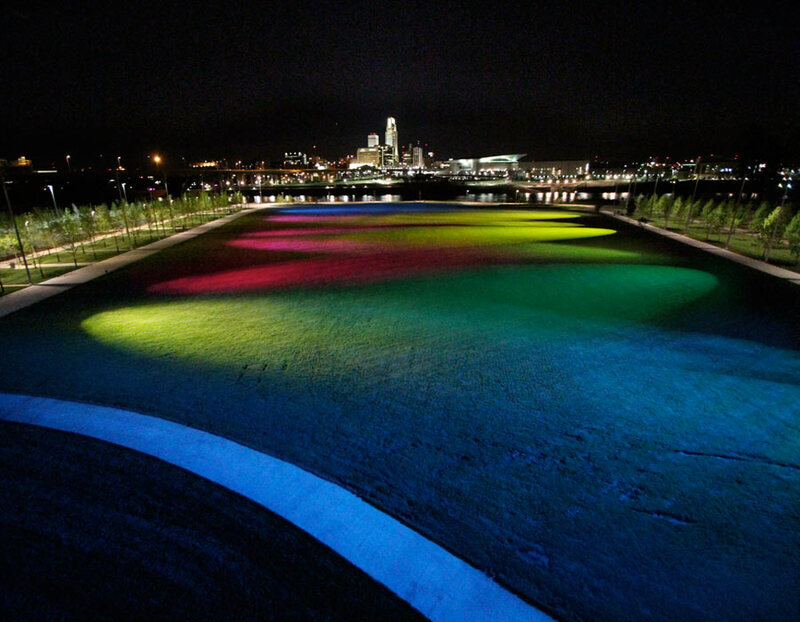 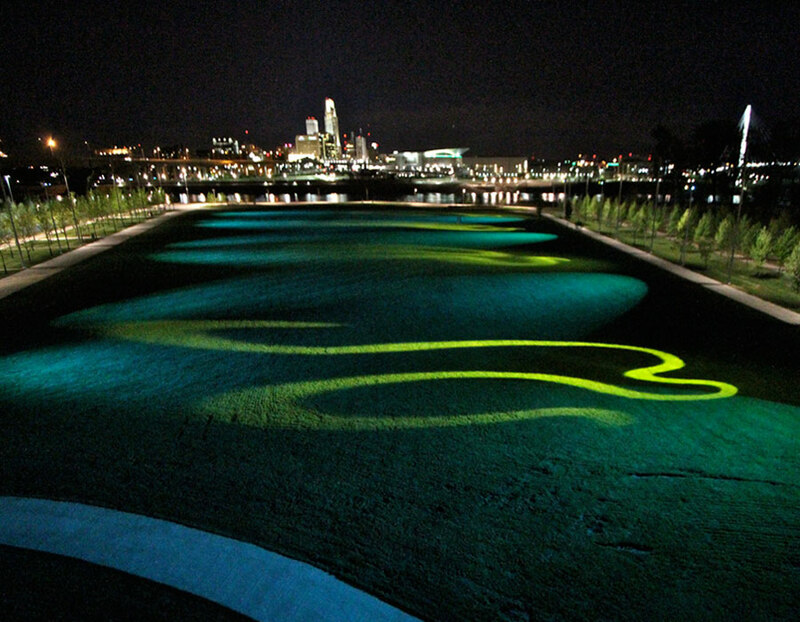 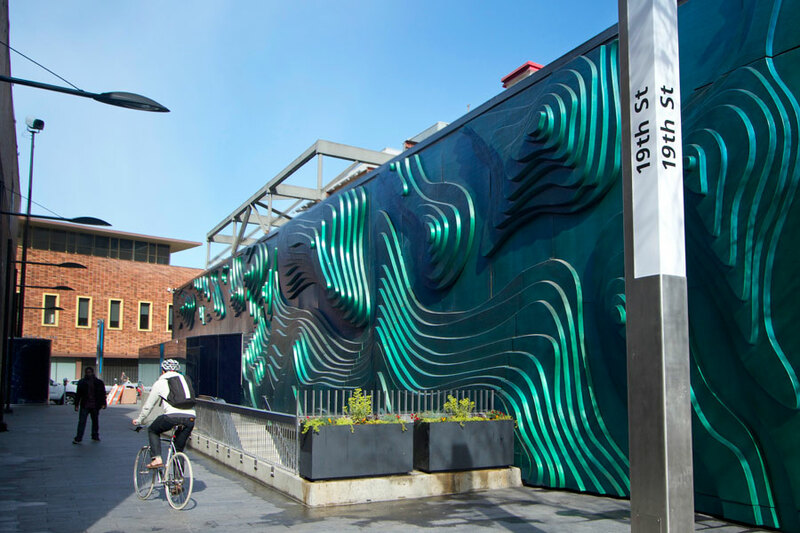 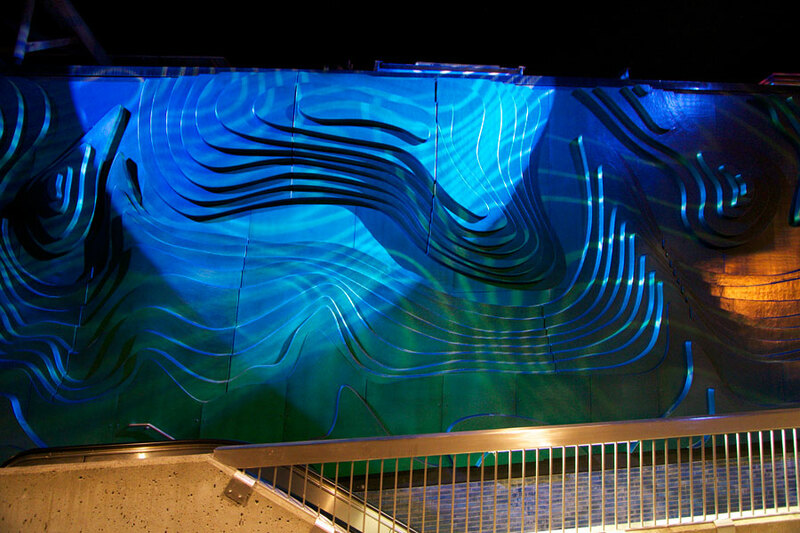 The art-action reveals the usually invisible patterns of water movement, eddies and currents. 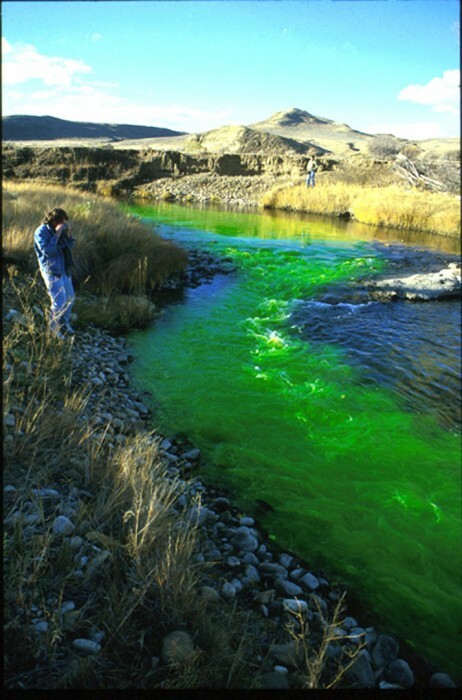 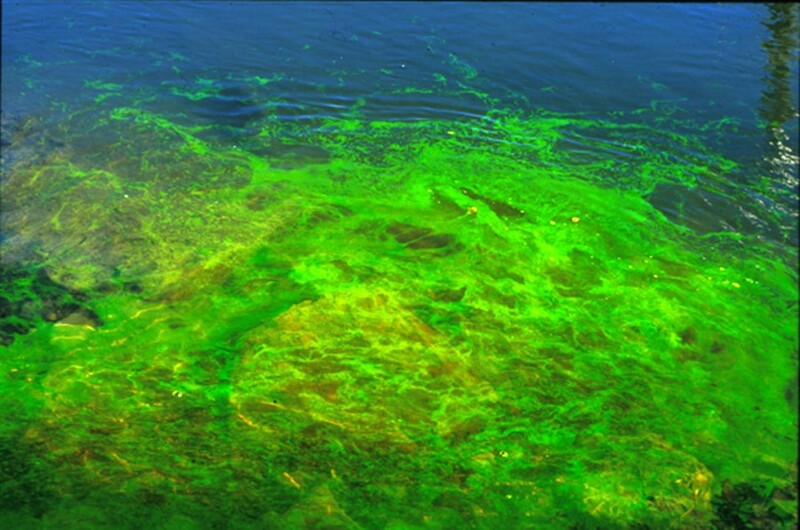 This dye is safe for fish and wildlife but creates a beautiful and highly disturbing ephemeral gesture within the landscape. 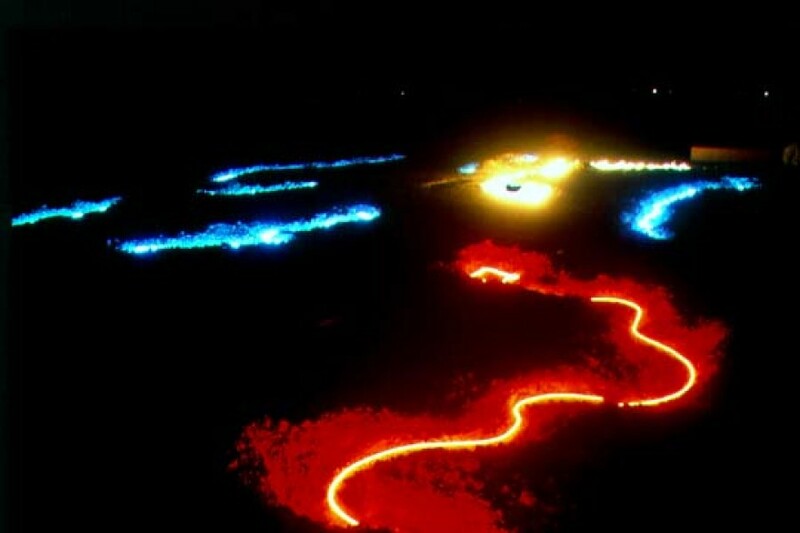 NIGHT FIRE SWIM was a temporary interactive sculpture in a beautiful lake in Skowhegan Maine. 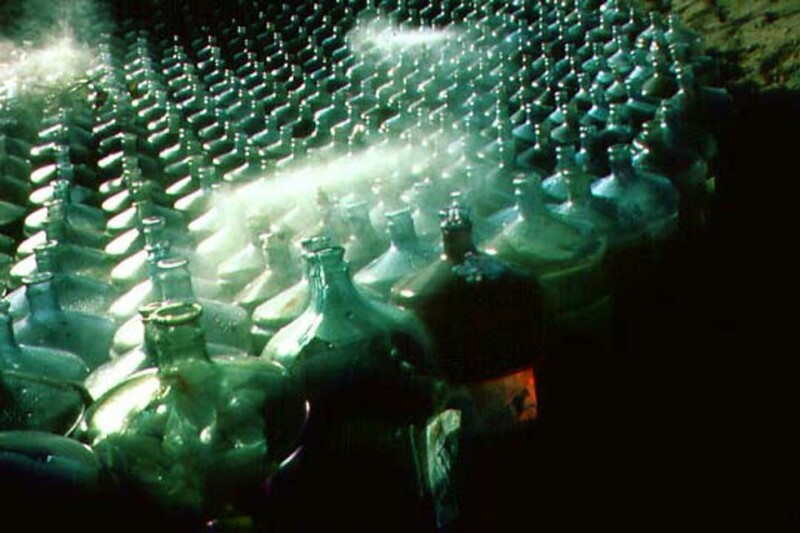 A 10' wall of gas-filled white bubbles was created under water. 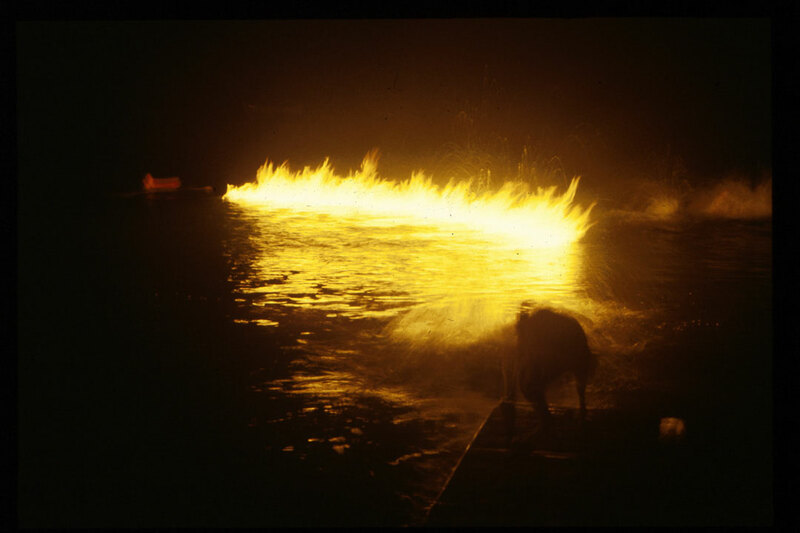 At the surface they erupted into 3' h flames above the lake surface. 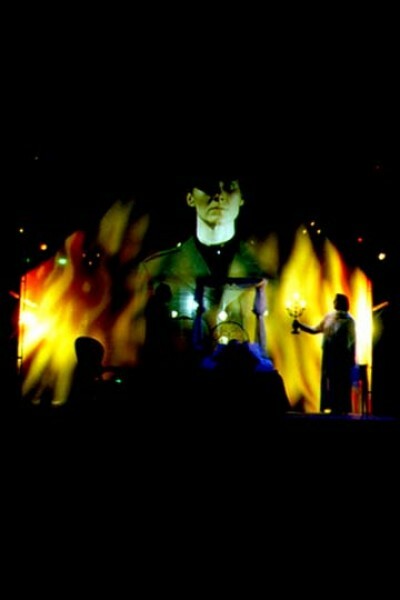 The audience/participants were urged to swim to the fire. 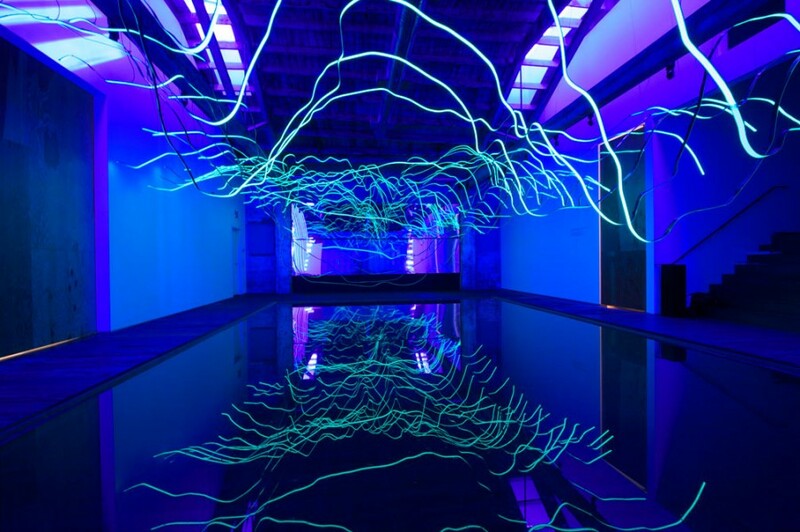 Under the surface, when they passed (swam) through the white wall of bubbles, the sound was like breaking icicles as they looked up to see the fire burning over head. 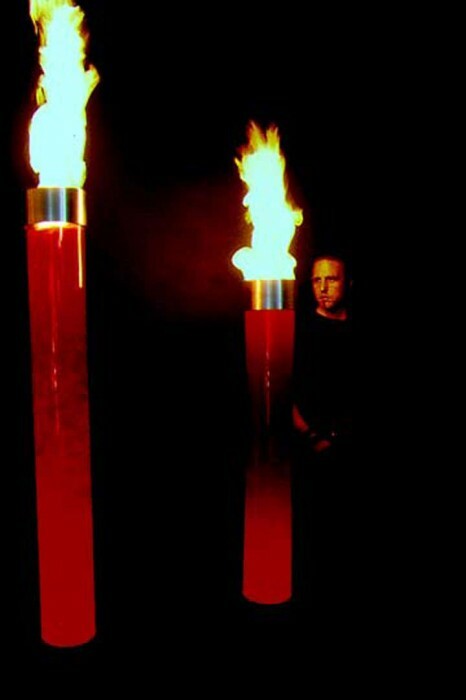 The viewer/ participants then, being wet, could approach the flame without fear of being burnt. 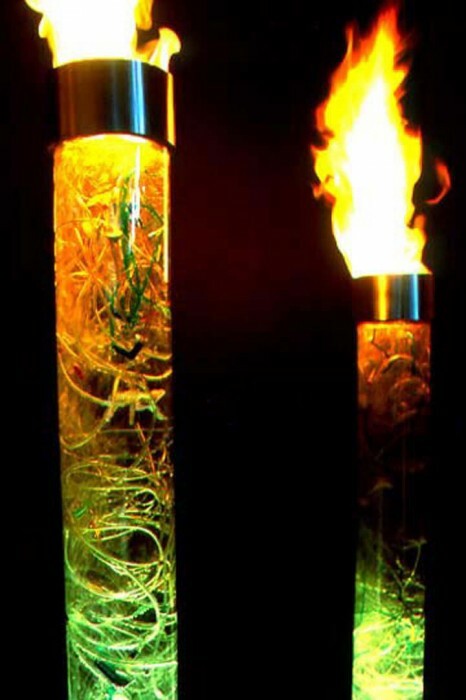 They could pass their arms through the bubbles allowing the flame to crawl over the arm without being burnt. 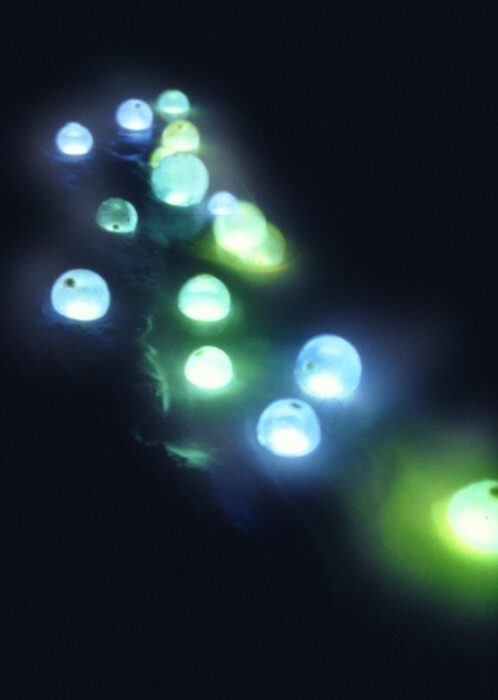 Then they learned to control the fire patterns by manipulating the bubbles' direction under the surface of the water. 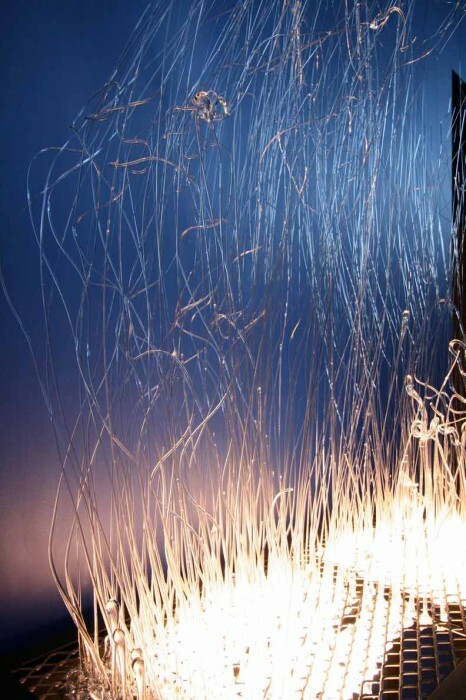 This project was designed to somewhat bypass the traditional cerebral cortex and to access that more primitive aspect of our brain stem... allowing us to access a more visceral and direct experience. 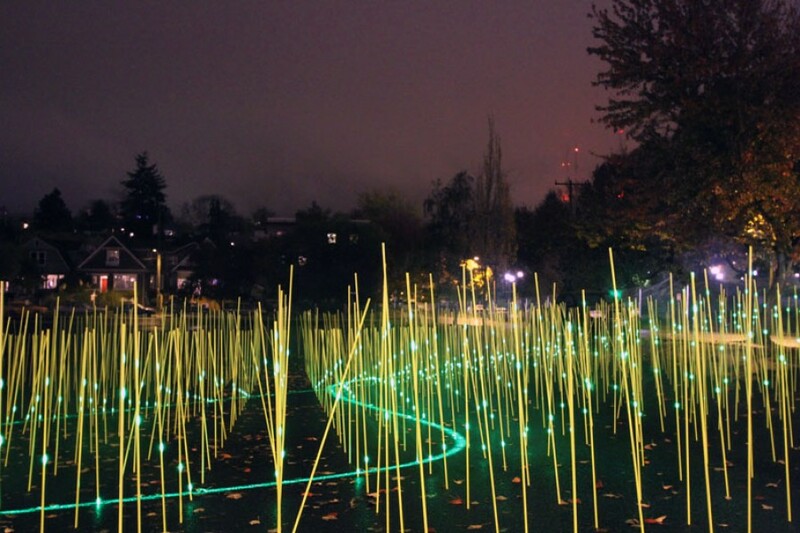 OSCILLATING FIELD is a temporary sculptural installation sponsored by Sound Transit. 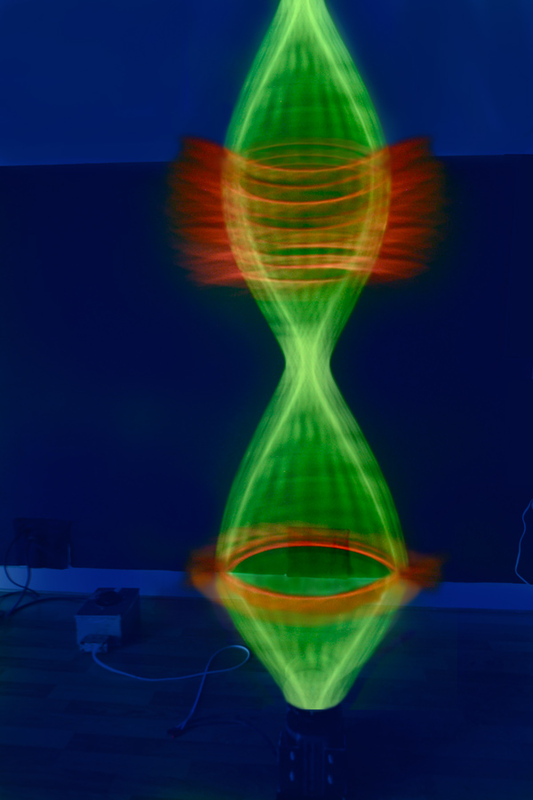 There are 11 different programs that sequence over a 35 minute loop. 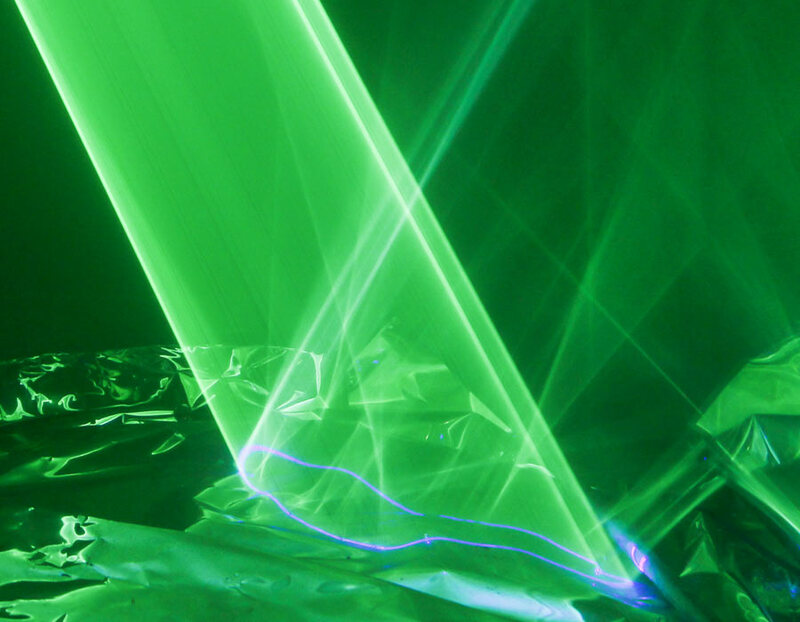 In the daytime it takes the form of a grass field, a hedgehog's back or a glowing yellow mist, while at night it transforms into a thousand surfaces for the dynamic play of an emerald green laser. 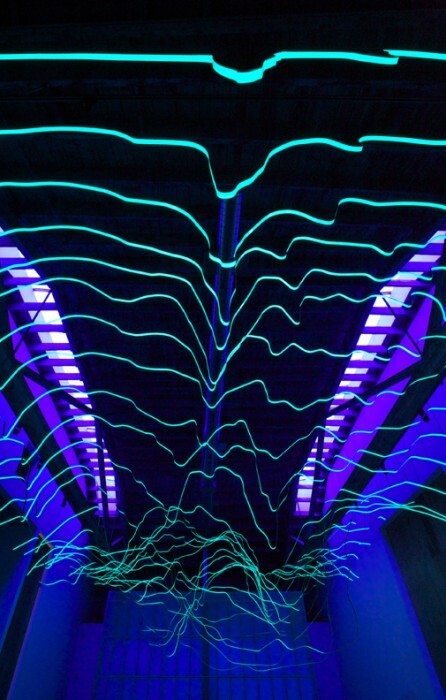 Every night between 6pm and midnight, the lasers illuminate the sculpture with a range of dynamic patterns and animations. 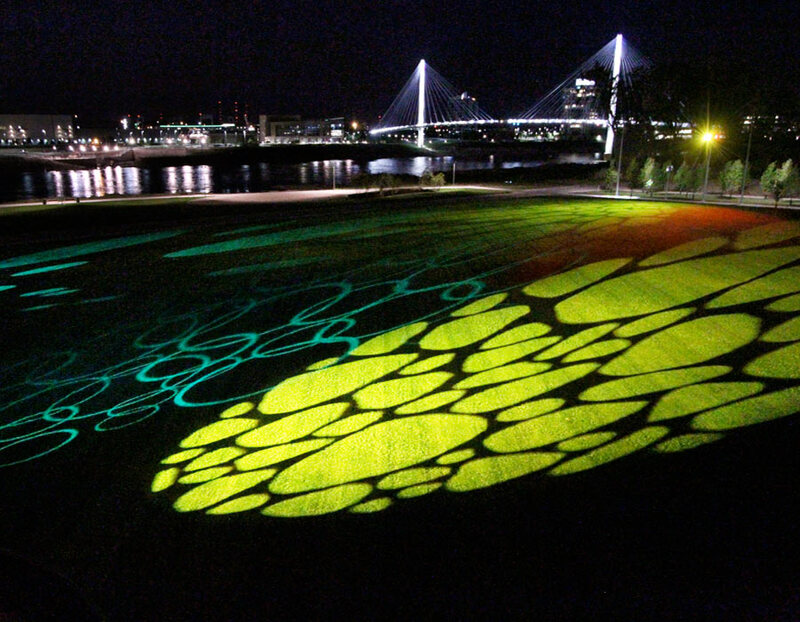 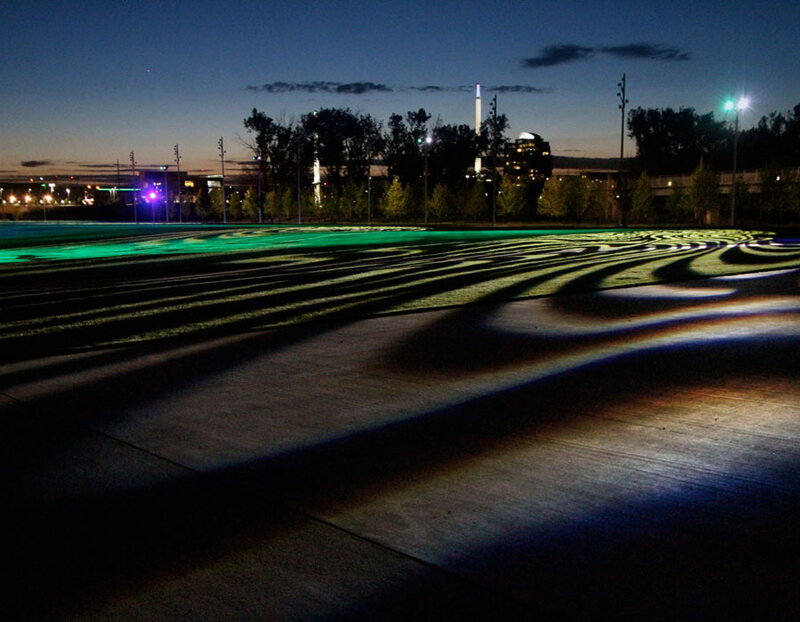 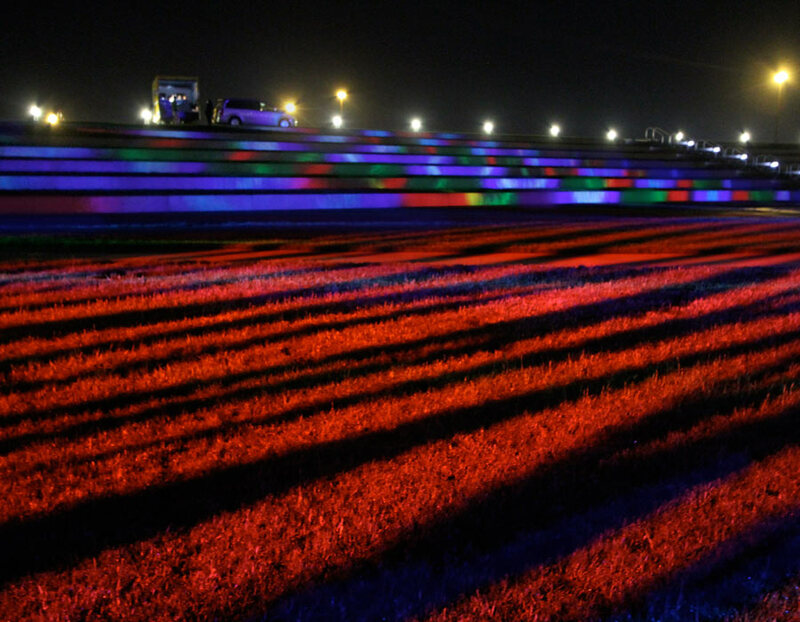 The exploration of topography and dynamic patterning over a large space transforms a once desolate parking lot into a delight of light, movement and magic. 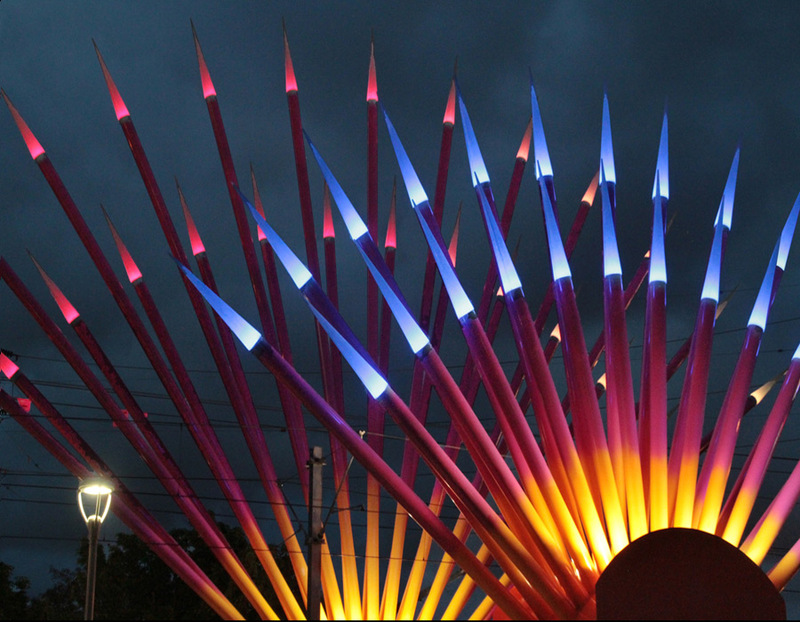 The project is composed of over 3300 florescent fiberglass stakes cut in 6" increments from 3-8' high. 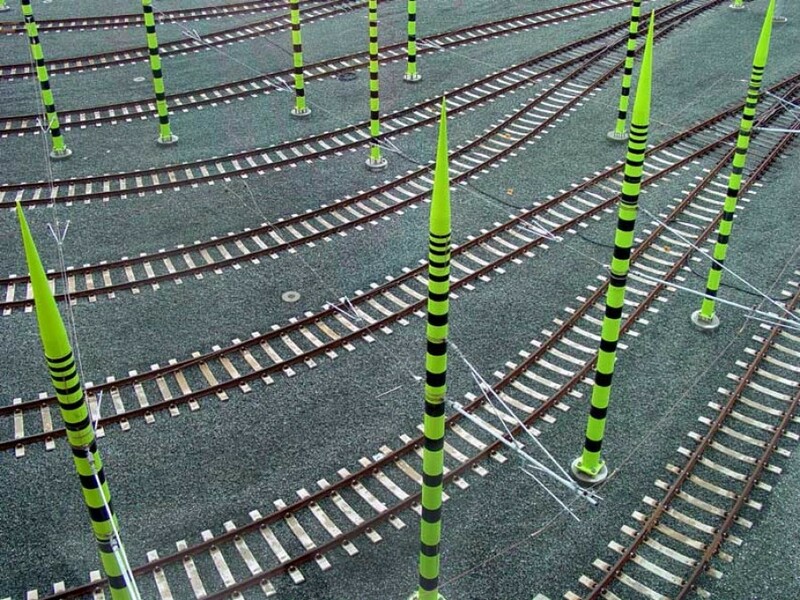 The top 6" of every stake is painted with florescent Orange "construction" paint, allowing the "skin of the field to be clearly discerned. 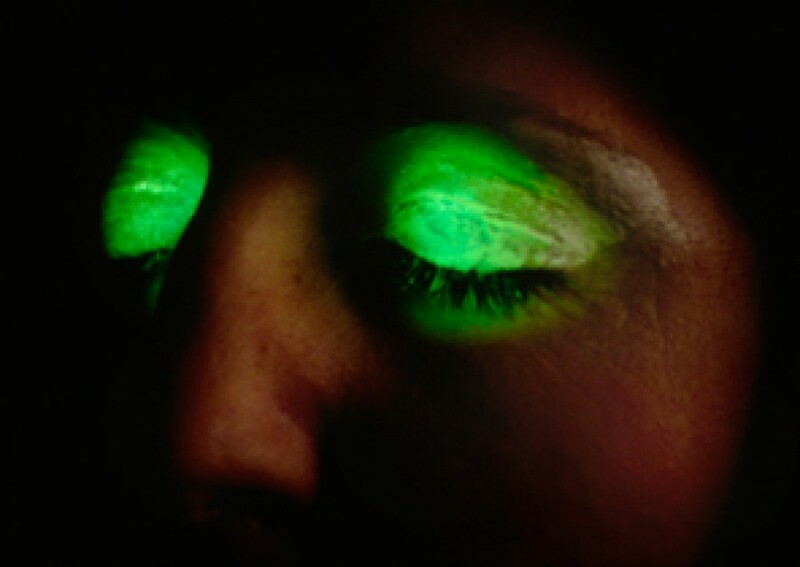 Invisible Ink, a show about the life and mystery of Mata Hari. 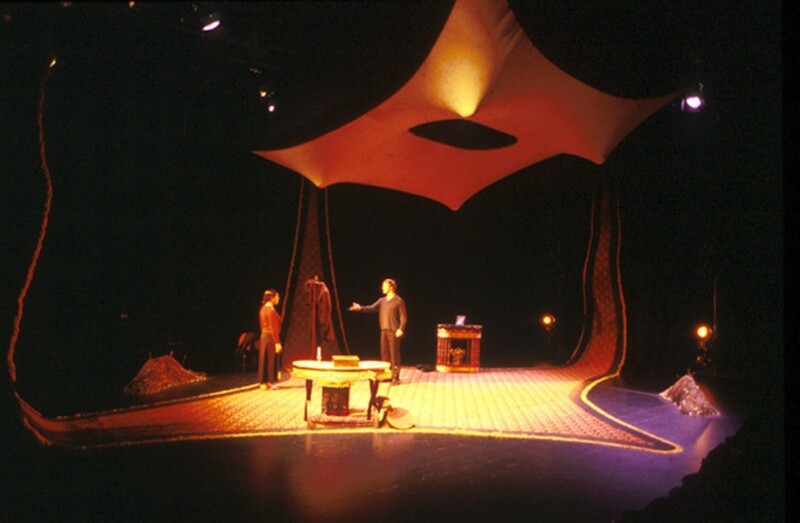 A touring set production created for the House of Dames Productions. 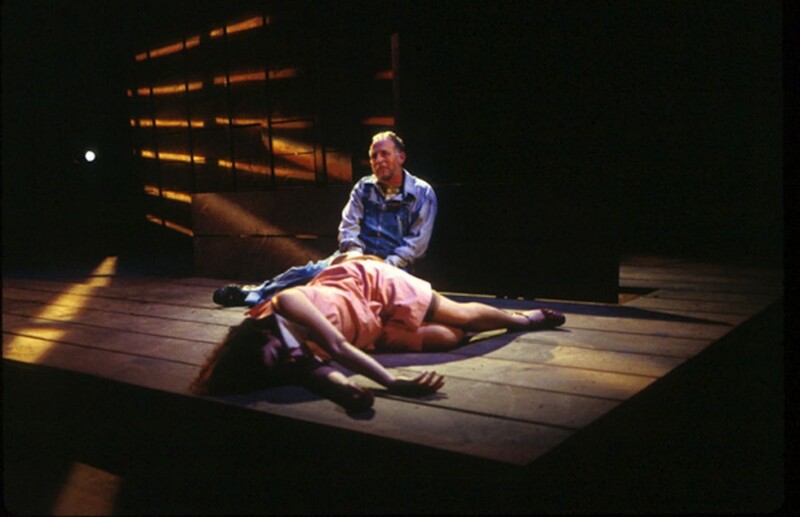 This production debuted at On the Boards, SeattleSet design. 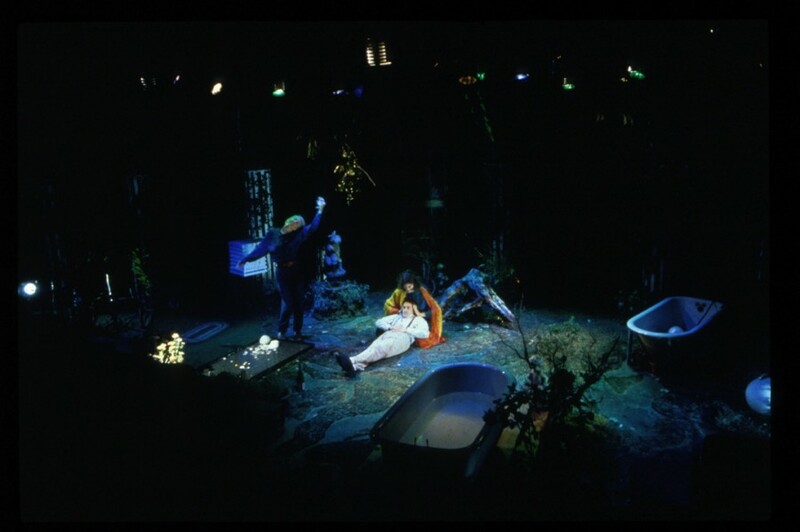 Djinn Scenography and design concepts created for House of Dames and Annex Theatre. 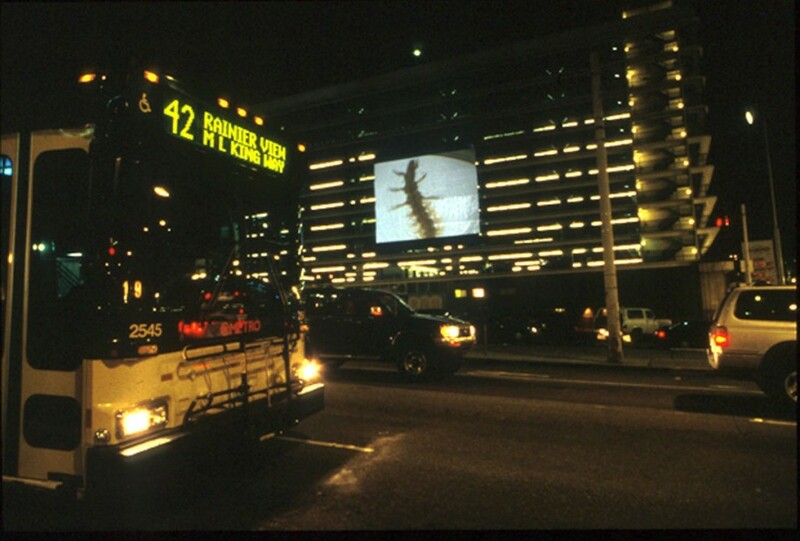 This project "kidnapped" the audience and drove them on a chartered bus with blacked out windows to an abandoned military base. 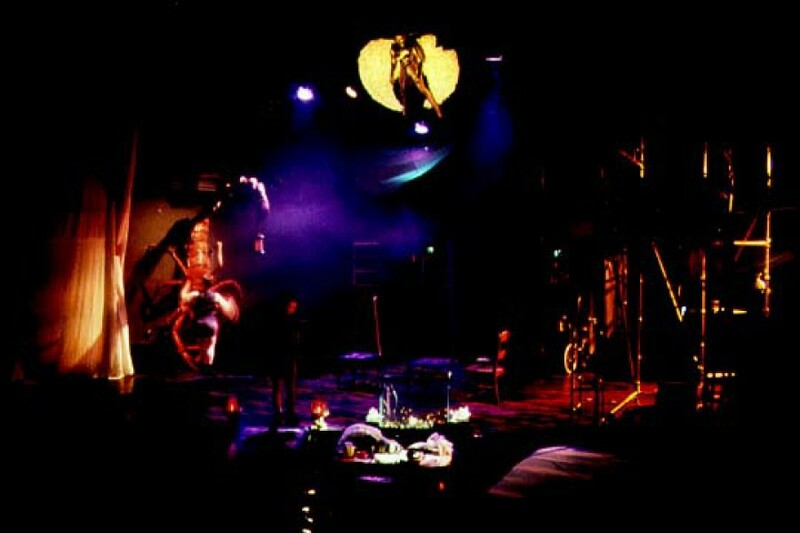 The audience was moved through a number of different spaces within the building and sometimes separated from each other. 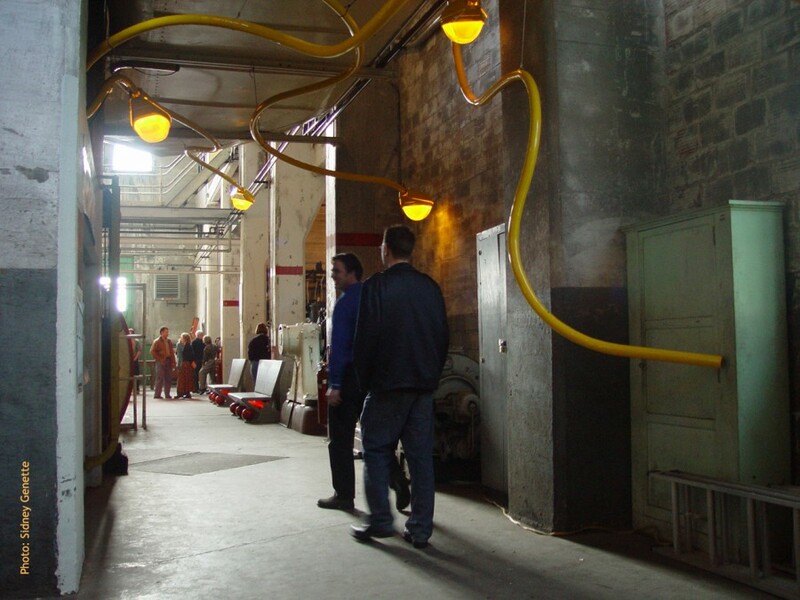 Selecting giant wherehouse spaces for the project, allowed for large moving set pieces and monumental scale juxtapositons. 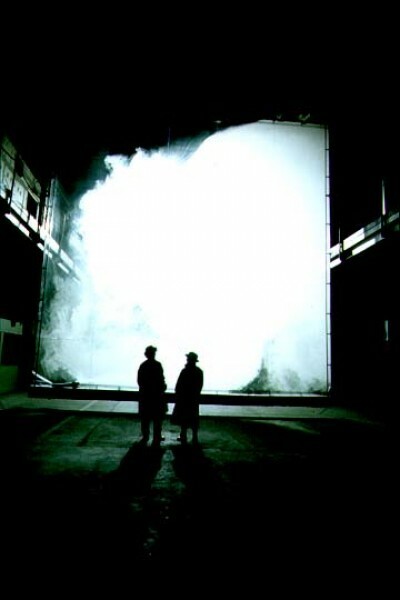 This image shows a giant 30' x30' smoke filled projection screen that moved 100' towards the audience via a giant overhead crane. 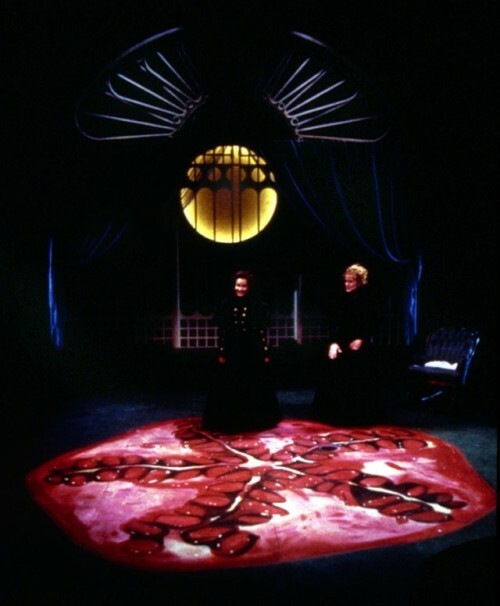 Sub Rosa Set and Lighting Designs created for Alice B Theatre & House of Dames Productions at the Pioneer Square Theatre. 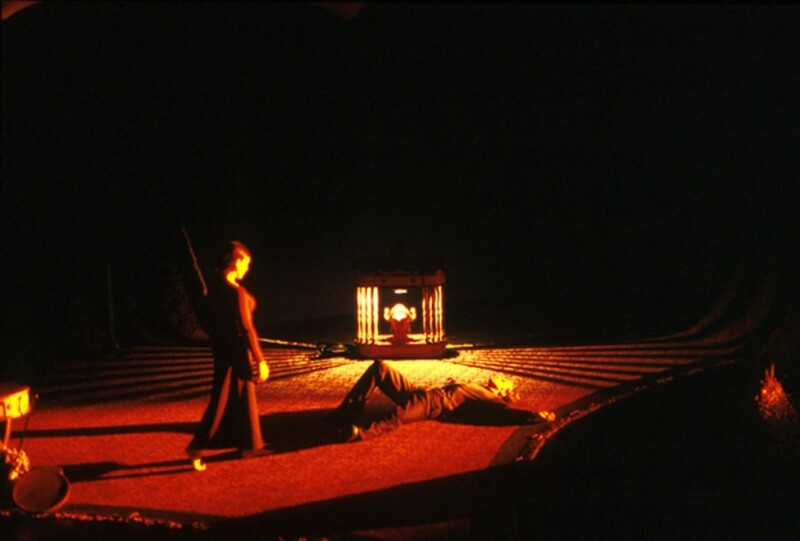 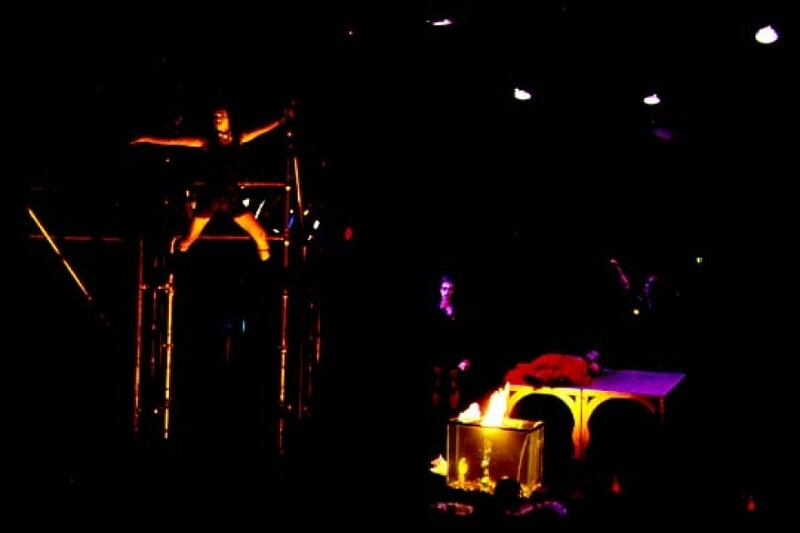 SubRosa- Scenography for this project created surreal performance environments and set up unusual audience-performance relationships throughout the piece. 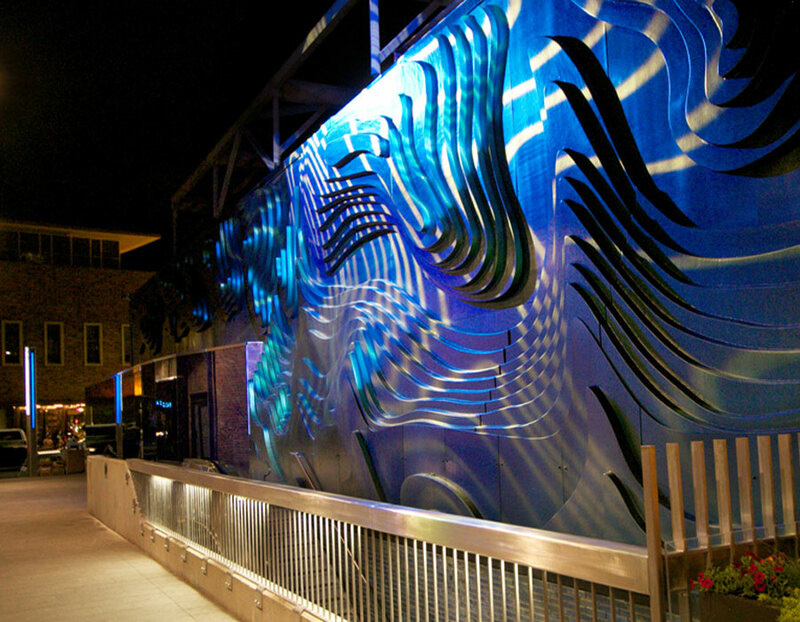 This project was for a production at ACT theater in Seattle. 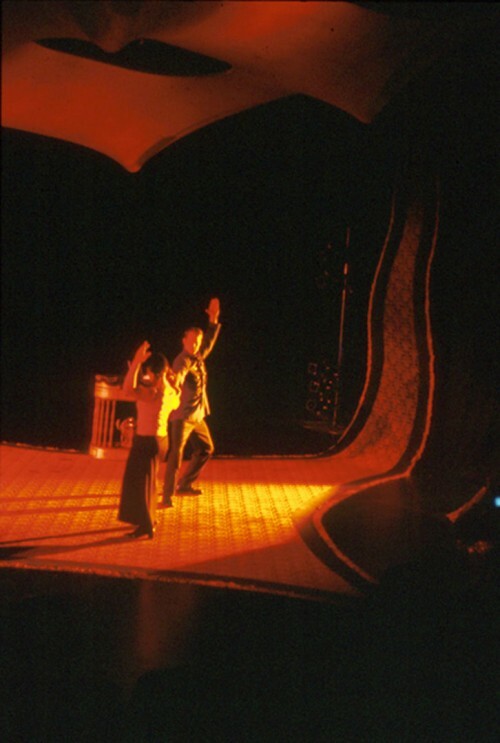 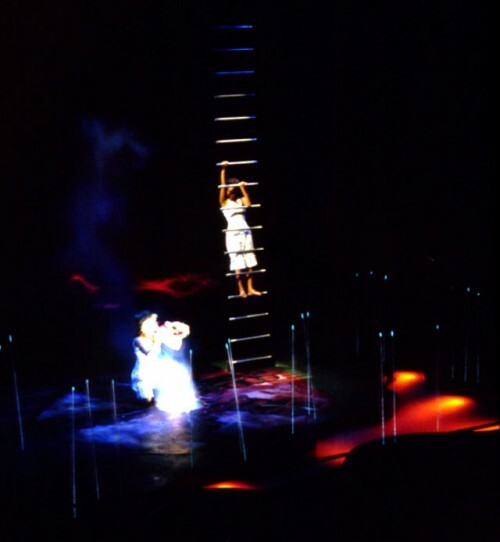 The set and lighting design was constantly shifting in fluid, dreamlike environments. 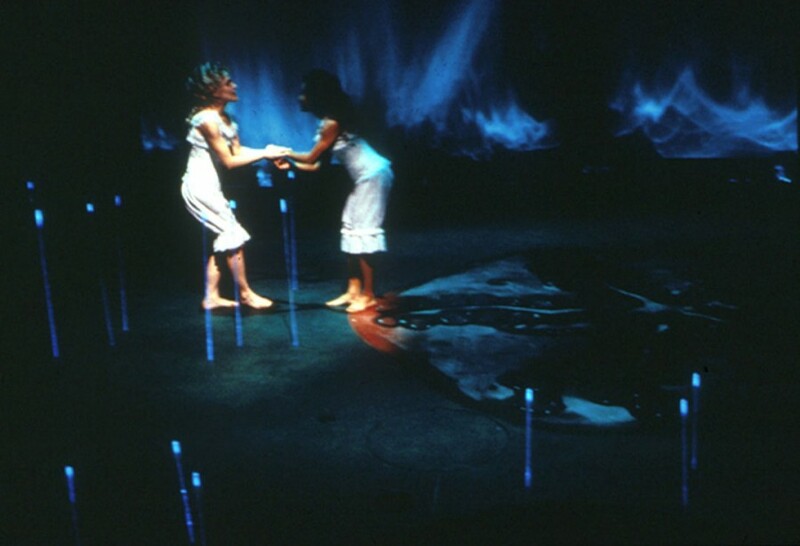 Here, glowing fiber optic reeds emerge from the floor of the stage set. 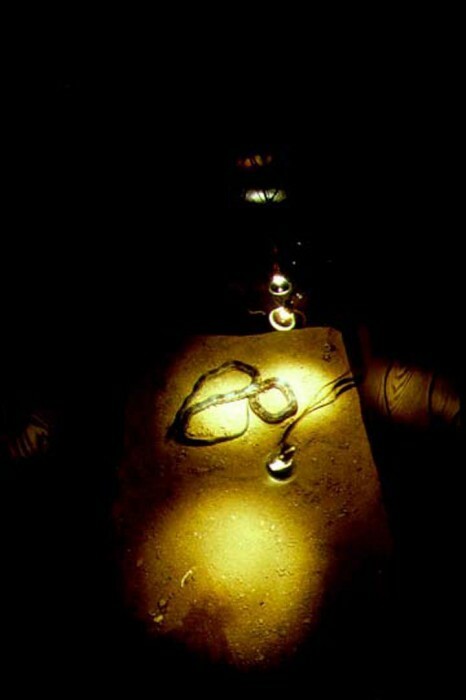 Interior of the live snake tabernacle. 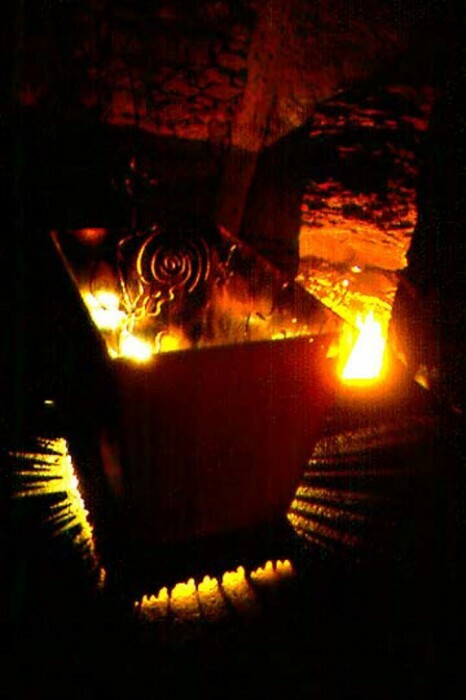 The interior of the box was carved, burnt and gold leafed with the fictitious mythological imagery. 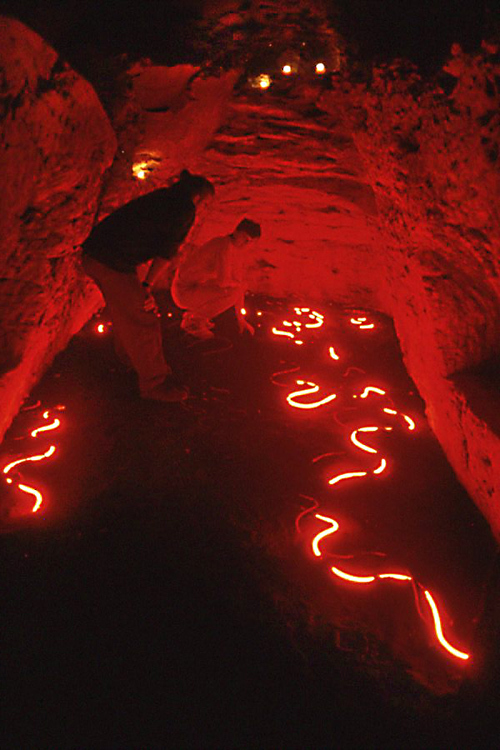 Part of the underground catacombs, the SNAKE CAVERN contains red neon snakes under a bed of black foundry sand. 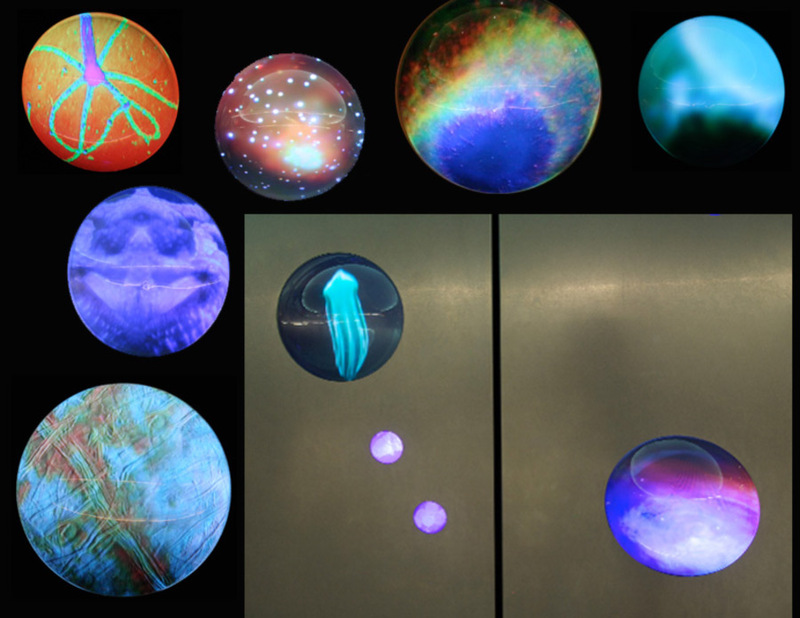 A series of 2' diameter water lenses filled with colored dyes. 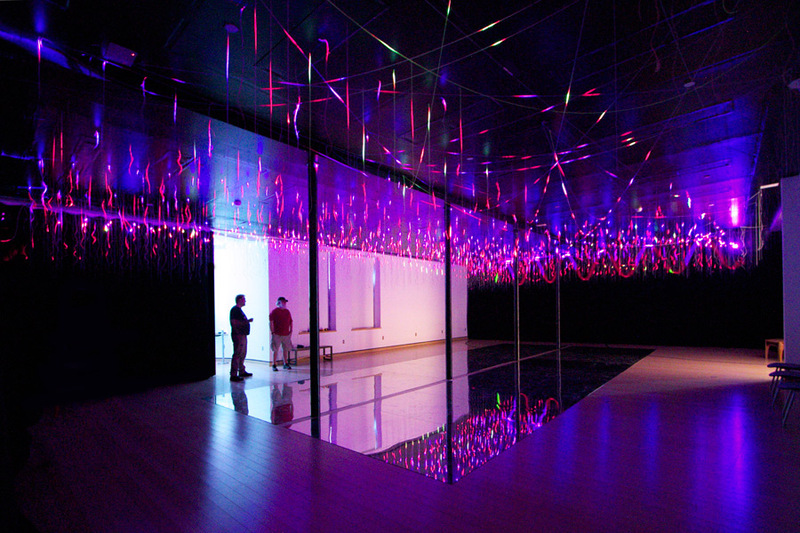 Some of the lenses utilized low voltage lights to project and focus lights onto the gallery walls. 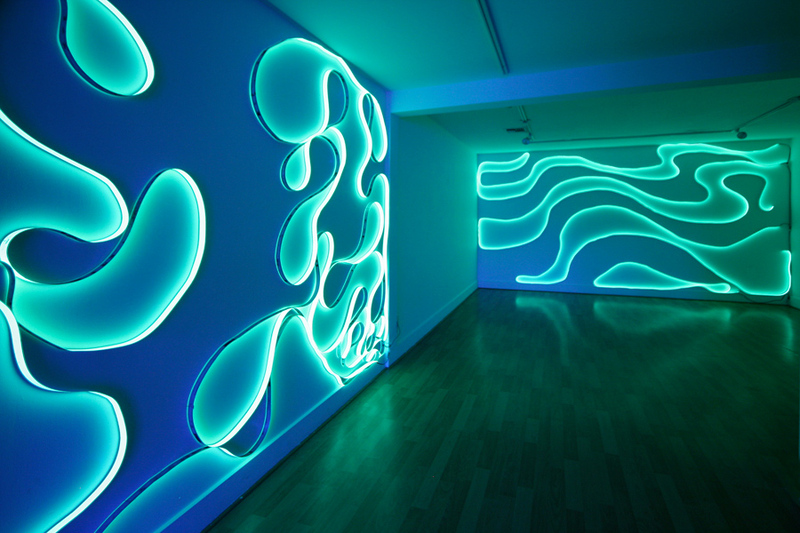 Other lenses (not shown) used artist-made oil lamps to project the moving patterns of fire-light onto the walls. 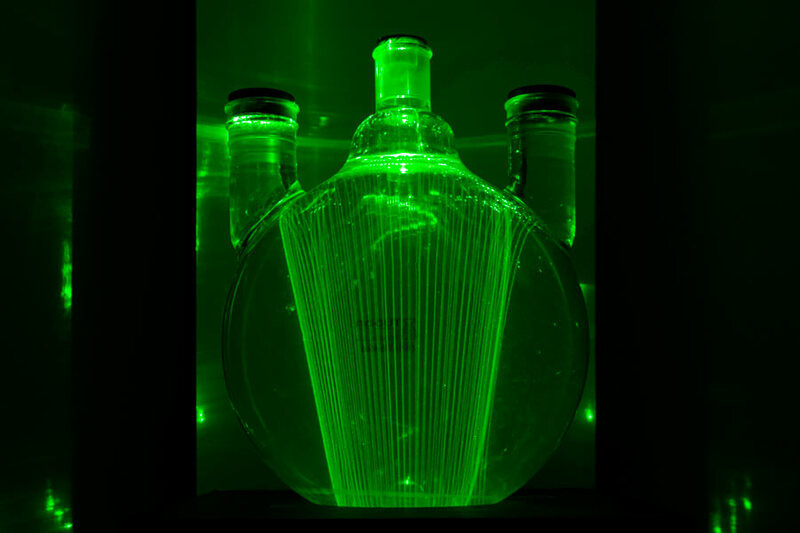 Referencing ancient lenses, lace-making magnifying glasses and limelight projectors, light and flame sources close to the glass magnify and direct the light to the wall. 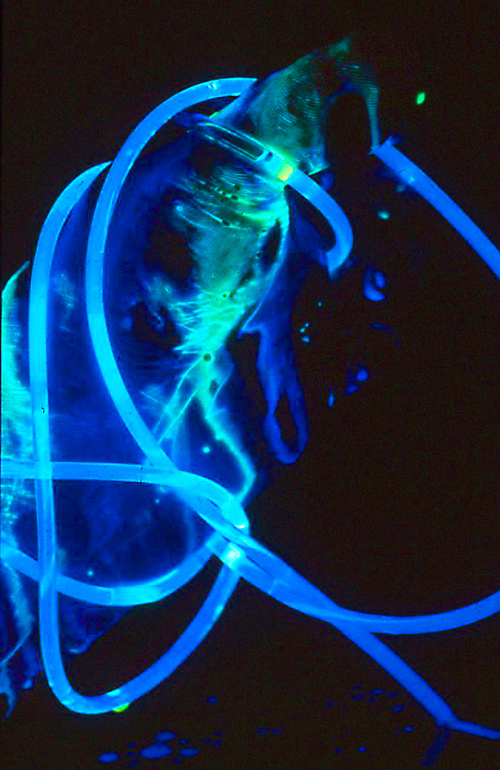 Victorian healing color and light theory matched specific colors to symptoms. 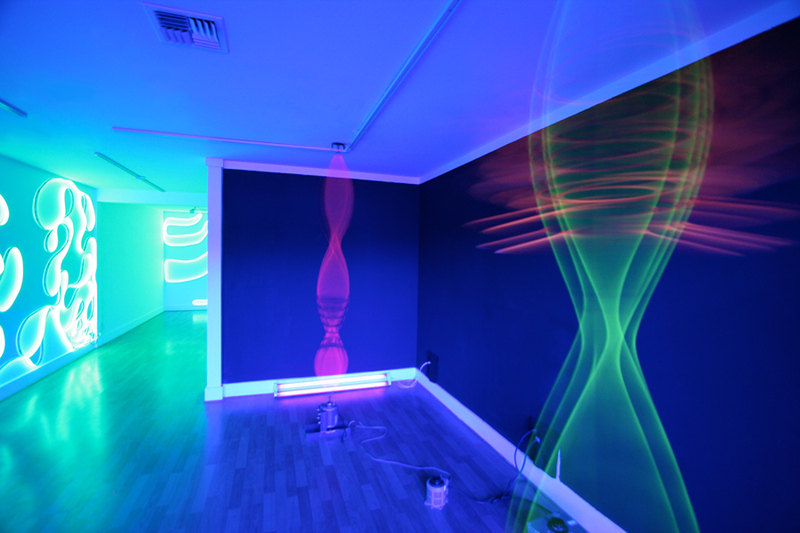 Standing in the colored light was said to heal you of your condition. 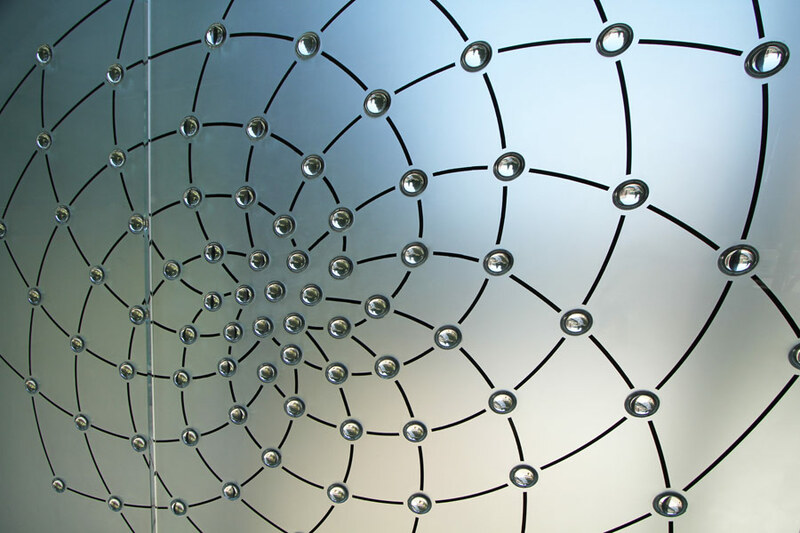 This practice led to the popularization of stain glass windows in residential homes in America and the UK. 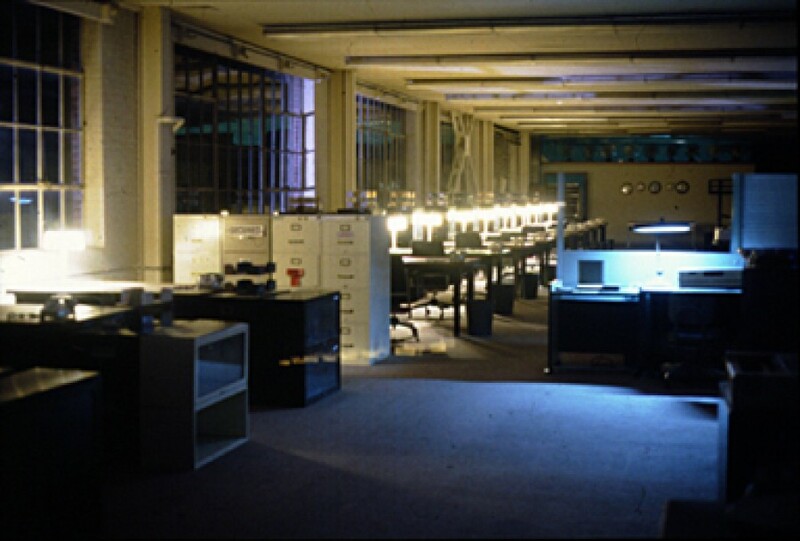 The final gallery exhibition was inspired by the imminent destruction of the Consolidated Works Gallery. 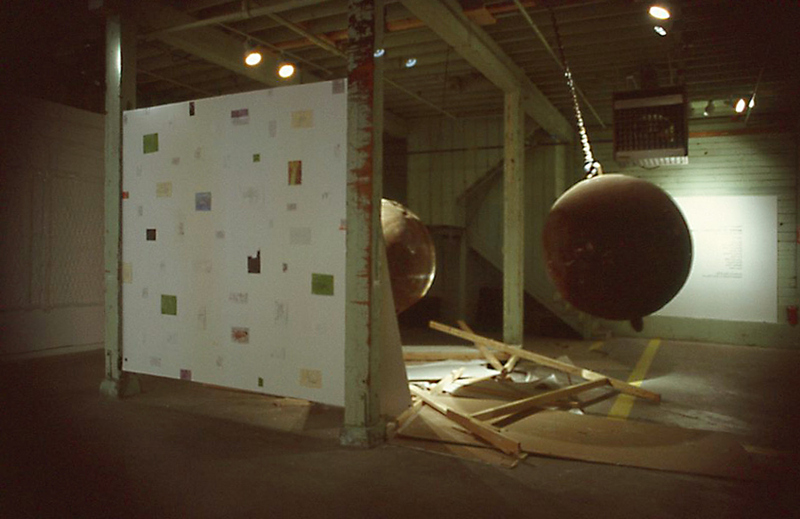 The 2- 5' diameter "wrecking balls" hang on giant chains on either side of an exhibition wall. 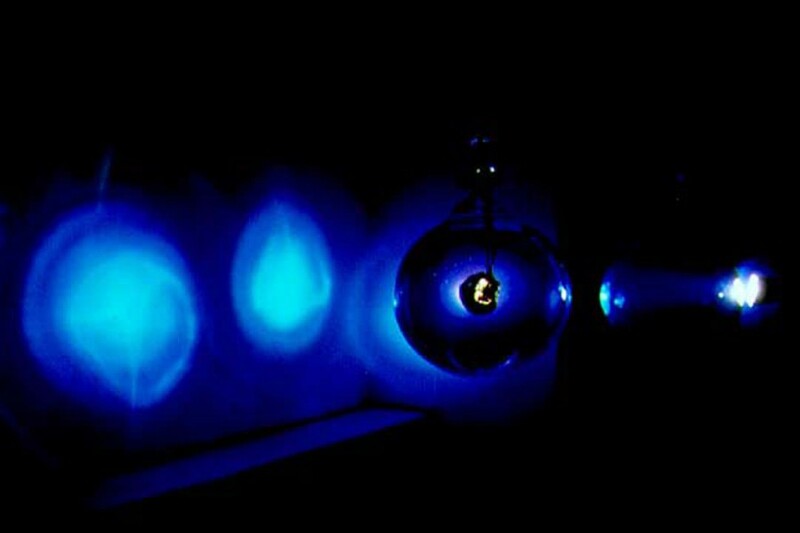 The wall and balls have microphones in them so as the audience smashes the balls through the wall (destroying the wall) the tone of the balls striking the walls or each other are then modified and deepened through amplified subwoofers and re--verb that echoes the resonant "smash" throughout the building. 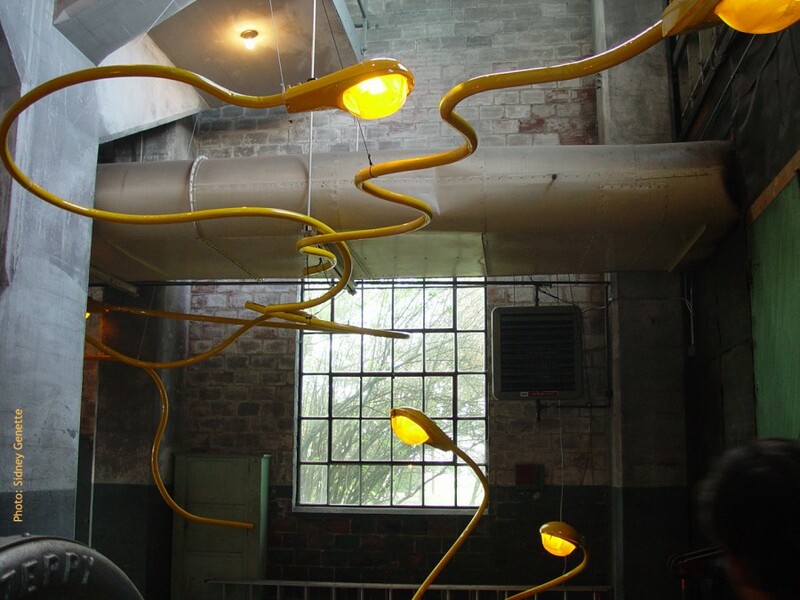 Many contorted “street light sperm” danced through the “generation facility” of the Georgetown Steam Power plant. 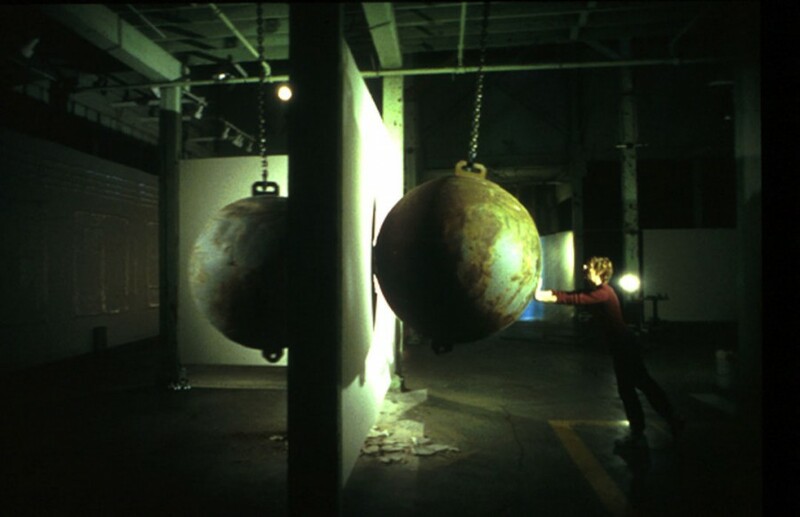 A giant “cleaving egg” projection recounted the turning wheel of the steam plant’s engines as well as a egg dividing.Views of the complex overlapping patterns can be seen from the upper floor. 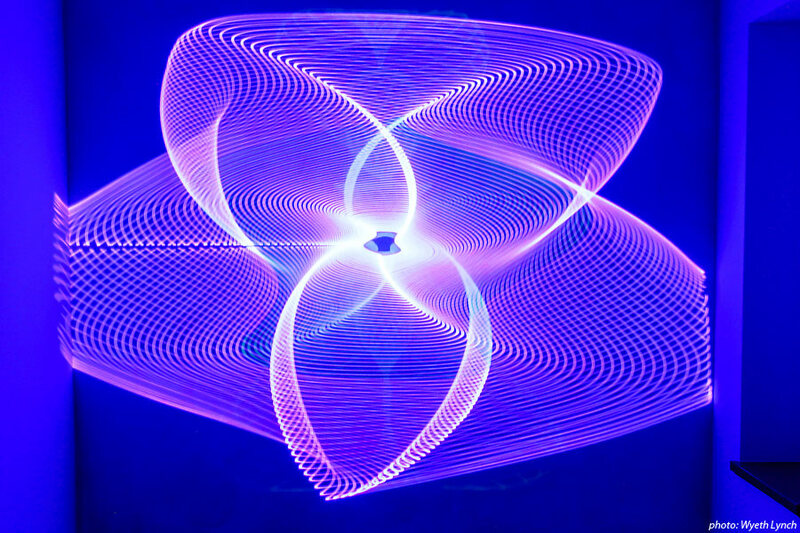 The circle of light had rotating bisecting lines, mimicing a cleaving egg as well as referencing the giant flywheels in the other room. 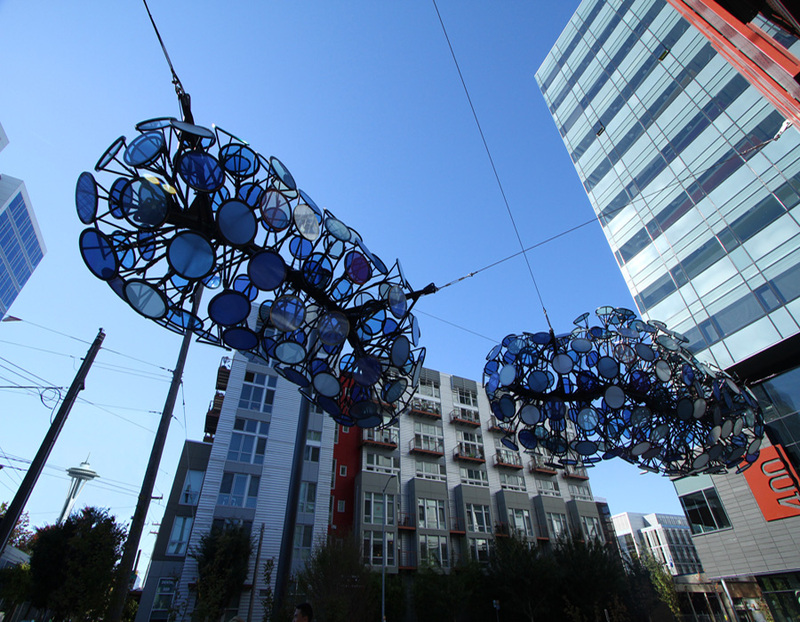 Special Thanks to: Jeremy Edwards, Lynne Moore and the SCL Steel Crew,Dura Coatings Inc, Kevin Spitzer, Omar, Jeramy Brennan McGuigan, Allen Diego, Laurie Geissinger,Seattle City Light and the Office of Arts and Cultural Affairs. 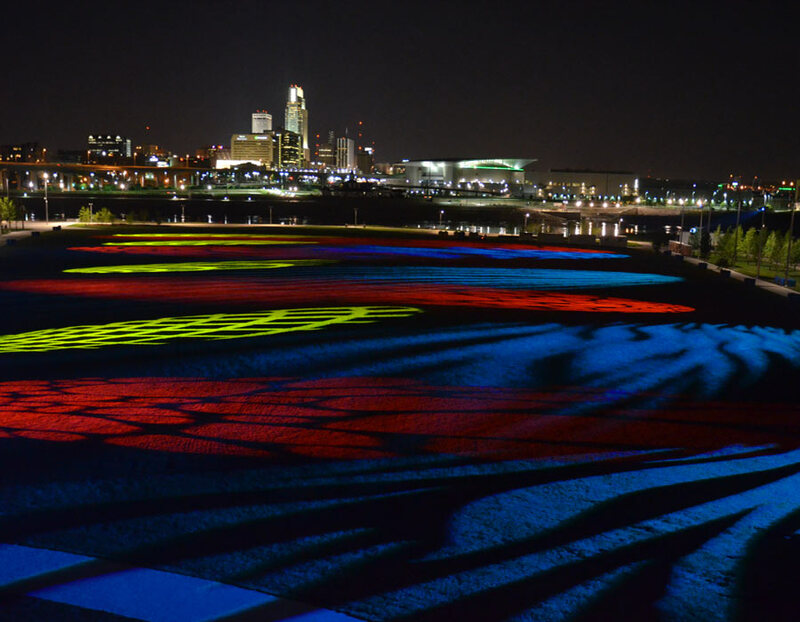 Photo Credit: Sidney Genette. 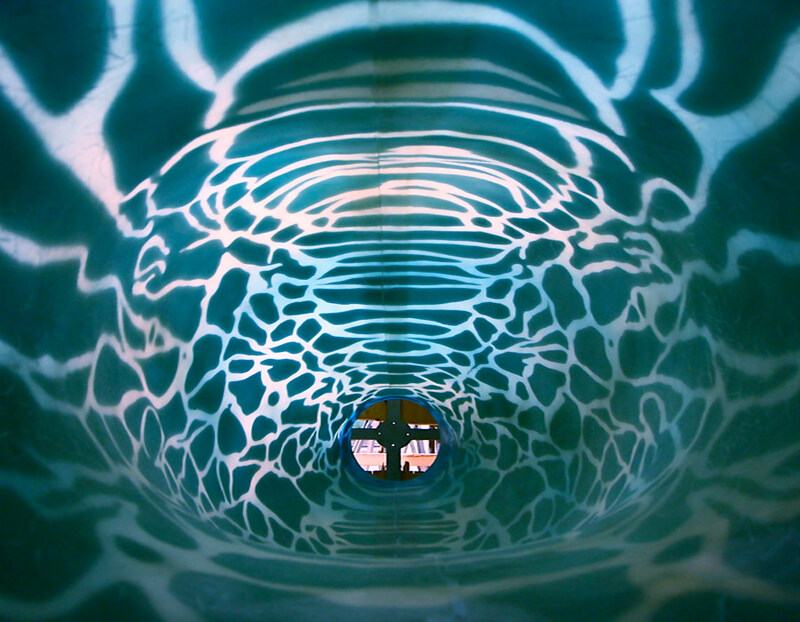 The word grotesque comes from the word grotto, the distortion or warping of an image that is reflected in the water of a cave. 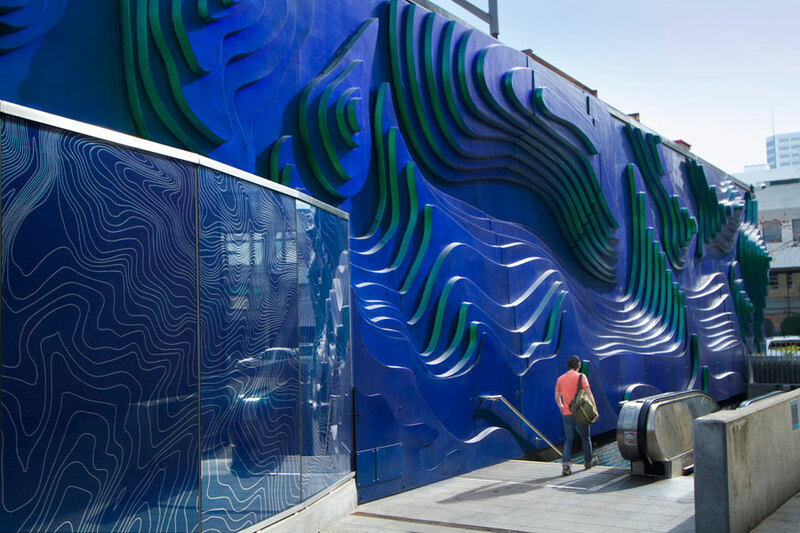 The title is further defined with the addition of Arabesque: an elaborative application of repeating geometric forms that often echo the forms of nature. 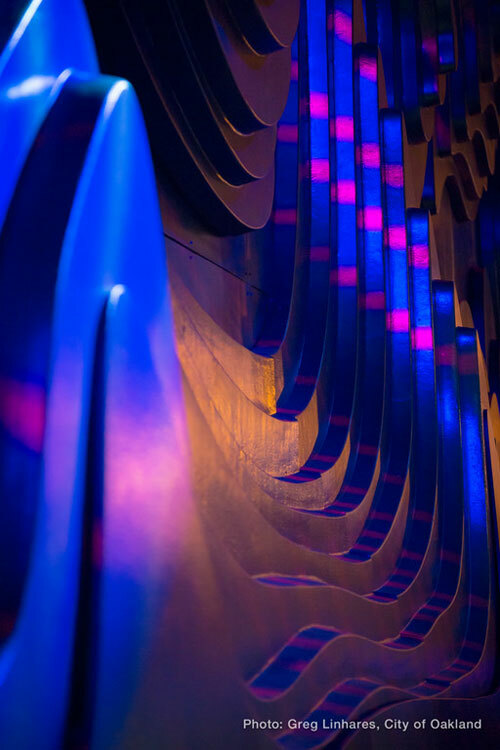 Here the arabesque framework articulates a repeating pattern of contour lines that define the interior of the cave, complete with stalactites. 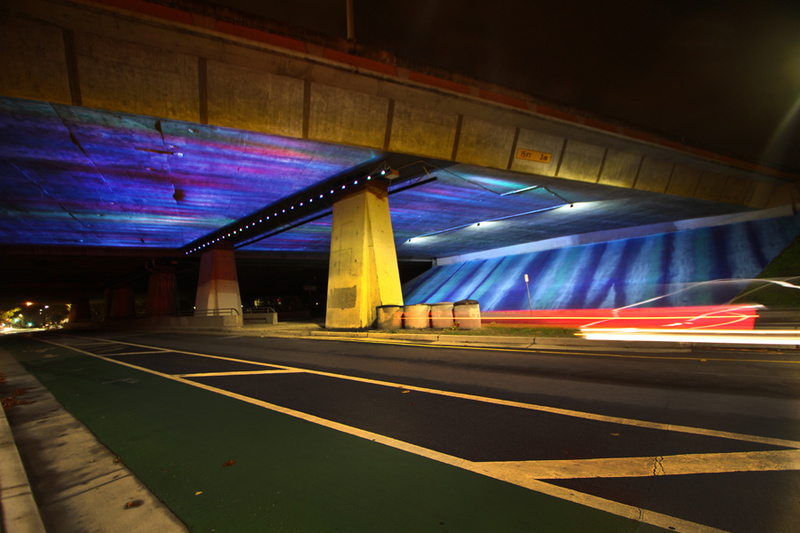 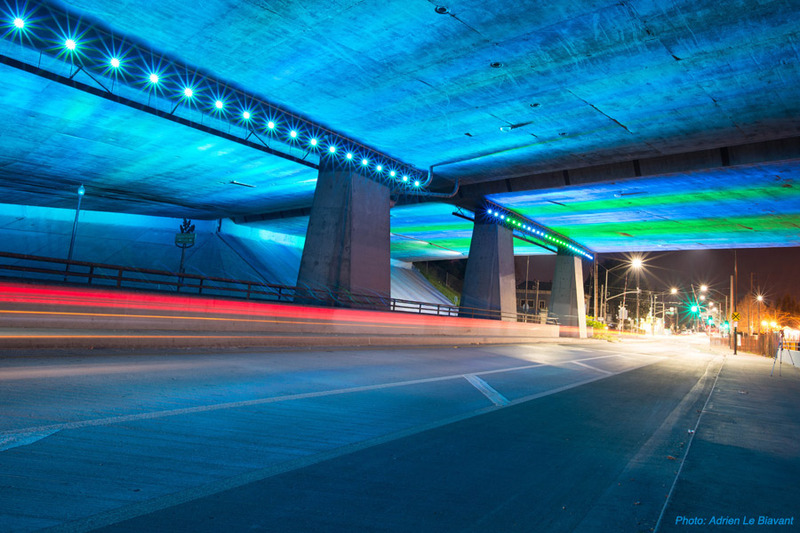 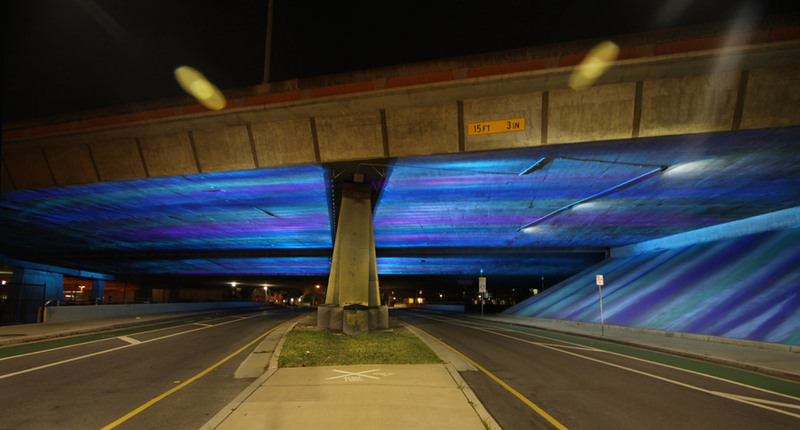 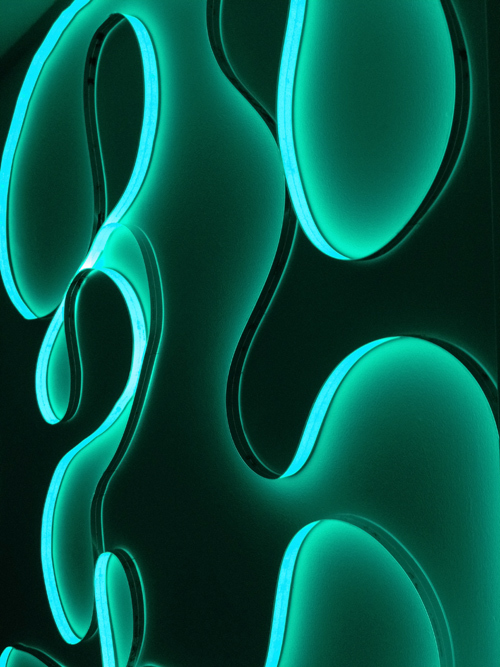 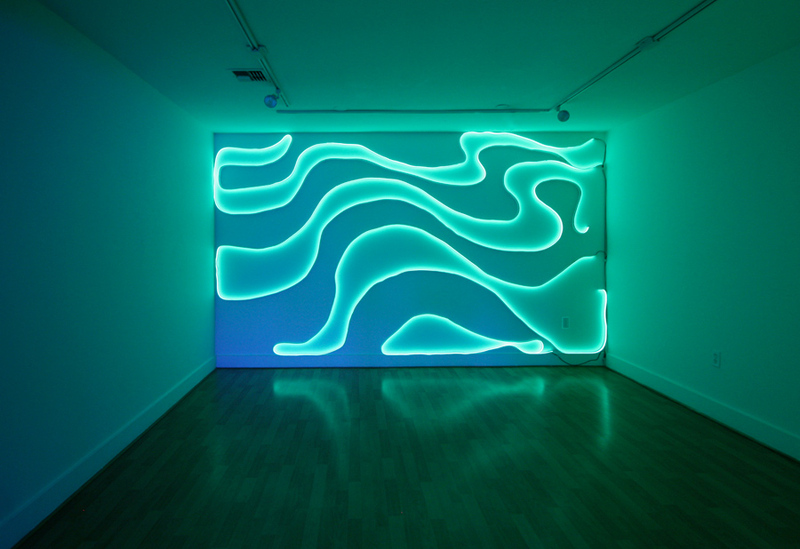 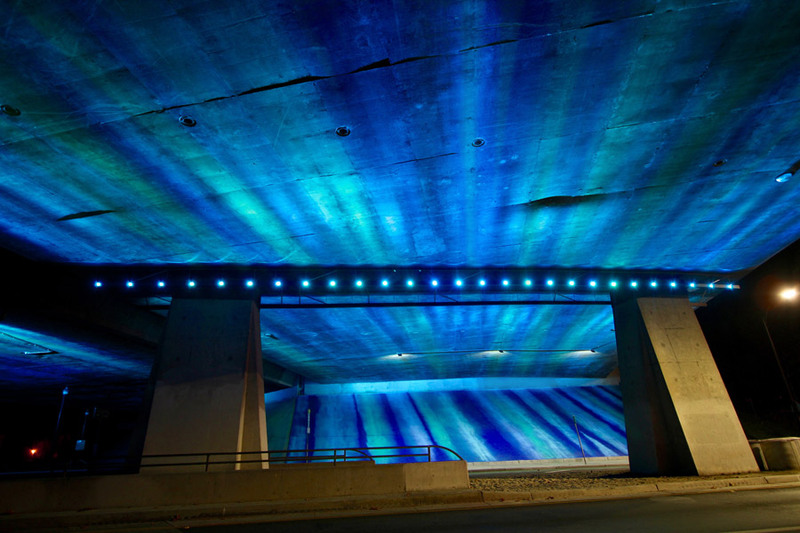 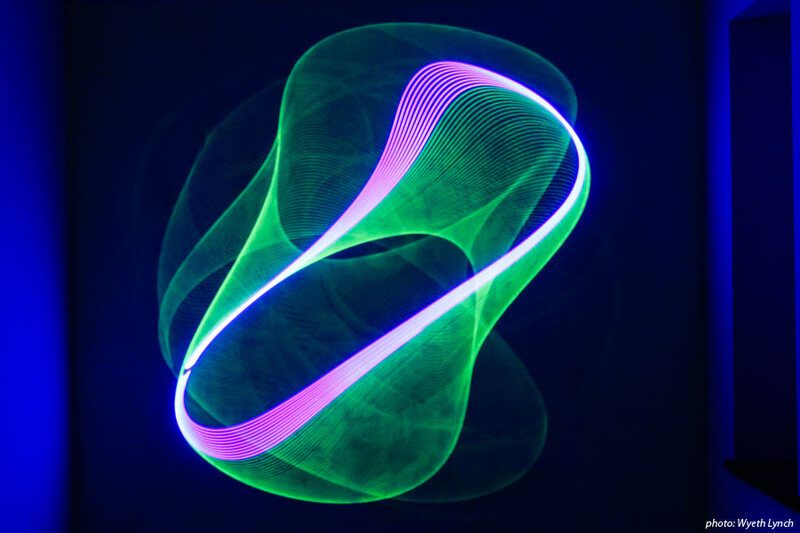 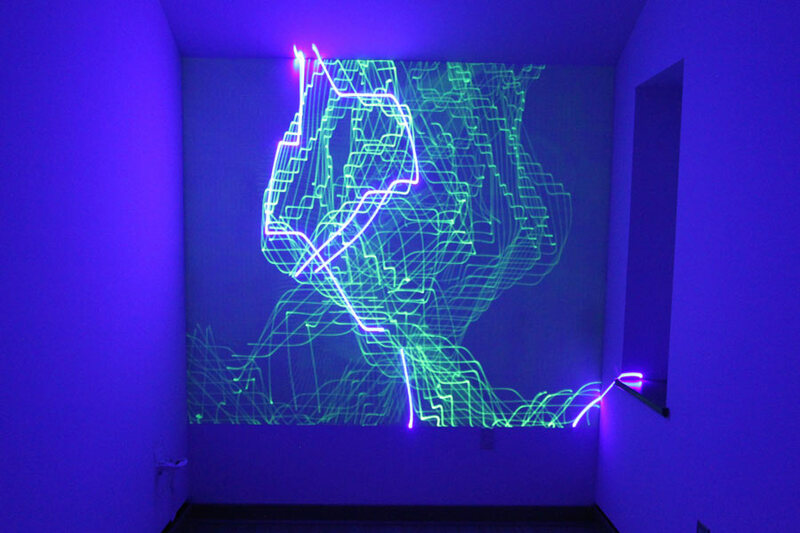 The contour lines glow with electroluminescent ribbons of aqua colored lighting mined from rare-earth phosphors. 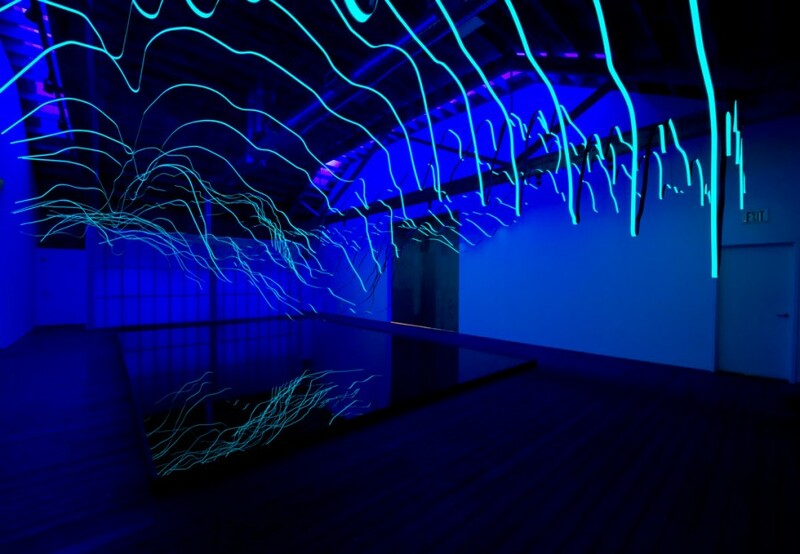 Dripping water distorts the architectural arabesque into a grotesque dance of light and dark. 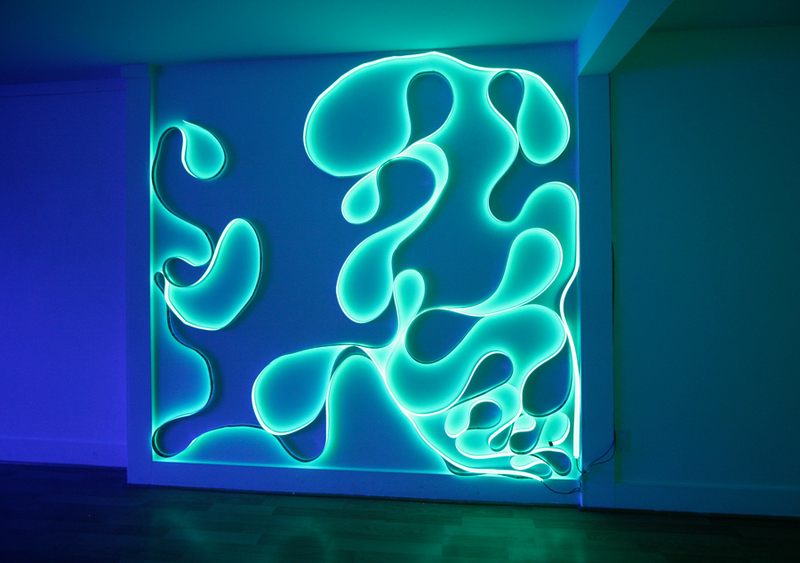 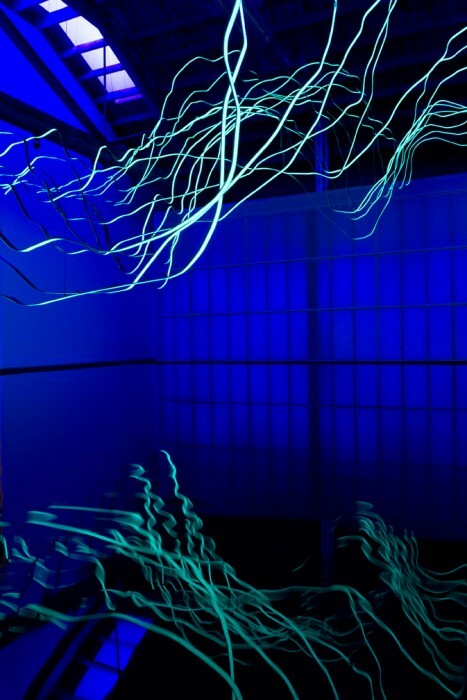 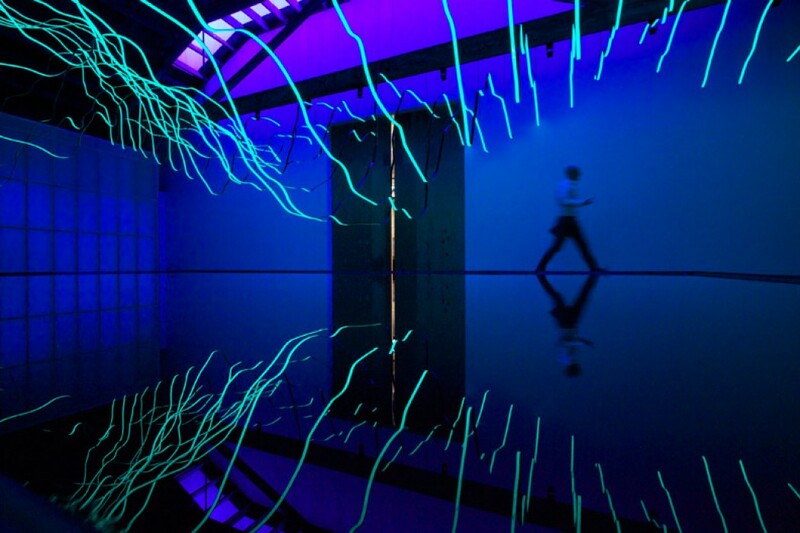 GROTESQUE ARABESQUE is an immersive art environment transforming Suyama Space into an otherworldly, light-filled cave created by turquoise-colored electroluminescent tape on meticulously bent, contour-drawn flat bar steel. 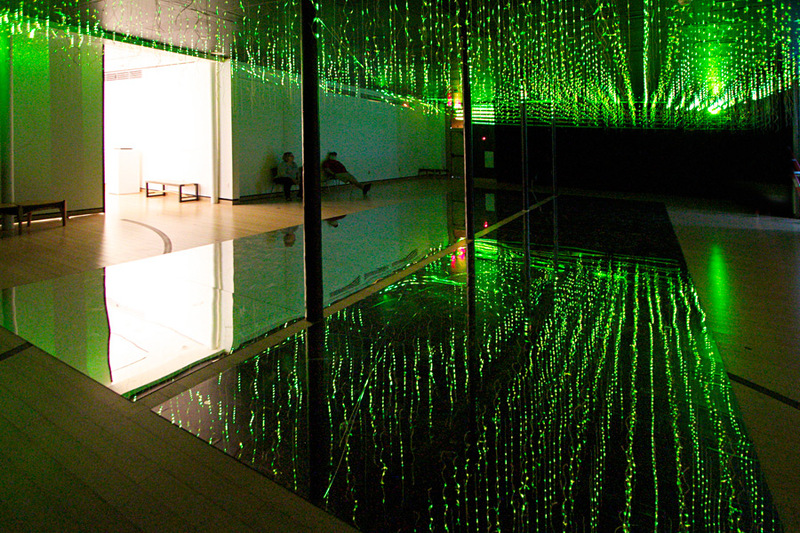 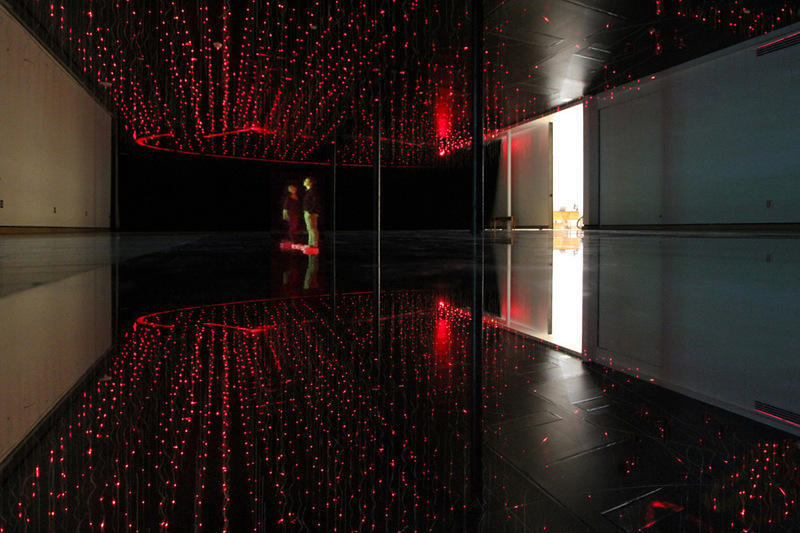 The glowing cave ceiling is amplified by and reflected in a large reflecting pond below. 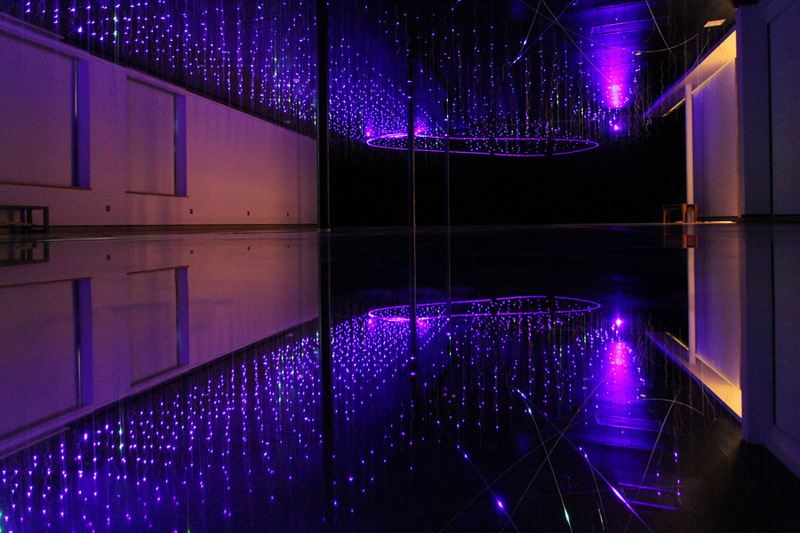 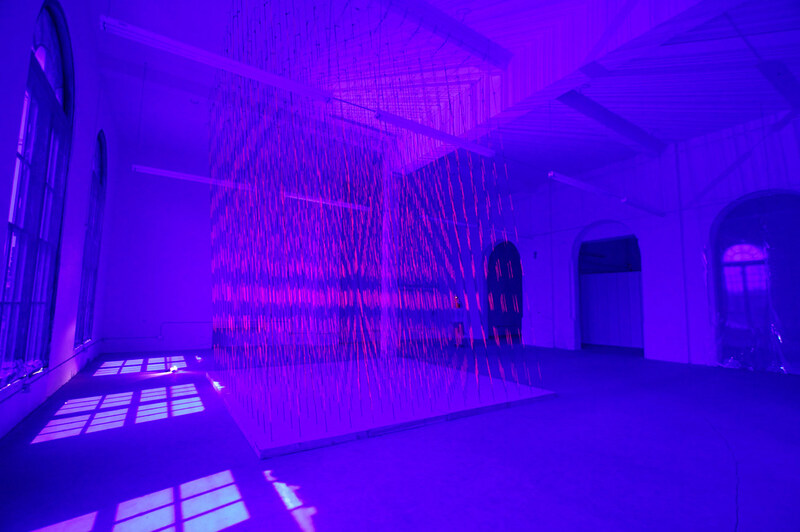 A saturated indigo illuminates the space through dark blue filters covering the gallery skylights, while a 25 foot wide mirror multiples and further distorts the experience. 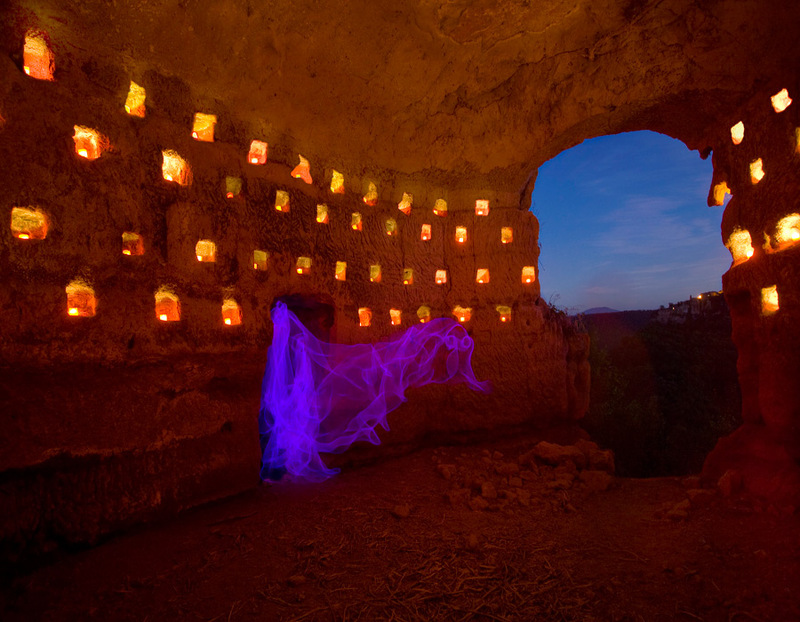 Grotesque Arabesque was inspired by Corson’s visits to a series of caves in the Yucatan as well as Etruscan grottos, catacombs, and cisterns he explored during a residency in Civita di Bagnoregio, Italy in 2008. 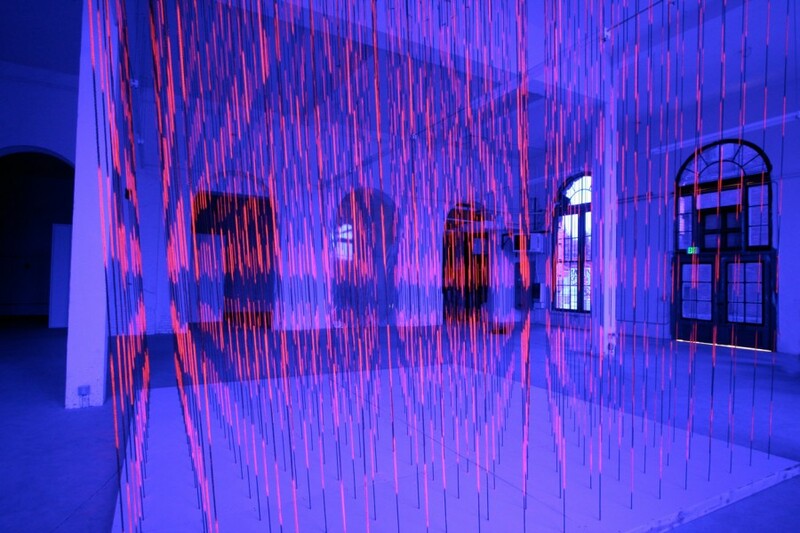 Caves hold an extreme fascination for the artist, primarily because they represent for him a threshold into another world, connecting us to the unconscious and to the dark mystery of Nature. 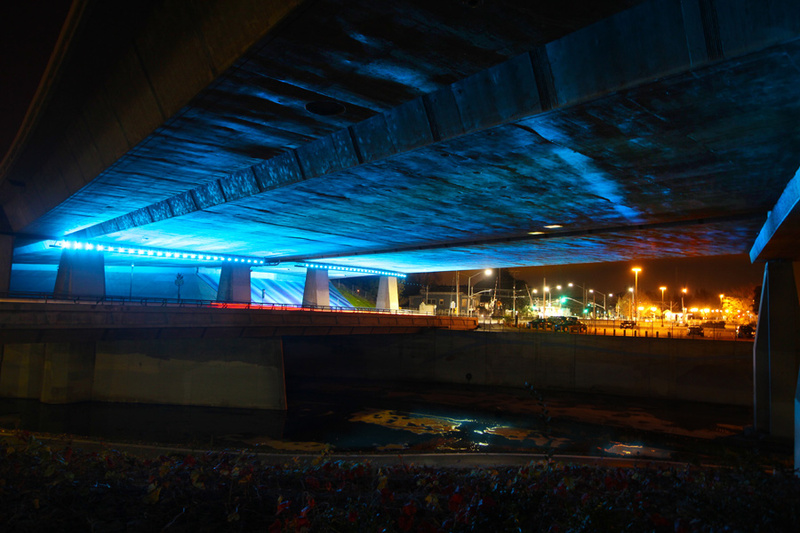 I want to extend my deep thanks and appreciation for the following people who without their help and support this project would not have happened. 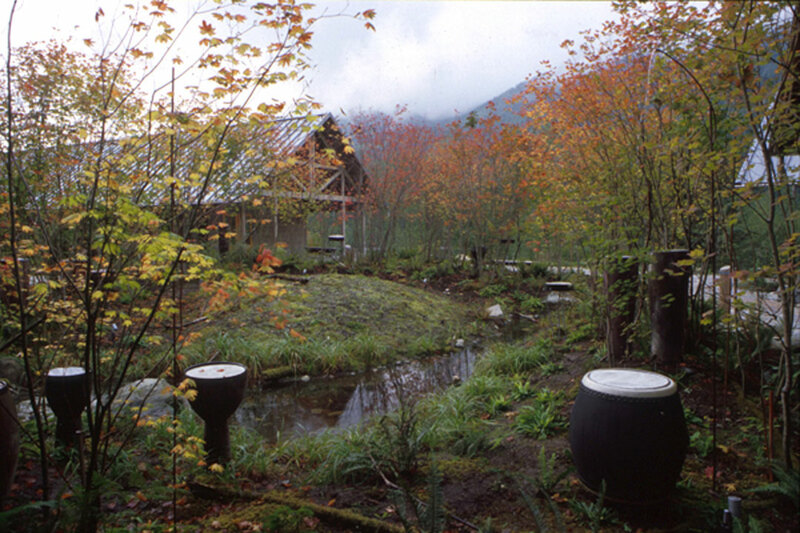 Beth Sellars, George Suyama, Jym Snedeker, David Verkade, Paul Strong, Matt Sellars, Ron Fujimoto of Fujimoto Landscaping, Jason Thompson, Thomas Carrol, Jordan Howland, Gabe Stern, Michele Lynn, Jerry Raitzer, Miriam Larson, Sven Larson, Todd Metten, Dave Meisner, Berndt Stugger, Tom Harman, Tom Mattausch, Jay Deguchi, Ric Peterson, 4culture, Barbara Goldstein, and all those at Suyama Peterson Deguchi who kindly endured the long build and installation. 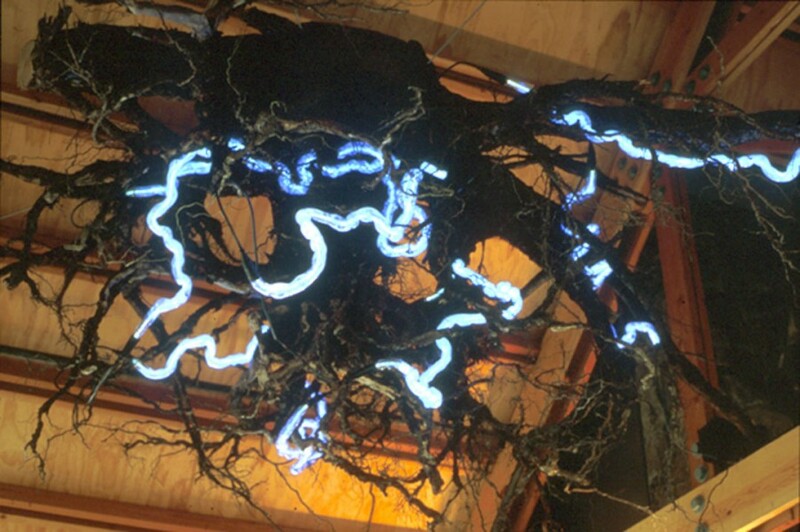 A Large complete root system with attached illuminated argon and krypton gas filled root-forms are suspended from the beams and ceiling of the Lobby area. 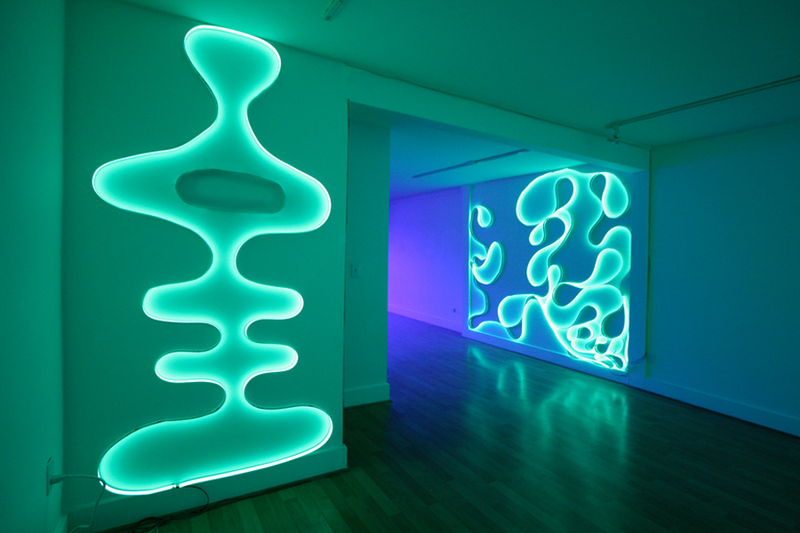 The "neon" tubes are large (25 mm) and provide soft, suspended volumes of light to flow through twisting and contorted tubing. 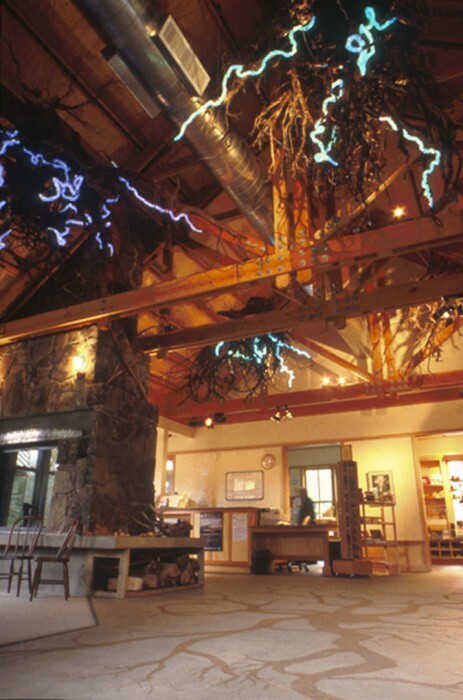 The suspended root masses also act as a link to the visitor center's sod roofs, and reference the history of the underground living spaces of some native tribes of the area.The network of gaseous argon speaks to the flowing of water and the technology necessary to keep the watershed operational and the generation of electricity. 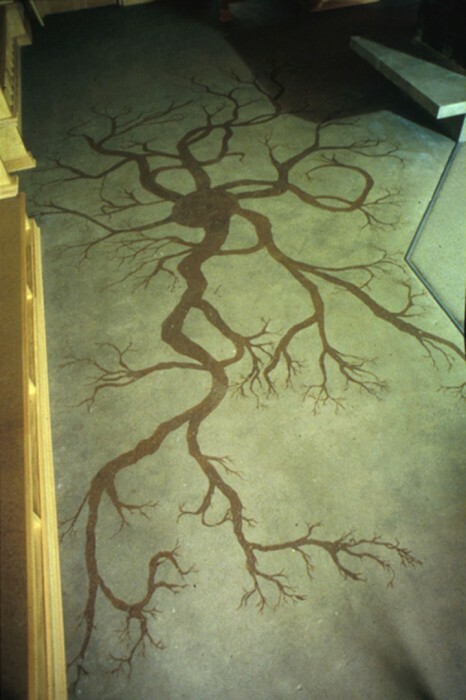 THE DENDRITIC ROOT FLOOR is a sandblasted and stained concrete floor. 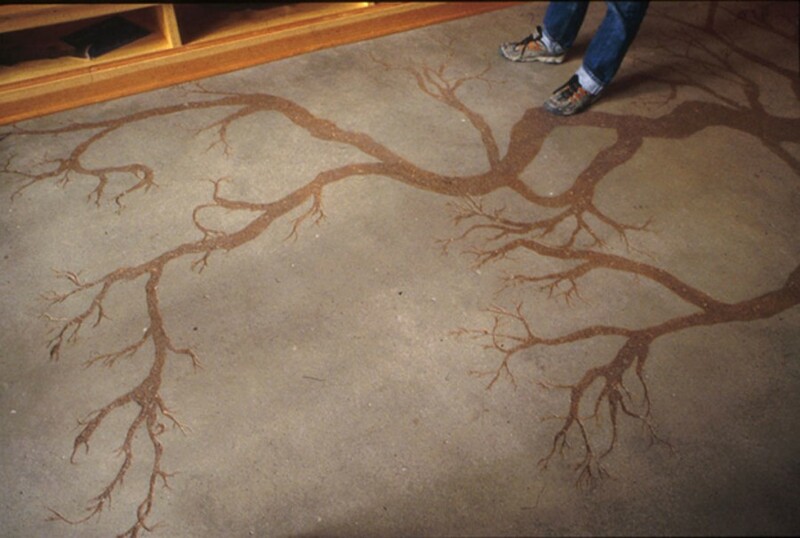 The pattern is of a stylized image of a cross section of a vine maple root system rendered in dark organic colors. 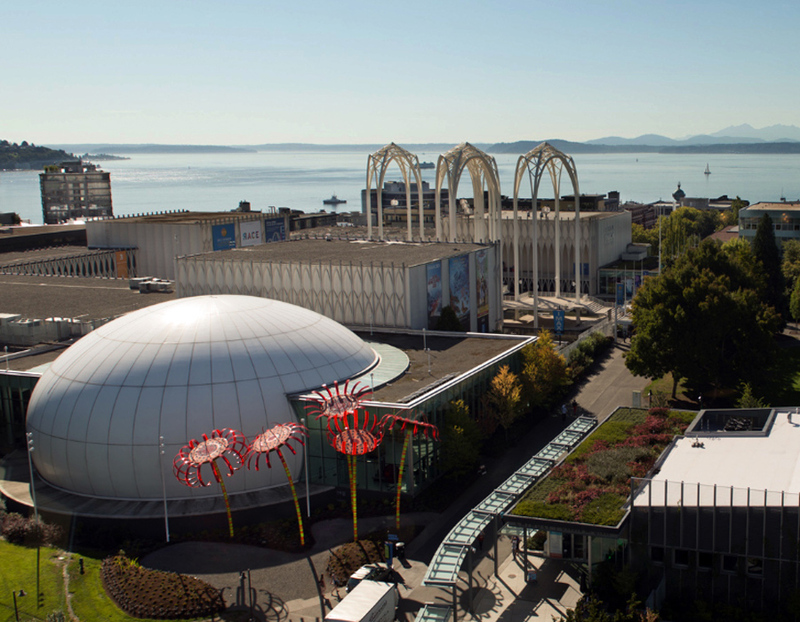 Funding: SPU % for Arts Program, Administrated by the Seattle Arts Commission. 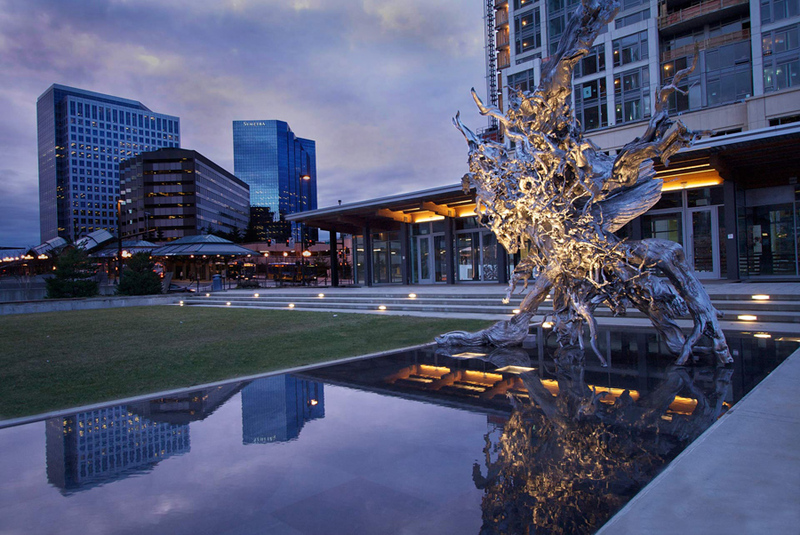 Architects and Landscape Architects: Jones and Jones Architects, Lori Nelson project architect, Nancy Roddle, project landscape architect. 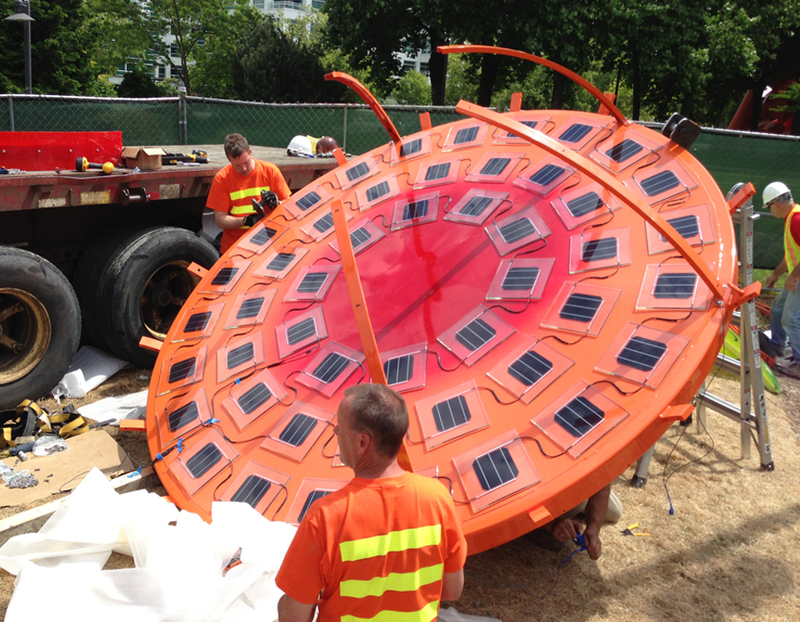 SKAGIT STREAMING is a complex multi-site project providing a window into the Skagit River system (Seattle’s hydroelectric facility) via fiber optic cable- from 150 miles away. 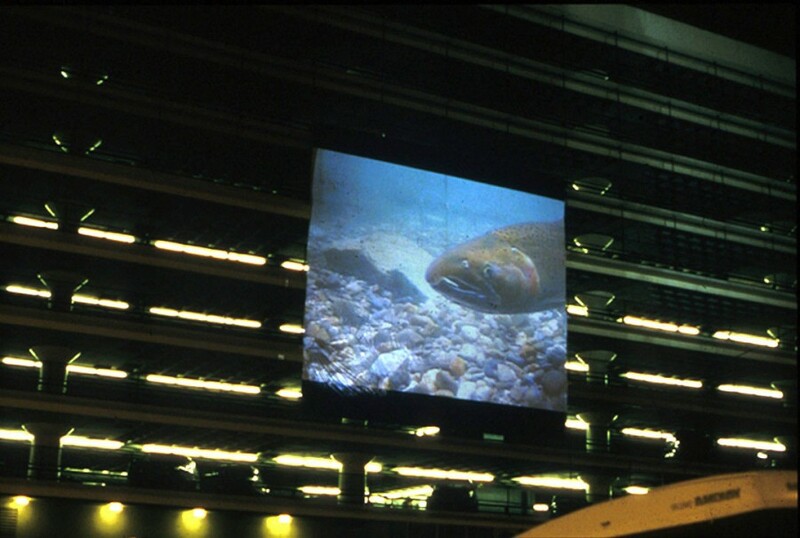 “Live” Streamed video images (from 3 cameras): Riverside views, underwater footage and microscopic images are then sent into various city buildings, the WWW and projected nightly 40' across on the side of a large parking garage. 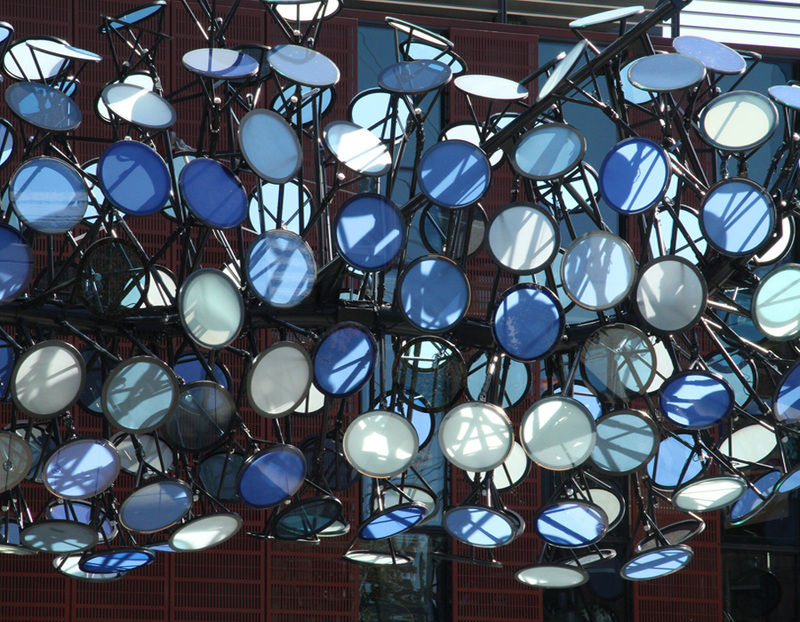 The www aspect of the project provides streaming video, feedback and educational information. 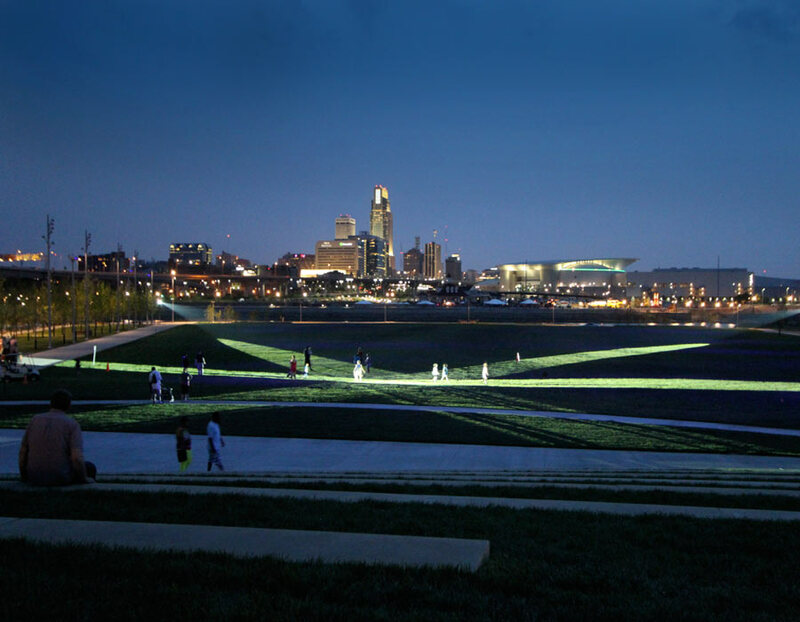 This project aspires to connect the downtown urban core with the source of its electricity and quiet cycles of nature. 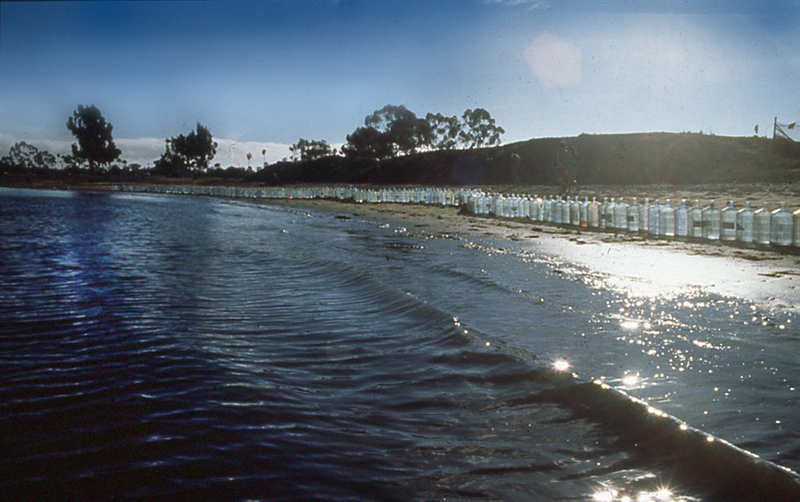 At the same time, it acts as a sort of "canary in a coal mine" by monitoring strategic fish populations for the public. 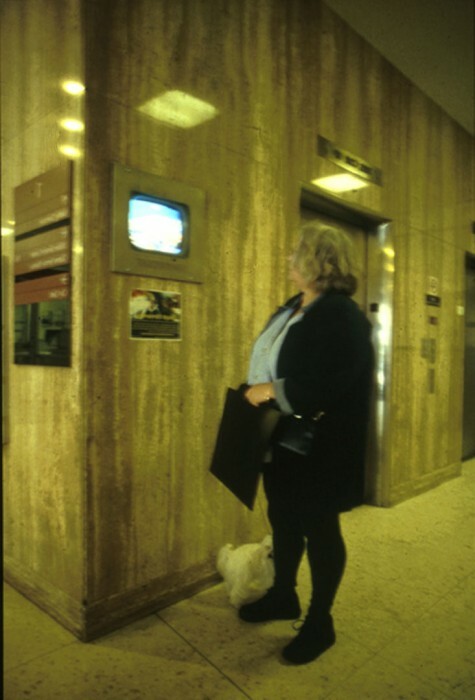 In the Municipal Building where the Mayor and City Council has their offices, the video was shown next to the elevator to help remind our elected officials about our critical relationship to the source of our electricity and water. 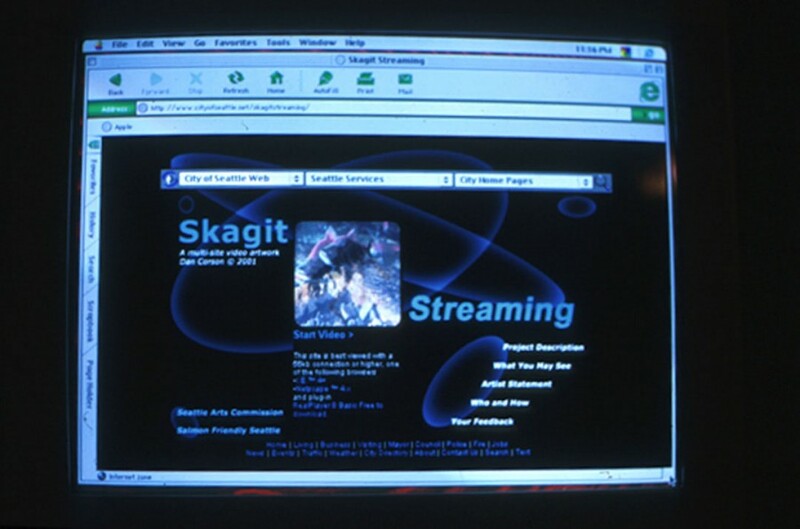 the www.skagitstreaming.net web site included grass roots salmon education links, education site and project information. 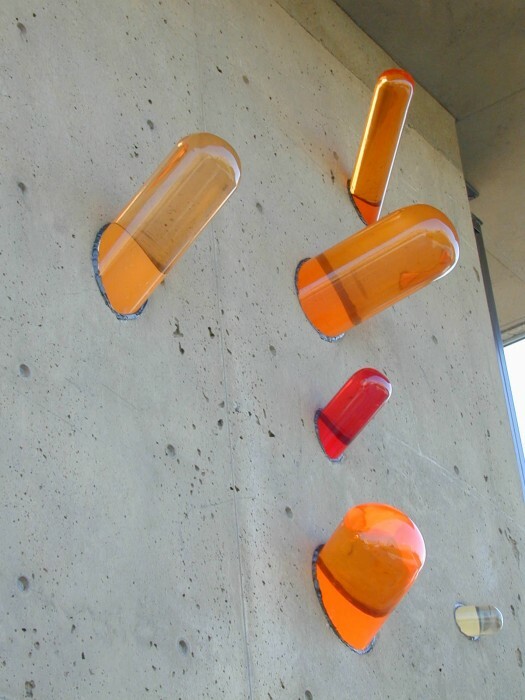 RESIN RODS- are embeded through the cement walls acting as dimenstional "skylights" . 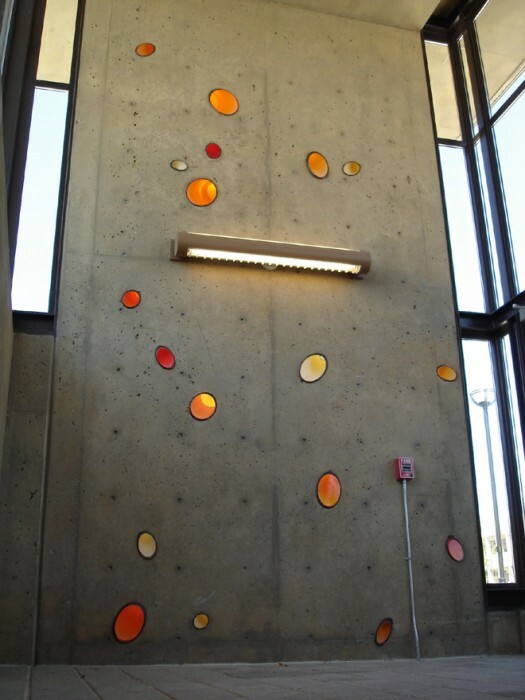 These "skylights" are developed with distinctive color patterns and arangement patterns for each of the 8 stair towers on the Olympia East Capital Campus. 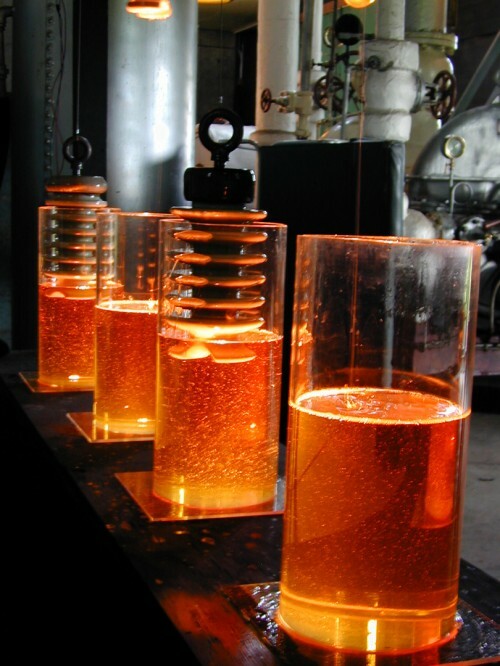 Blue-Green Resin Rods. 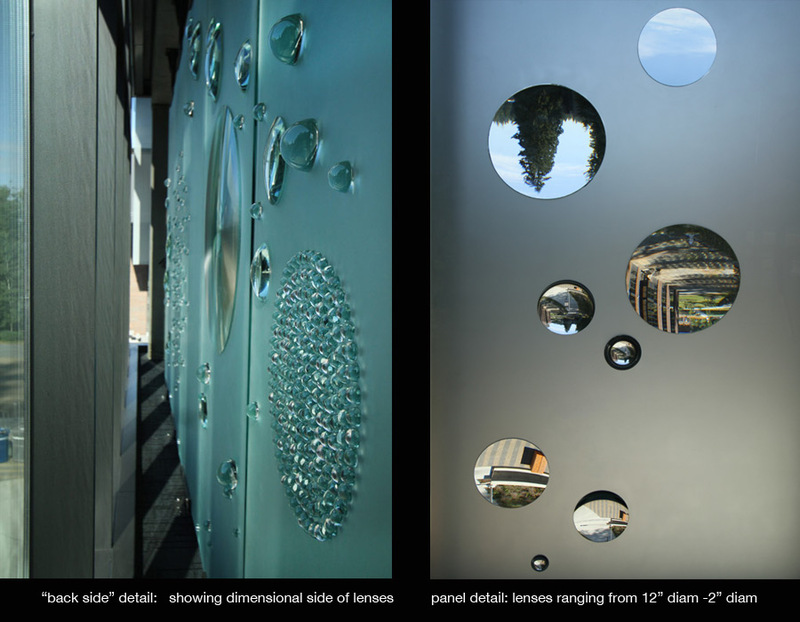 All rods are flush in the "touch zone" and become dimensional above....extending up to 36" beyond the wall. 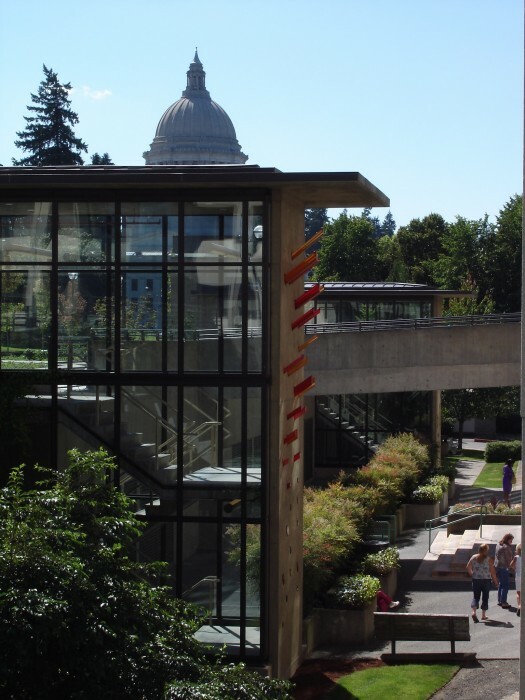 WA State Capital dome in the back. 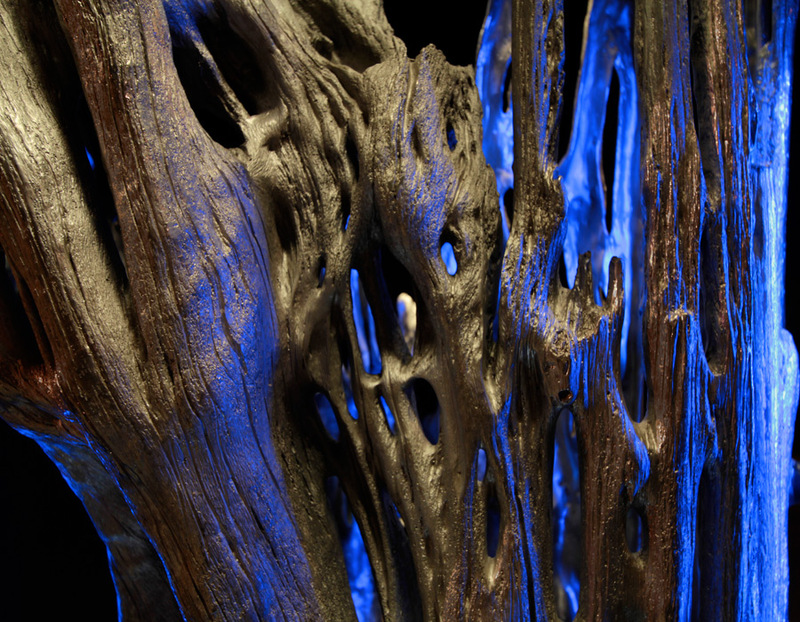 Resin Rods extending out up to 36"
This giant tree was originally harvested in the 1800's from this region. 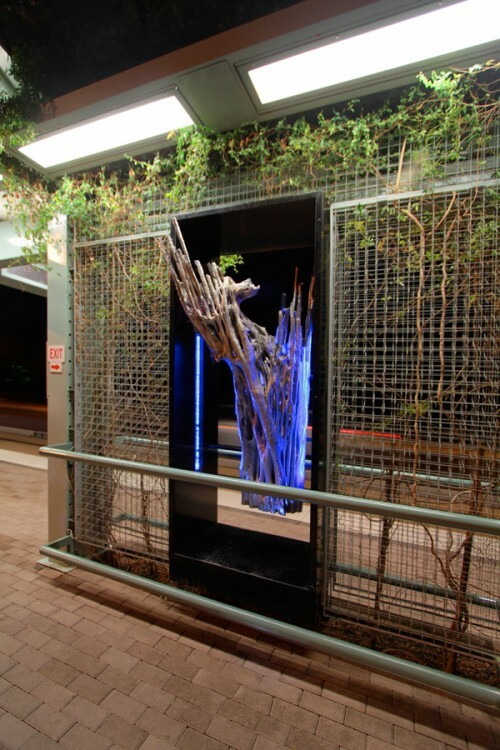 The old growth tree root system is cast in Bronze and treated with a special hematite silver paint. 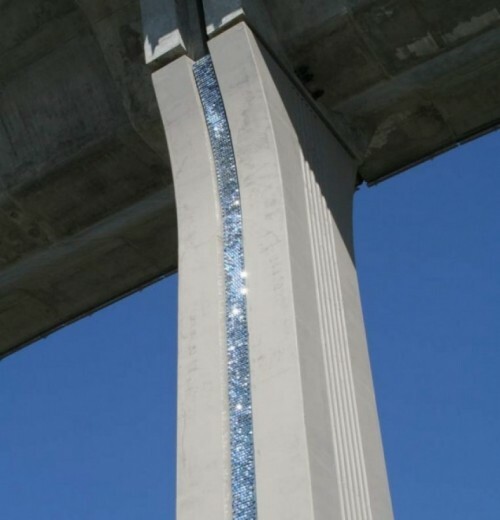 It metaphorically speaks of transparency of government and exposing the hidden infrastructure (hidden roots) of the city (electric, water, sewage etc) and relates to historical/ecological roots of the city. 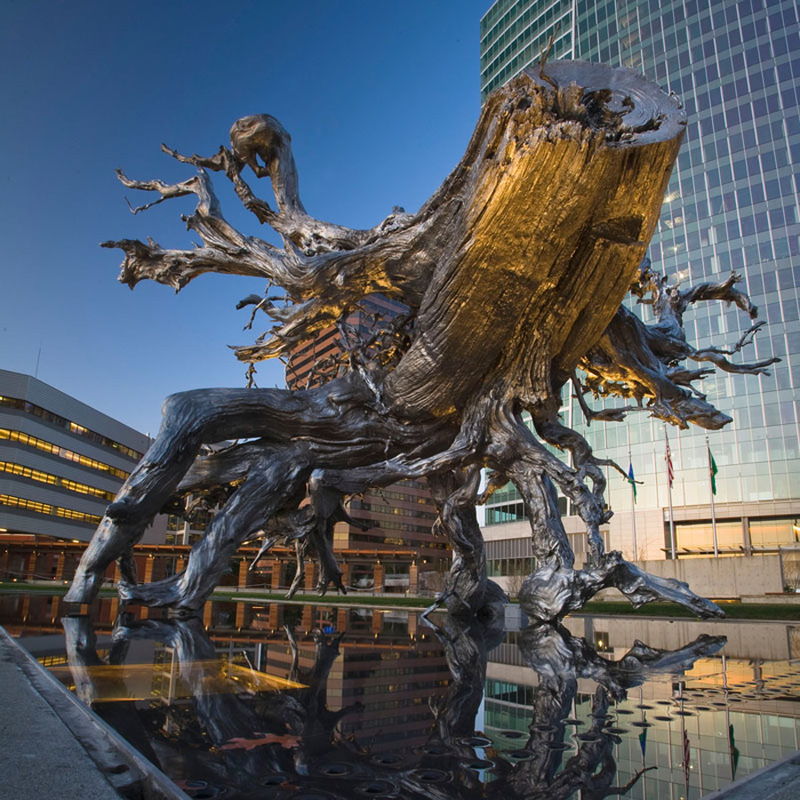 This giant tree was originally harvested in the 1800's from this region. 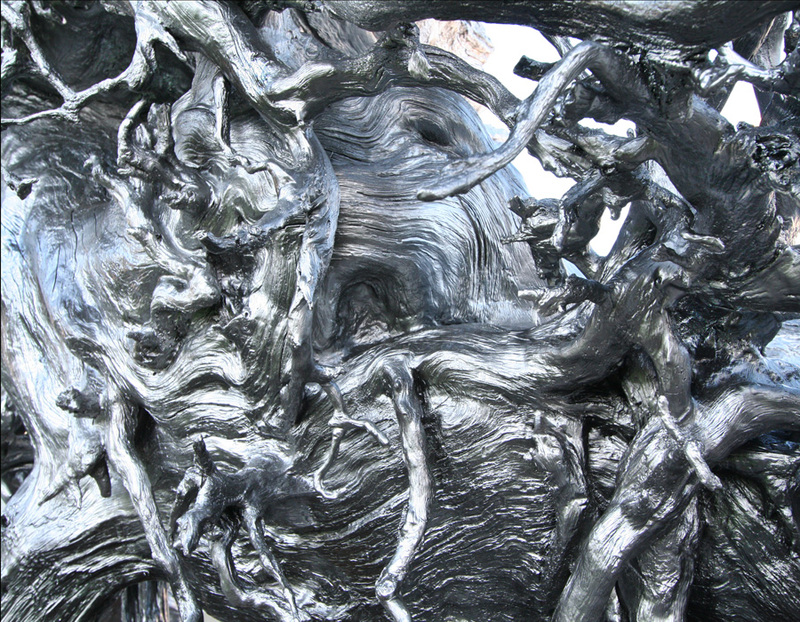 The old growth tree root system is cast in Bronze and treated with a special hematite silver paint. 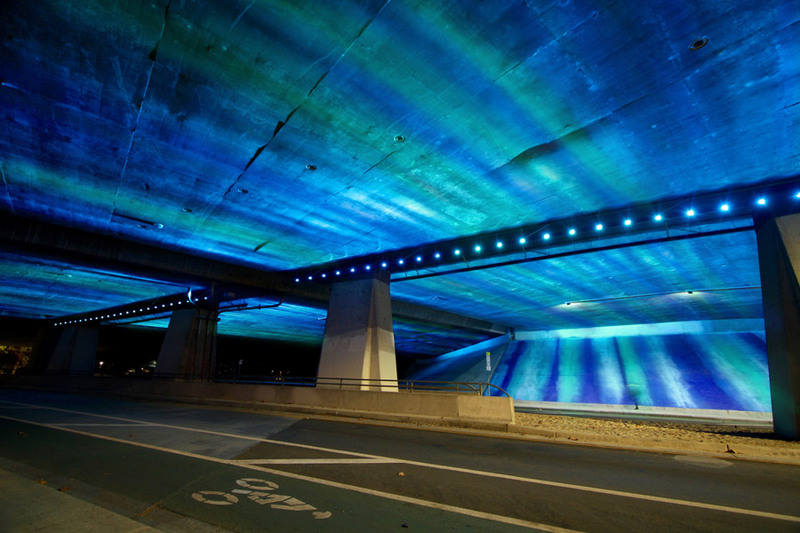 It metaphorically speaks of transparency of government and exposing the hidden infrastructure (hidden roots) of the city (electric, water, sewage etc) and relates to historical/ecological roots of the city. 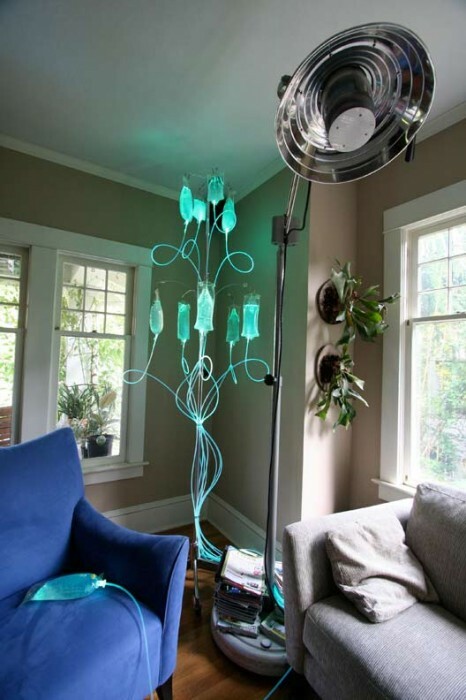 A companion piece directly behind it is a living Nurse Tree. 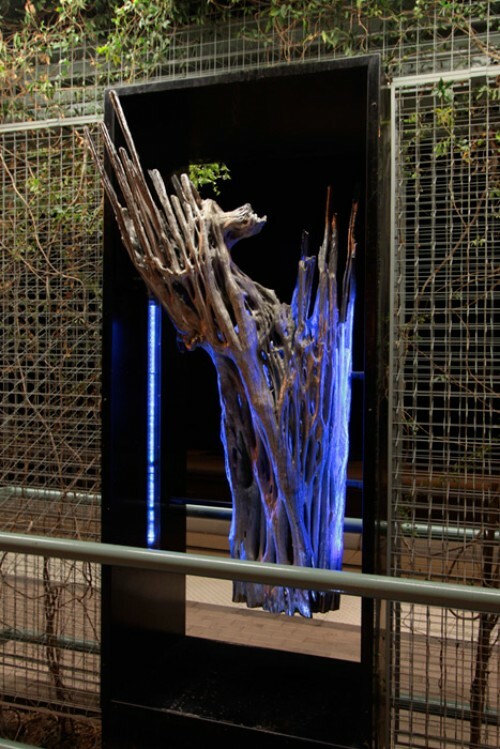 A companion piece directly behind the bronze root is a living "nurse log" tree. 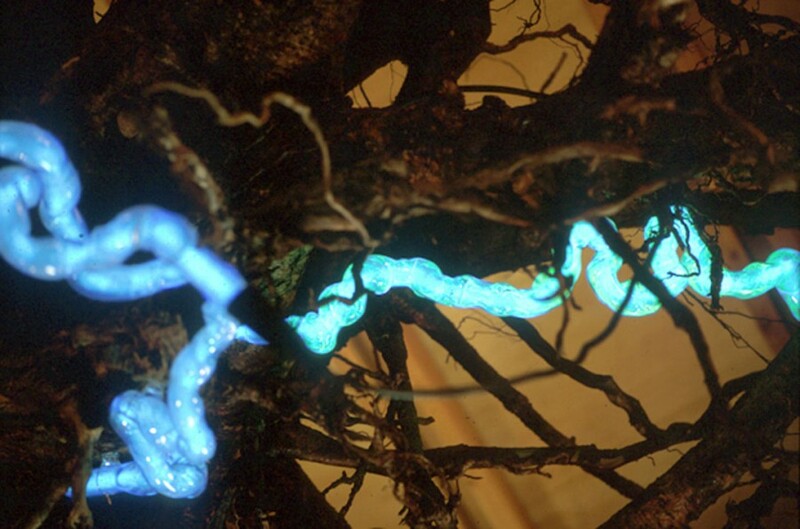 The living tree (growing out of the trunk of an old root stump) will grow and mark time as the silver root is forever frozen in both time and space. 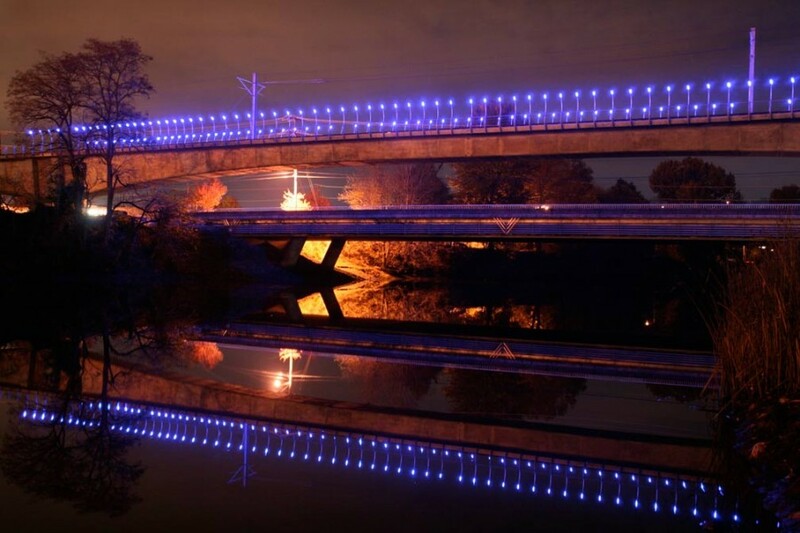 The only Sound Transit light rail crossing over water is celebrated by these blue LED lights turning on as the trains are crossing the Duwamish bridge. 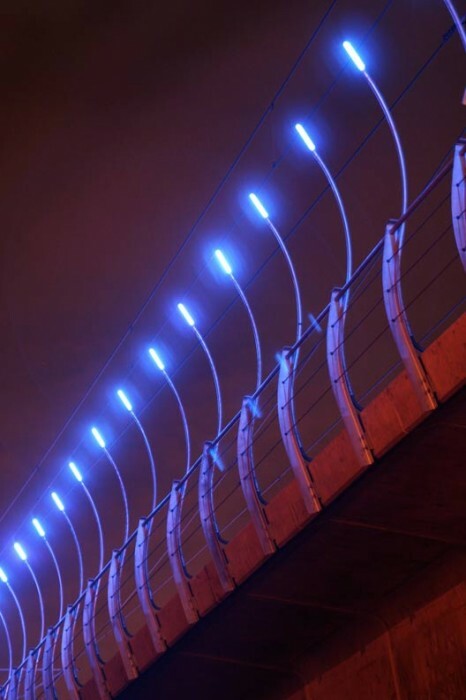 The curving light supports complement the curved safety railing, making reference to wave patterns and salmon ribs. 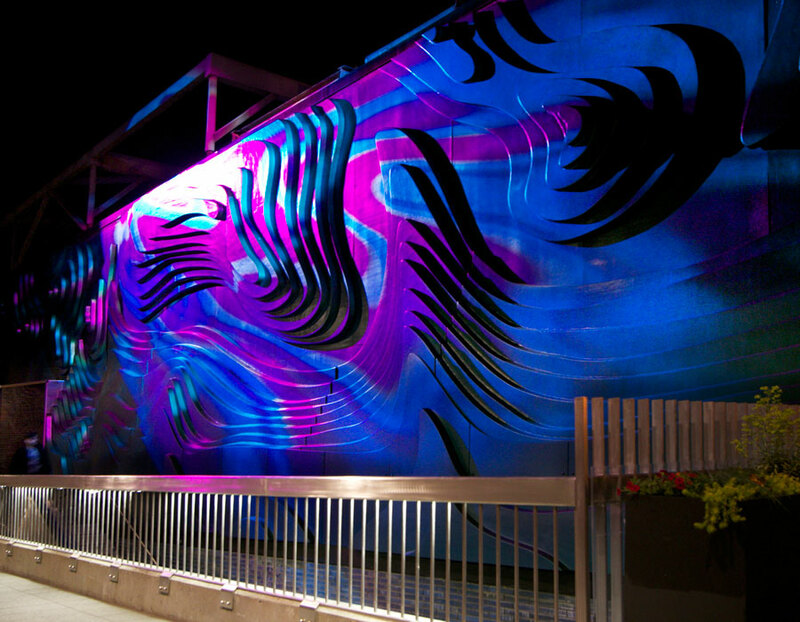 This project was done in collaboration with Norie Sato. 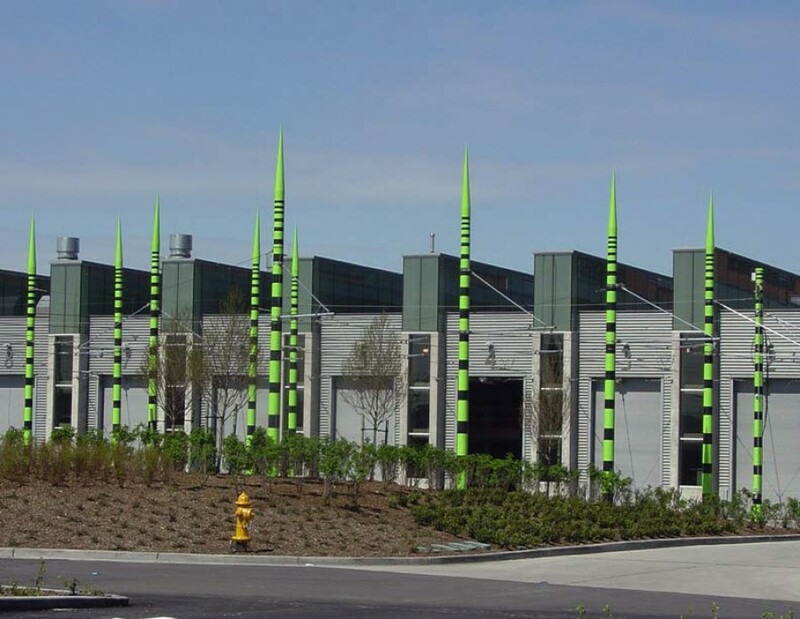 Over 200 Overhead Contact System poles with specialty paint and spire-shaped finials. 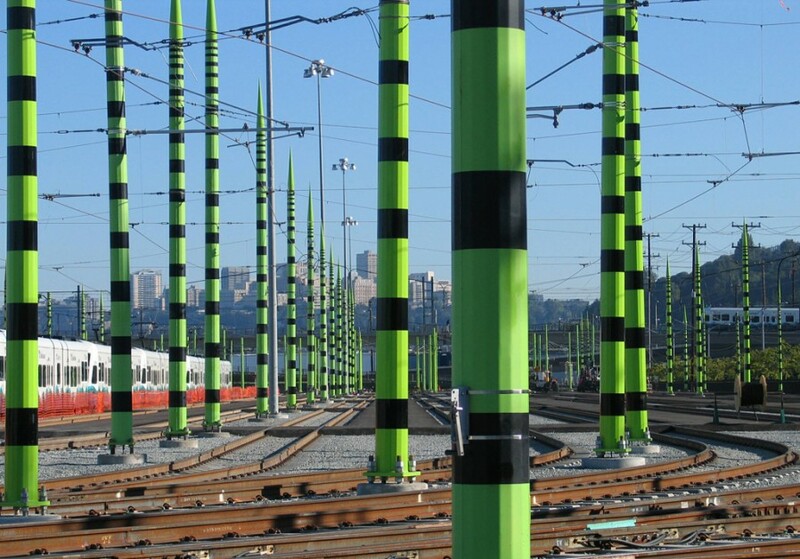 The poles within Sound Transit Maintenance Facility are striped with black and “safety green” paint. 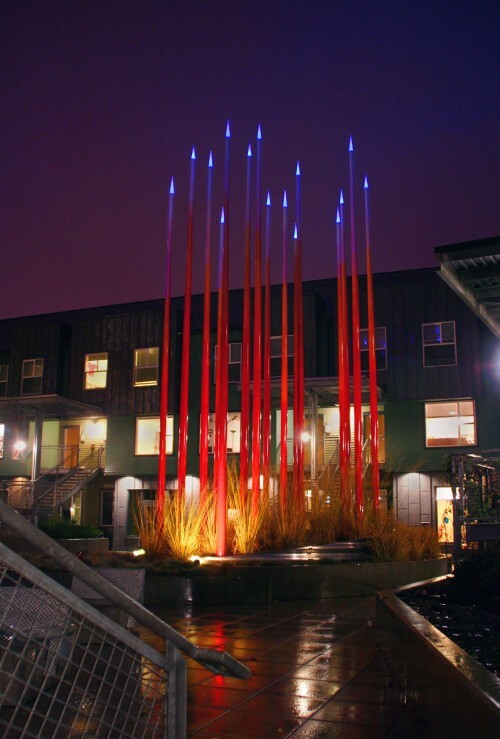 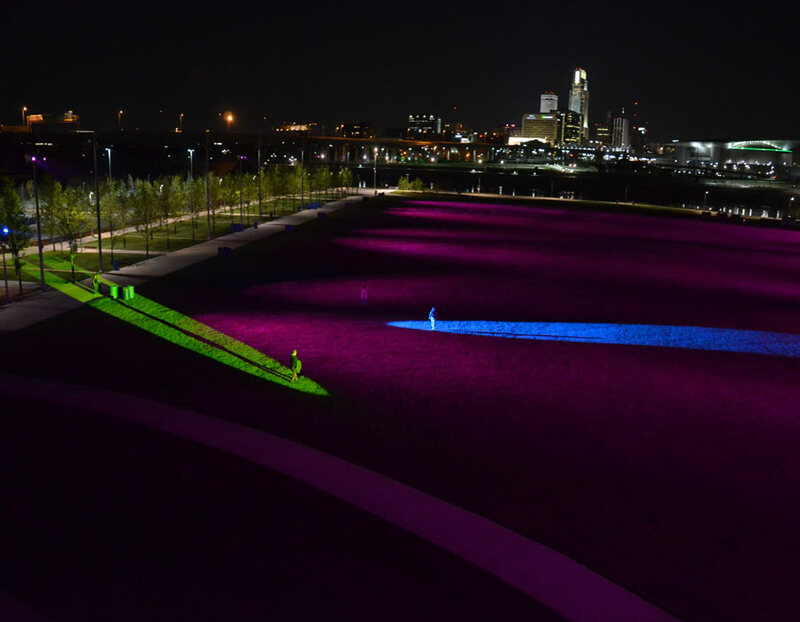 The artwork is inspired by a prehistoric plant indigenous to this region – commonly known as the horsetail or Scouring Rush. 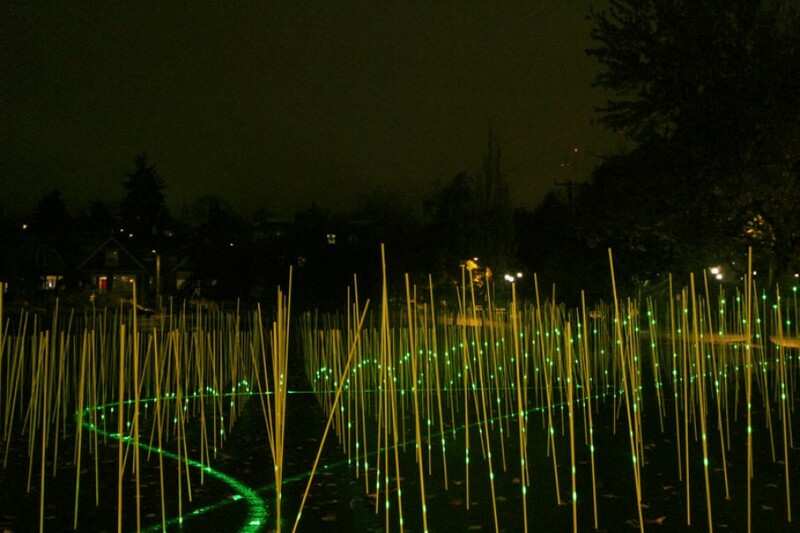 The patterning on the horsetail, along with allusions to bamboo and spring growth seemed evocative of the renewal, maintenance and caring for the system taking place at the facility. 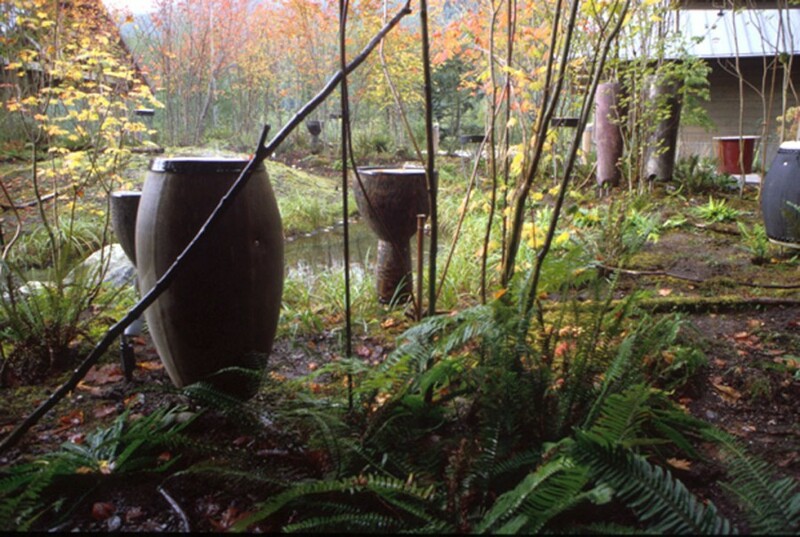 RAIN DRUM COURTYARD Cedar River Watershed Visitors Center, North Bend WA The space between 3 buildings houses a wild overgrown forest floor with a slow moving stream and a canopy of tall, thin and lacy vine maples. 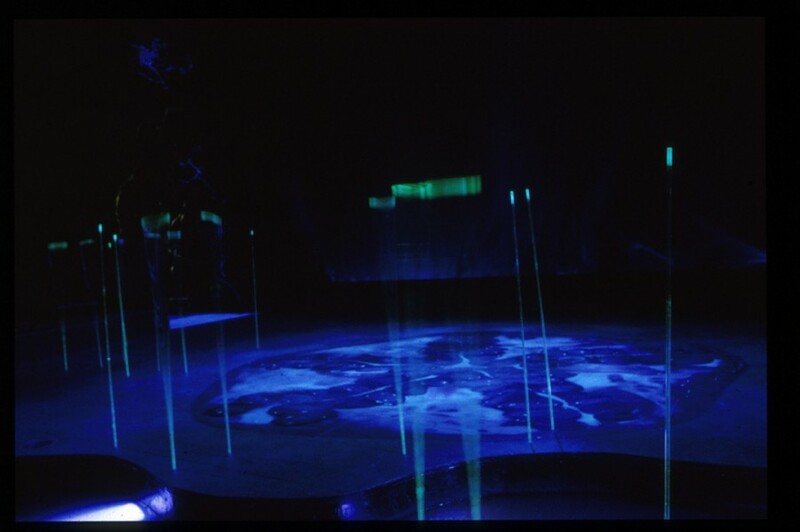 Interspersed between the trees are 17 "rain drums" that play the raindrops as they fall from the sky and drip from the branches. 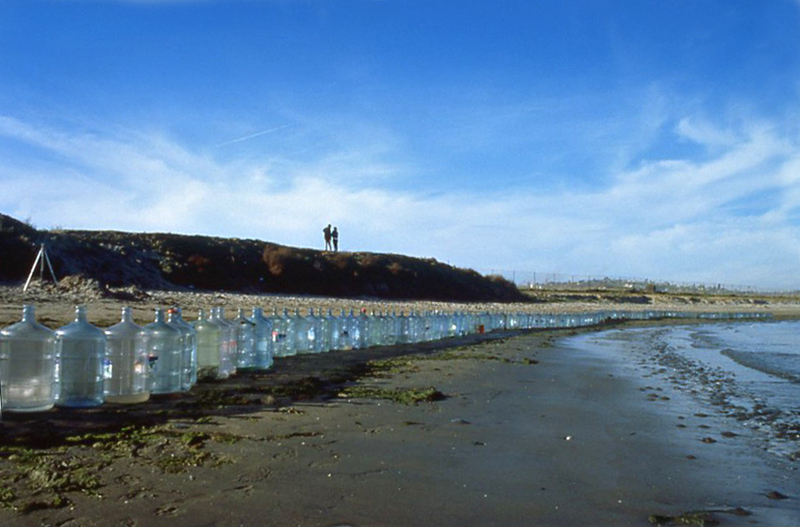 When the sky is dry, there is a set of computer controlled water drippers that create a set of changing rhythms.